Includes international shipping and waterproof casing. 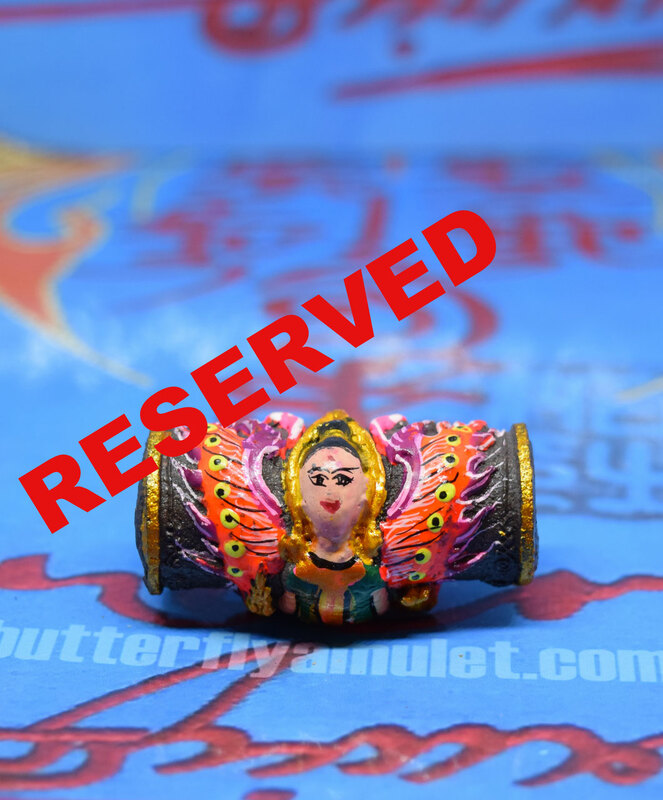 For any further details on payment or shipping please contact WhatsApp, WeChat or Email. 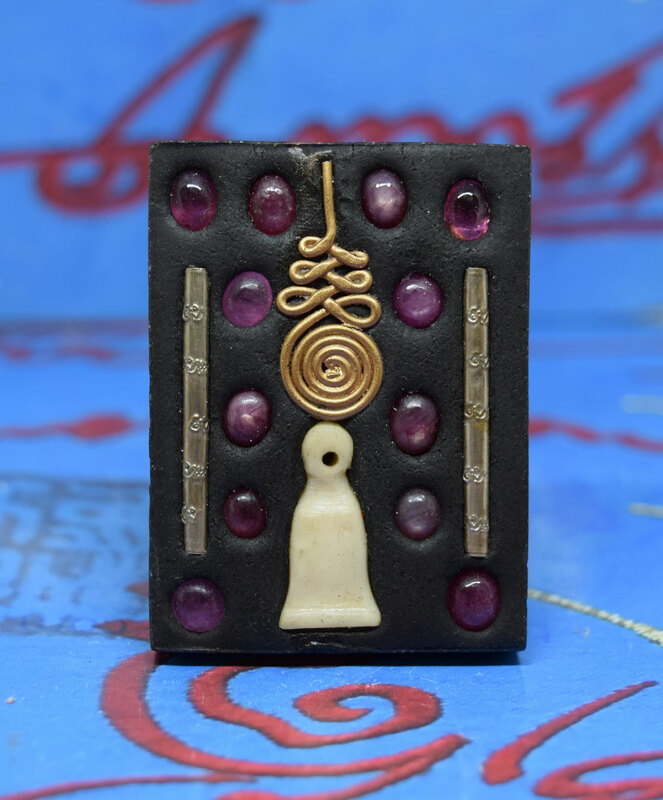 Amulet made from brown powder in 2018 , set in the reverse side crushed gems stones. 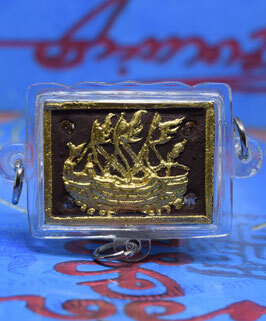 Includes international shipping and waterproof casing . 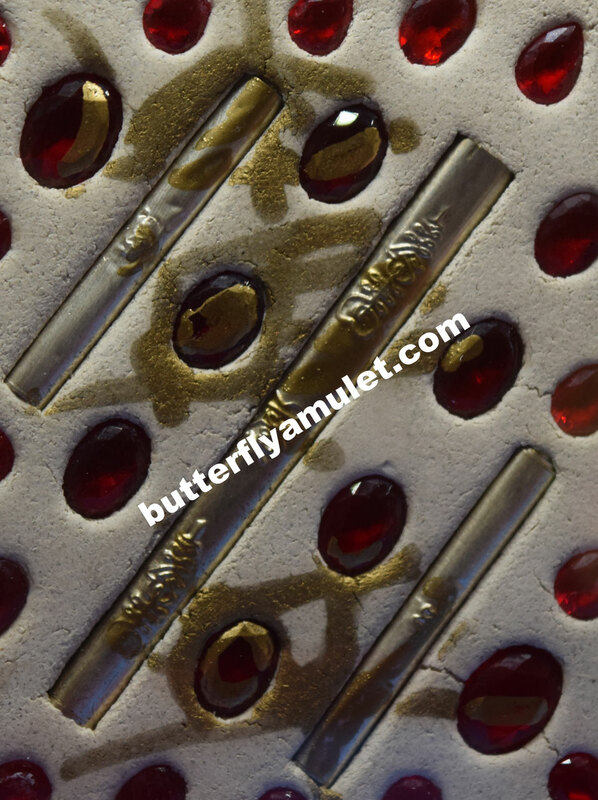 Set around the butterfly nine gems with gold takrat, around a abacus ten gems. 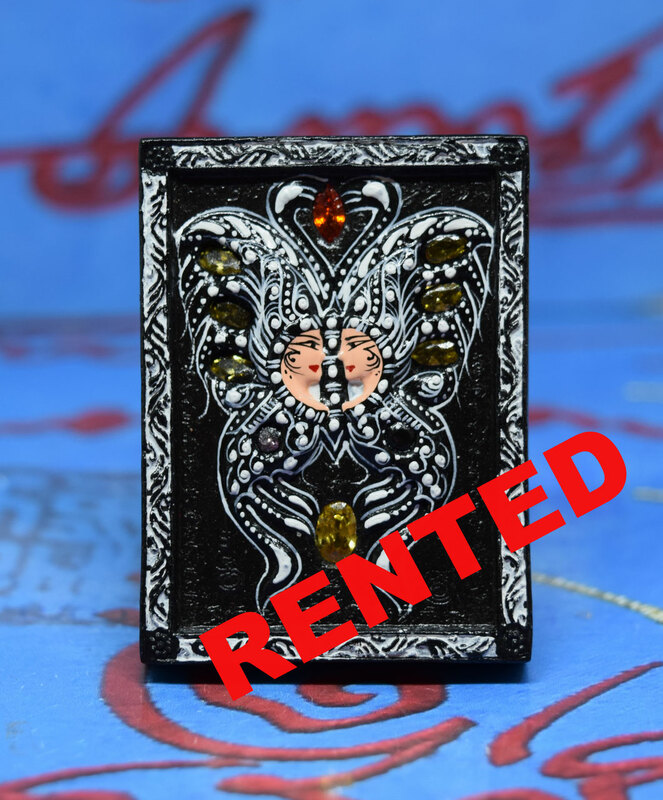 Includes casing and International shipping. 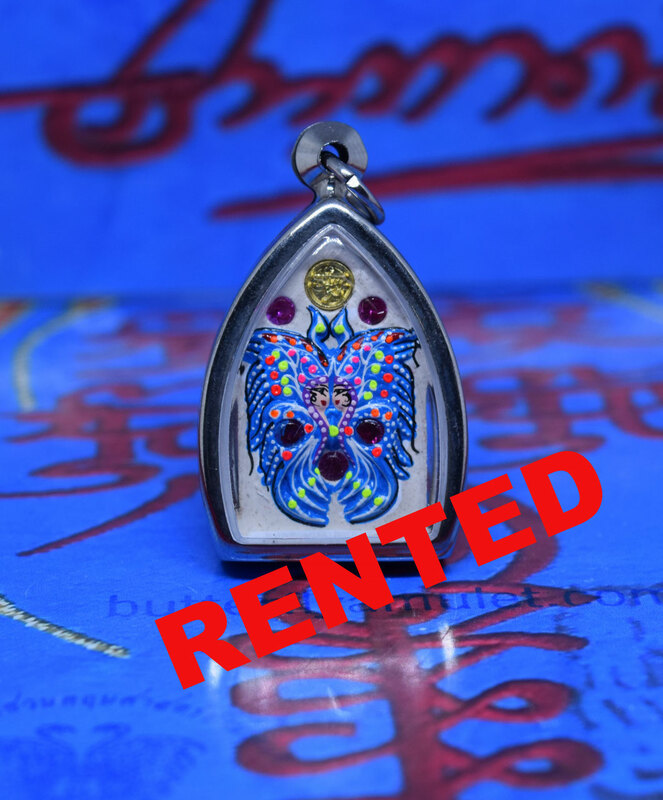 For any further details on payment or shipping please contact WeChat or email. 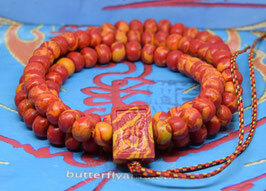 The necklace is made from multi colour powder. 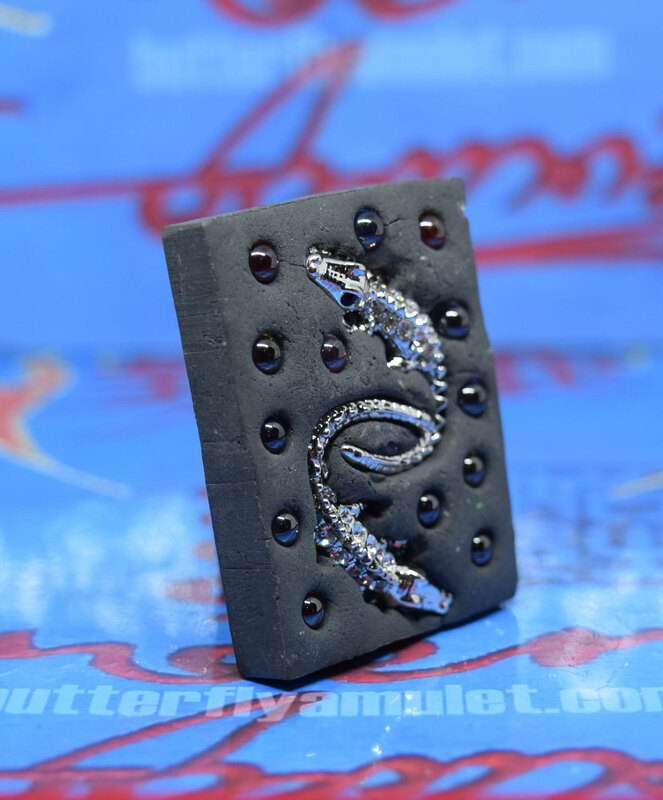 Includes Stainless Casing or if requested waterproof and International Shipping. 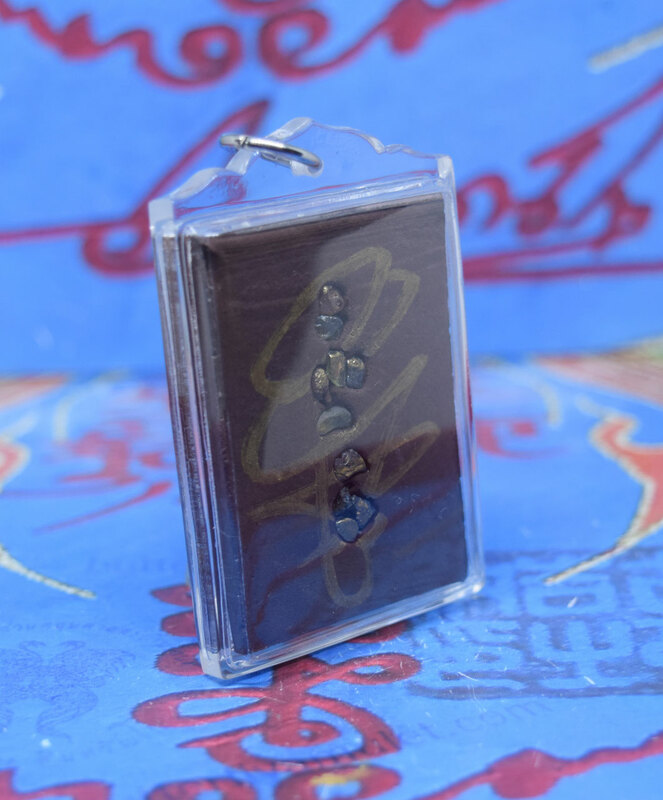 Price includes stainless casing or if requested waterproof casing , certificate and International Shipping. 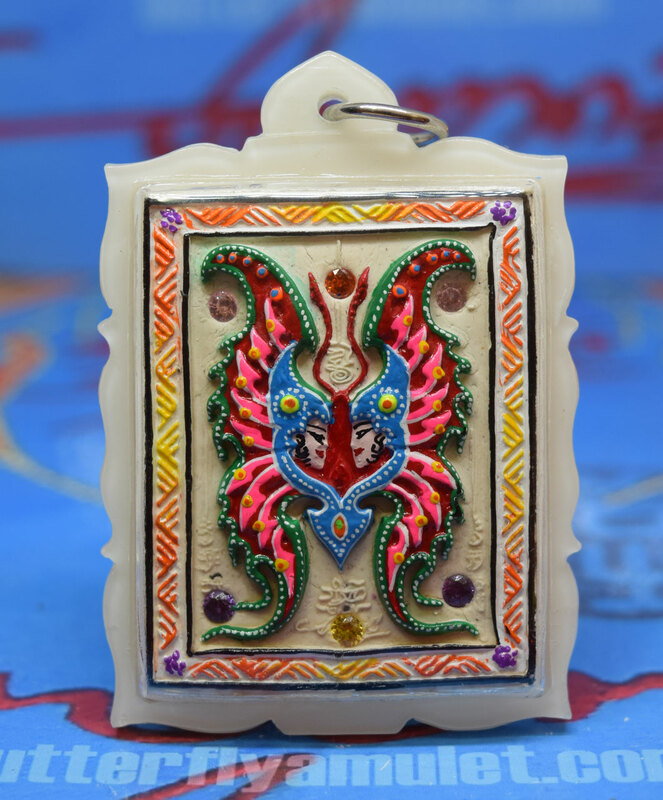 Around gold butterfly shield three gems , set in the reverse side around a micro gold Sampao Jao are ten gems with two takrat and a temple. Price includes international shipping and stainless casing. 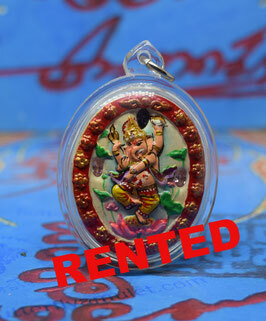 Includes waterproof casing and International Shipping. 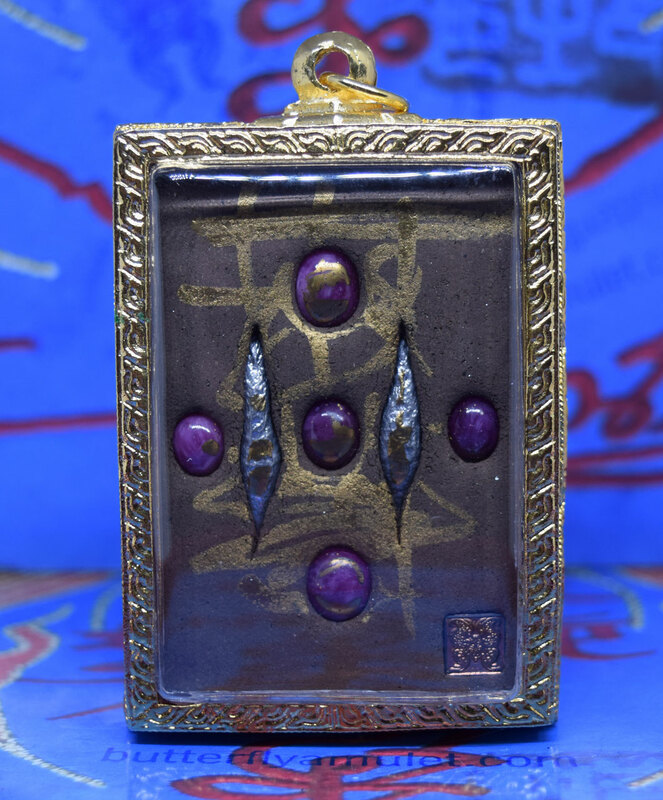 Shield with nine gems, two takrats and a Kruba locket. 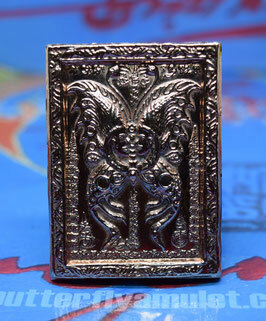 Price includes international shipping with stainless casing and certificate . 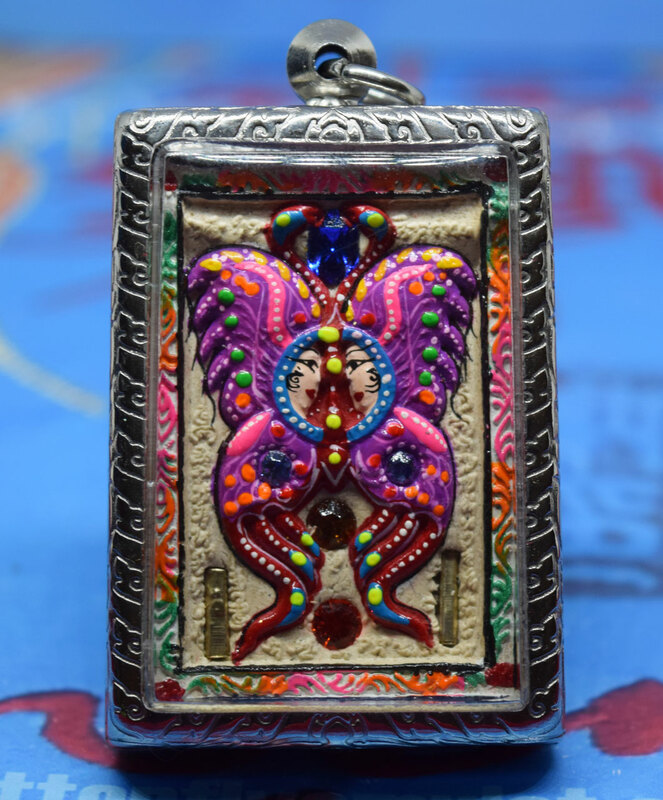 Kruba Medallion with hair and robe , Painted Butterfly. 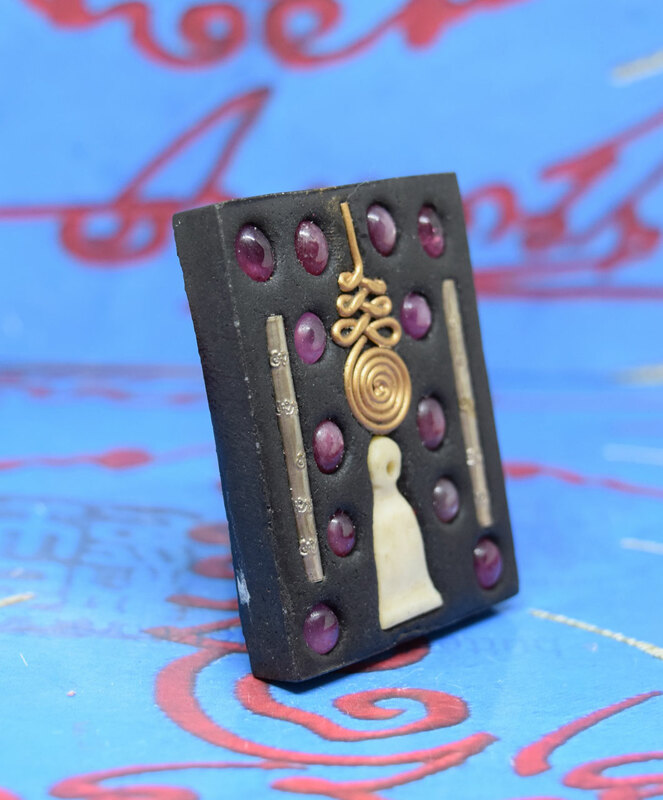 red gems and two silver takrats. 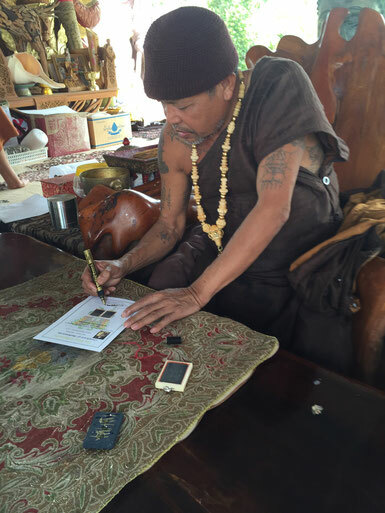 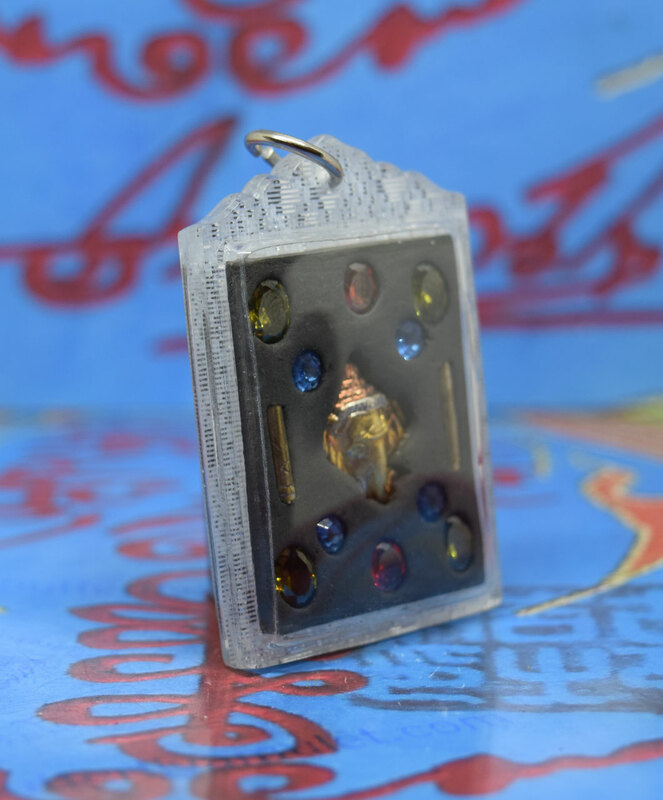 Bell Amulet to celebrate the 61st Birthday Kruba Krissana. 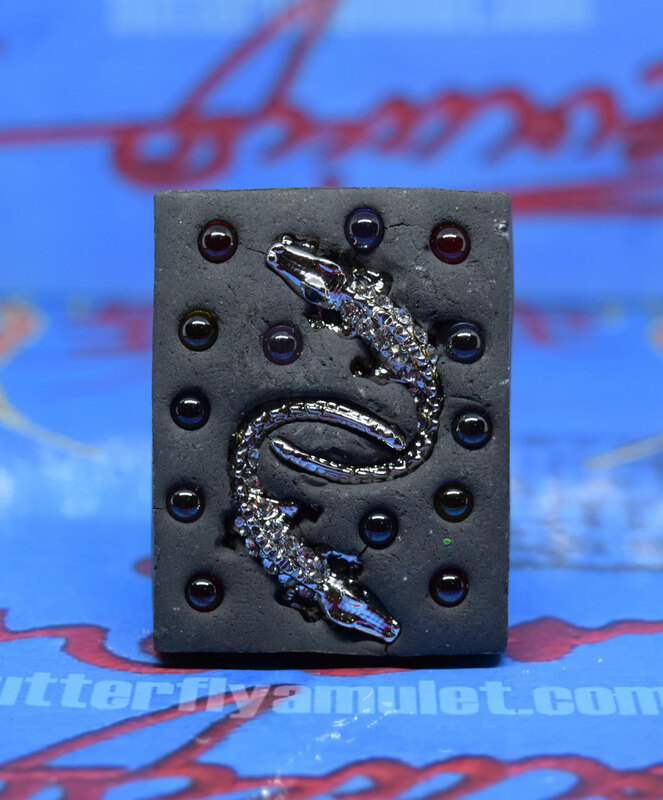 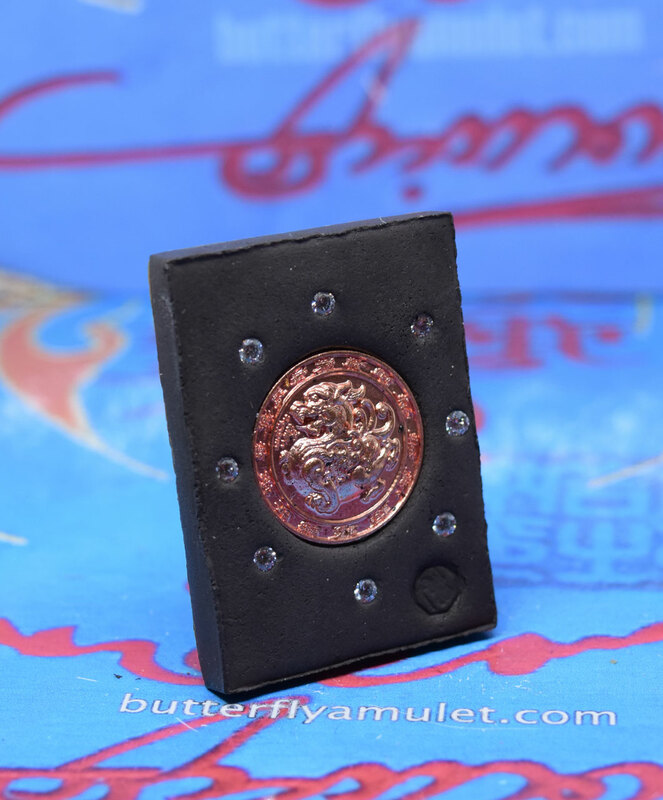 Amulet made from black powder in 2018 , set in around the butterfly eleven gems and two takrats, set in the back a two takrats and twelve gems around Phra Phrom. 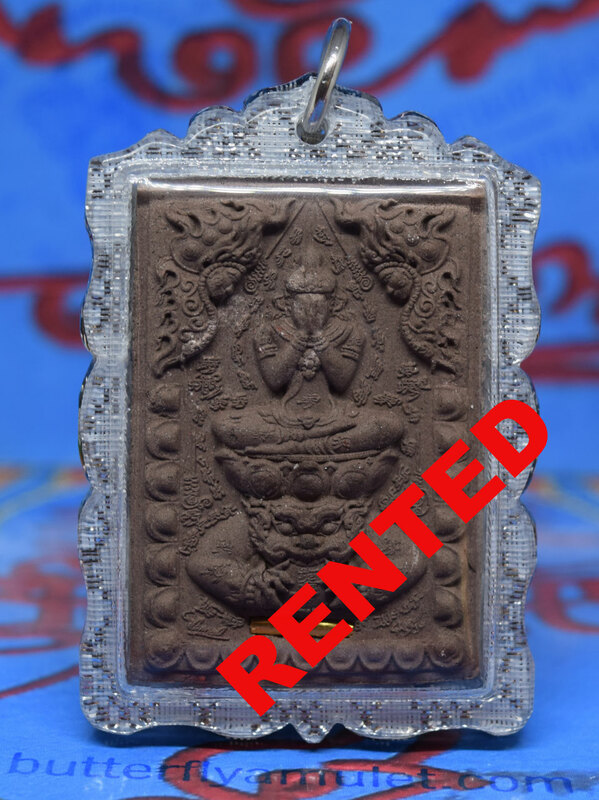 Includes international shipping and stainless casing or waterproof if requested. 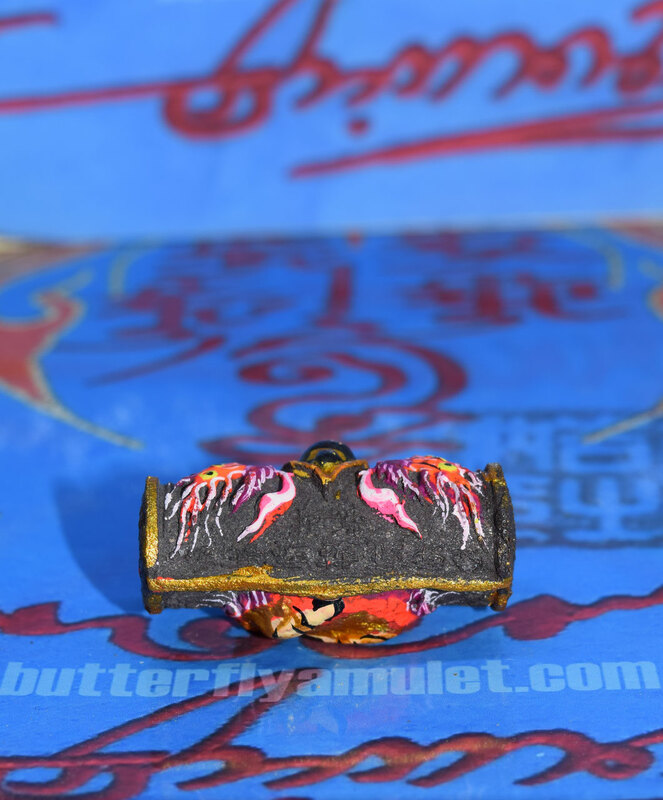 Amulet is approximately 51mm x 39mm made from black powder in 2016, BE2561. 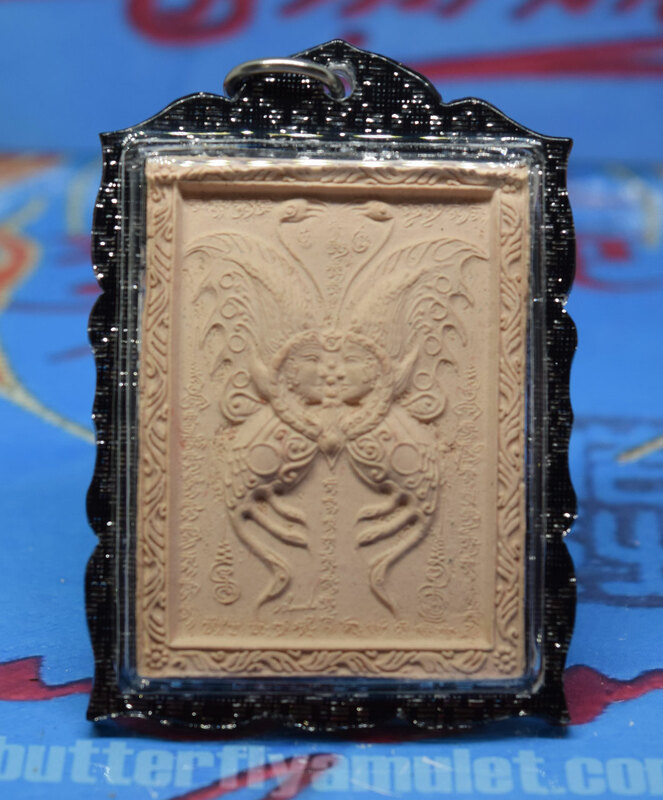 This amulet made from white powder in 2018. 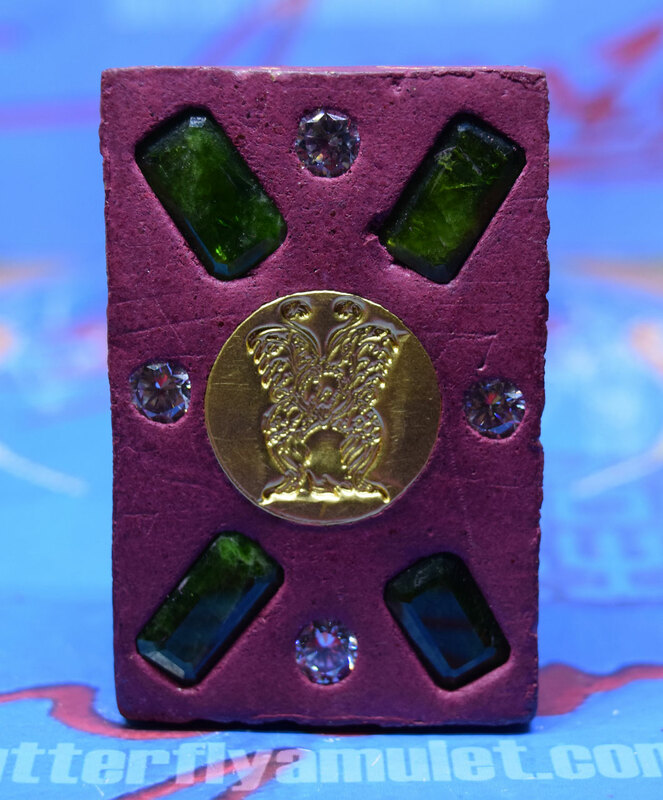 Around the salika eighteen gem stones and butterfly seal. 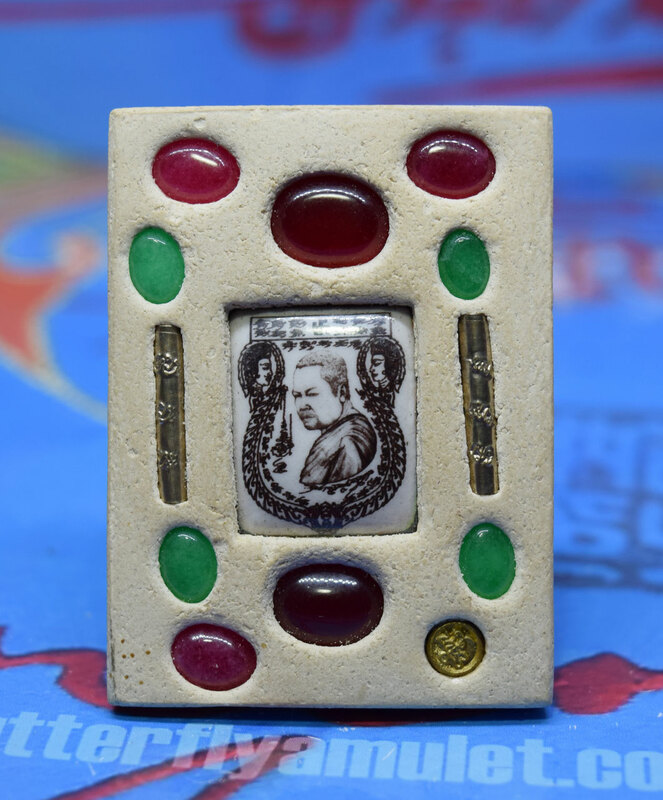 Set in the reverse side twenty four red gem stones with three takrats. 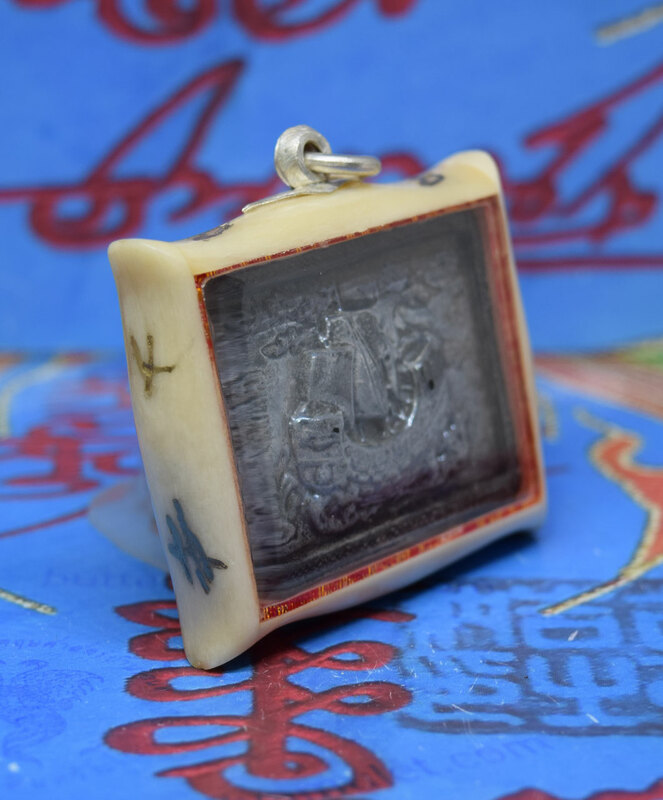 This amulet made from white powder in 2017. 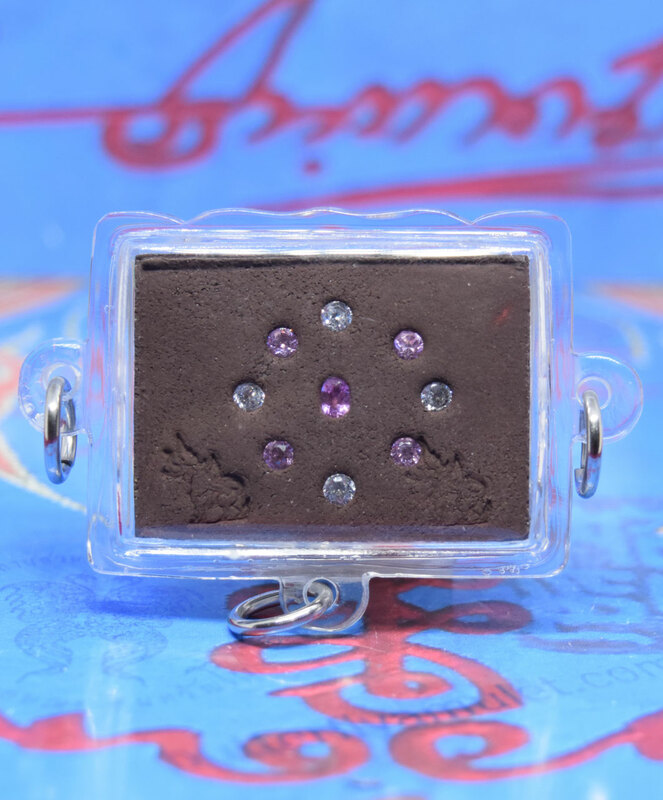 Around the salika six gem stones and a takrat. 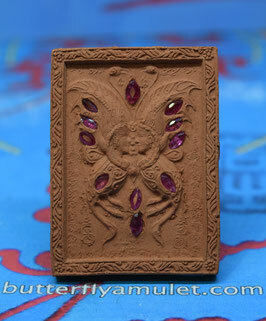 Set in the reverse side three red gems stone with a two small gems . 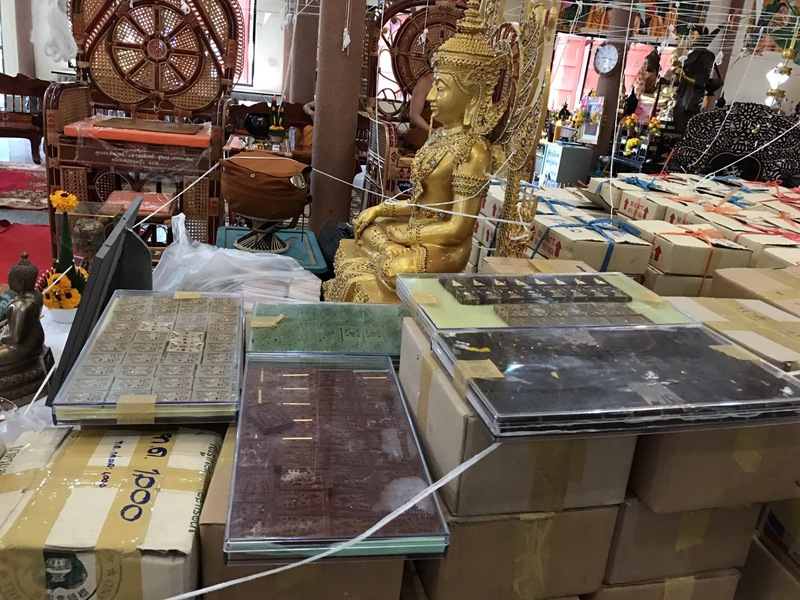 International shipping and stainless casing. 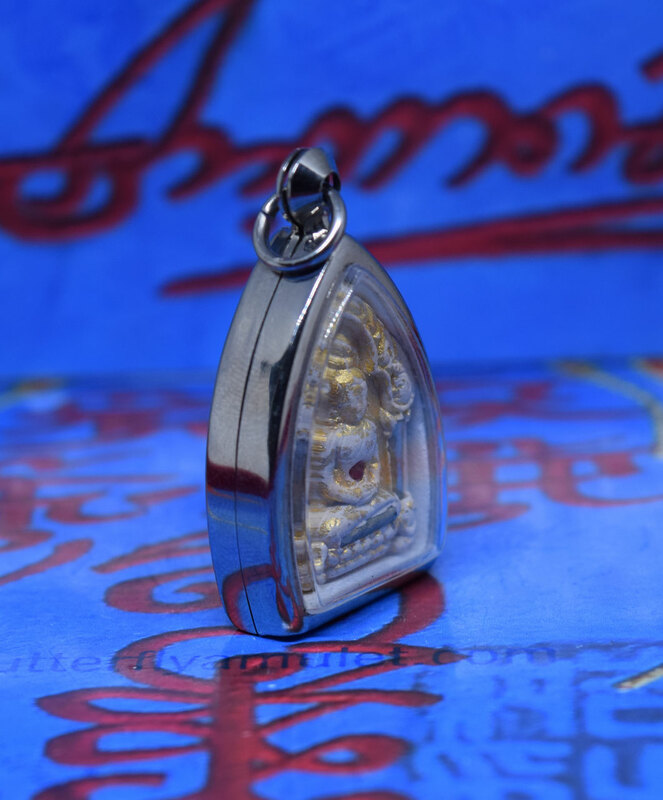 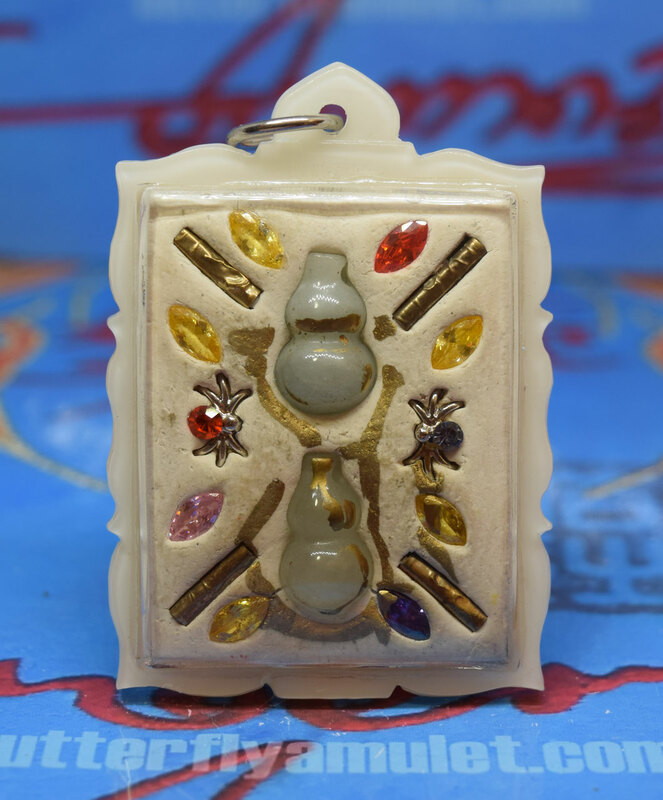 Amulet is approximately 42mm x 32mm made from white powder with four gems set in the front and twelve gems in the back with four takruts around Ganesha. 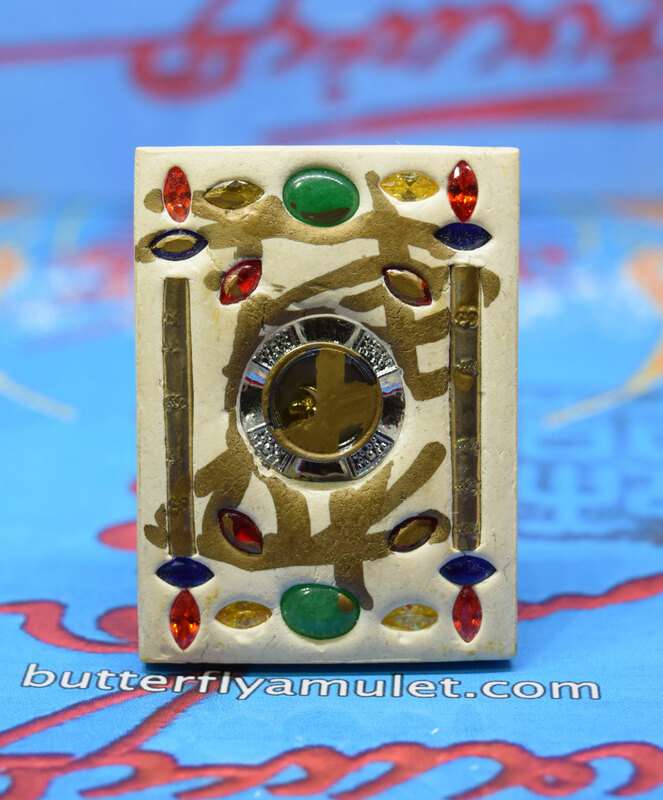 Amulet is approximately 42mm x 32mm made from white powder in 2015 with three gems set in the front and a single green gem in the back with two takruts . 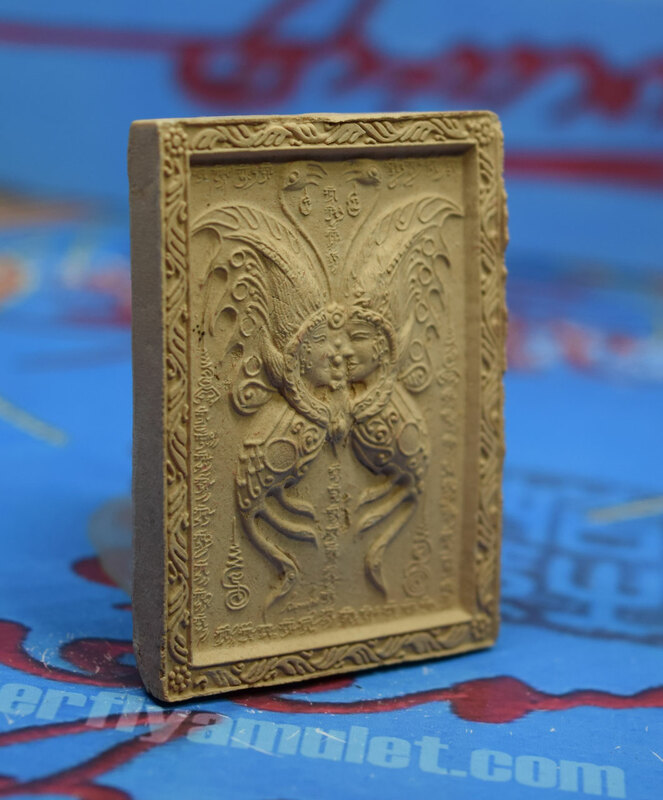 Sampao Jao is approximately 40mm x 30mm made from brown powder in 2017, BE2560. 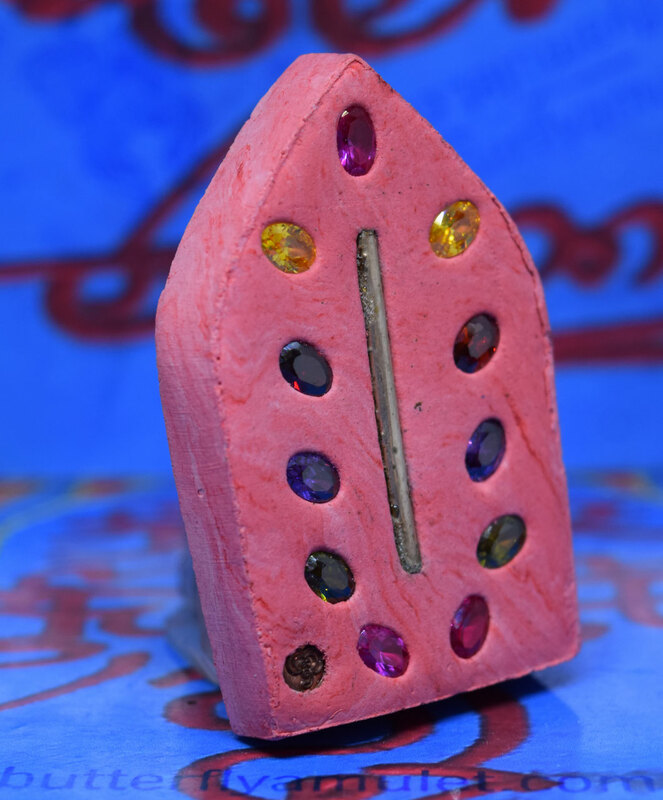 Set around the ship four gems , on the reverse side nine gems . 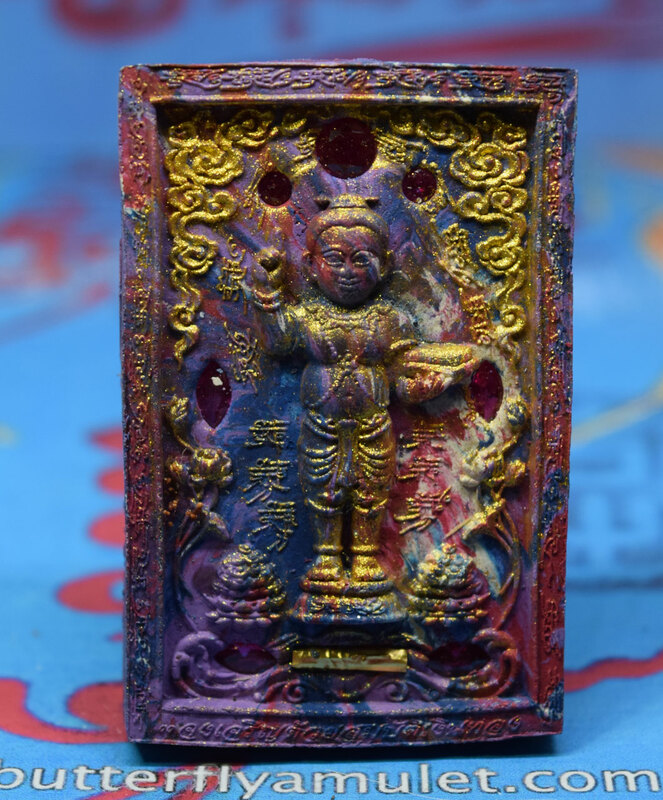 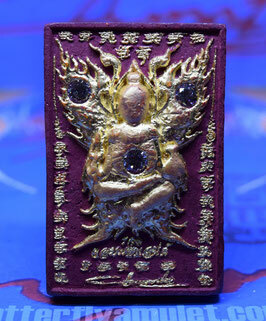 This amulet made from mixed powder in 2019 . 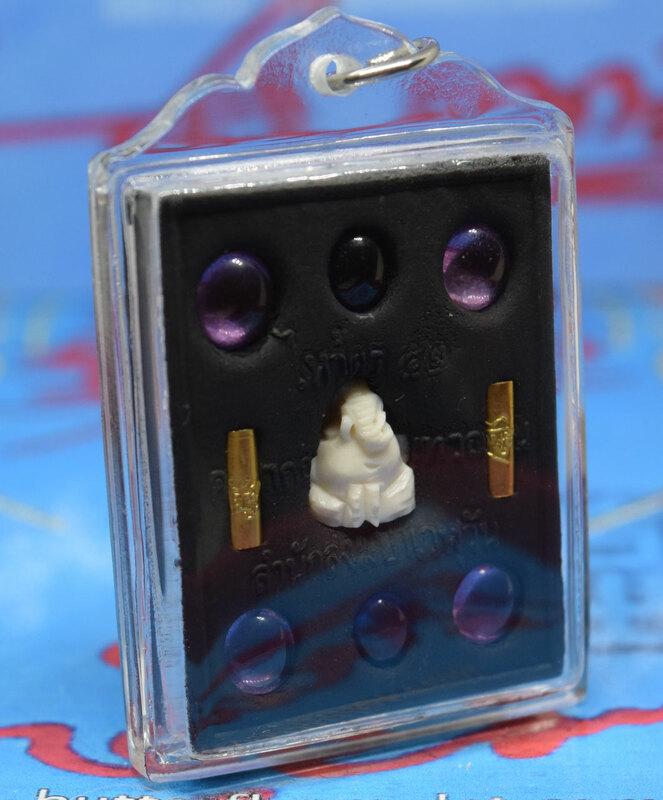 For any further details on payment or shipping please contact WeChat WhatsApp or Email. Limited Edition Amulet is approximately 55mm x 41mm Sampao Jao made from two Black Minerals. 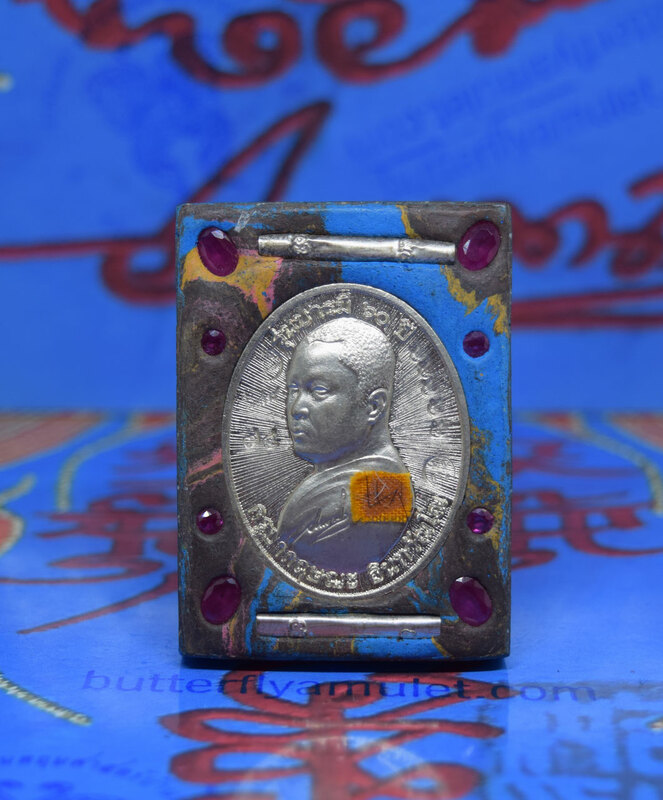 On reverse Kruba Yant and signature. 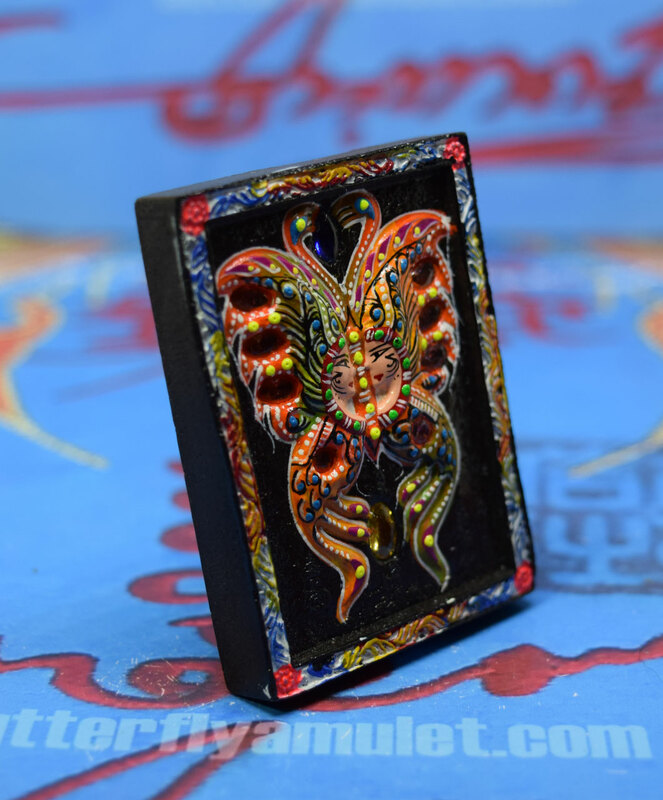 On the casing edges Kruba engraved Yant. For any further details on payment or shipping please contact Whats App, WeChat or Email. 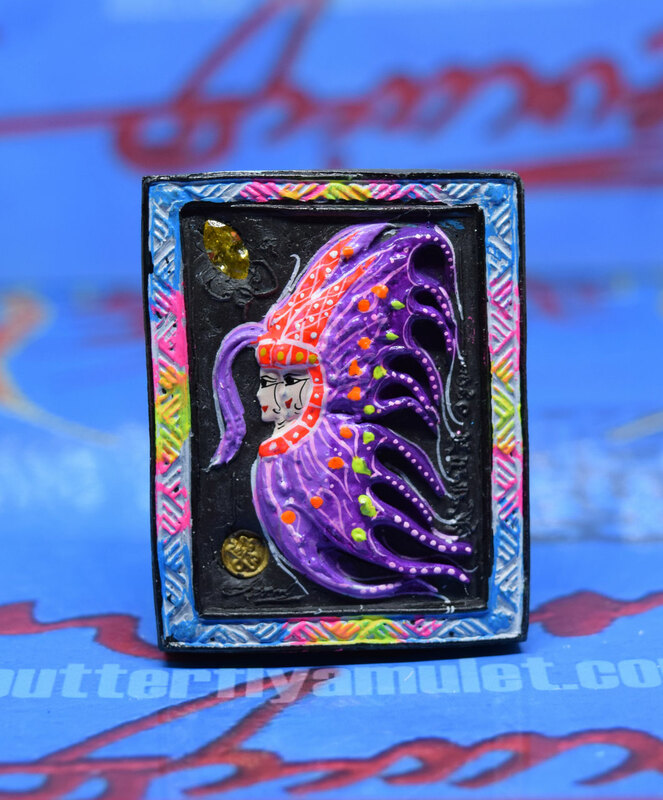 Amulet is approximately 50mm x 37mm made in 2016 BE2558 from six colours powder. 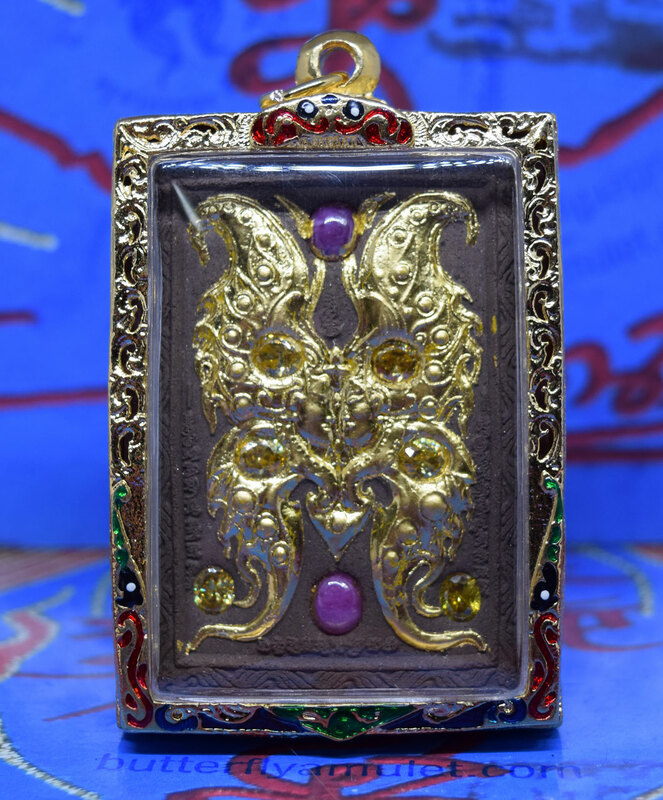 Set around the butterfly are five gems , two takrats and two temple seals and on the reverse side Kruba with four large red gems and twelve gems . 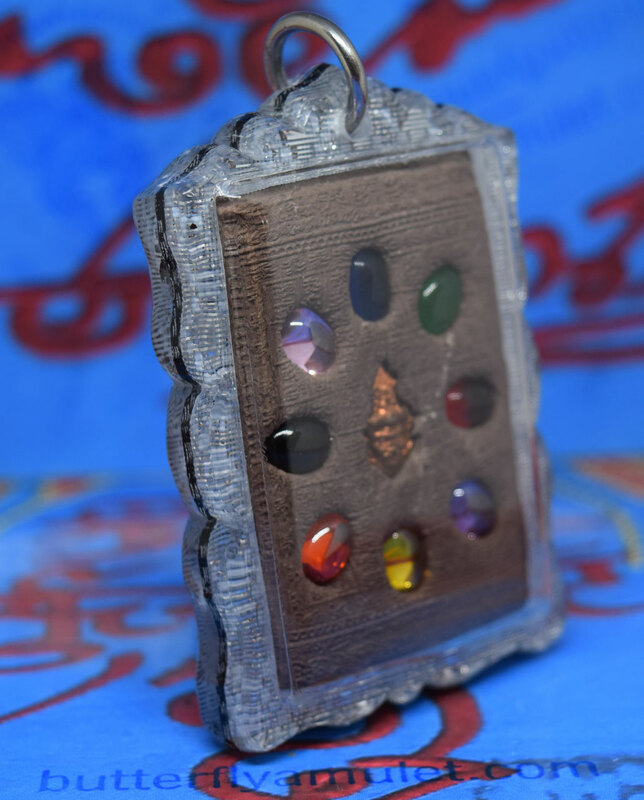 Handmade waterproof casing made from polished hardwood . 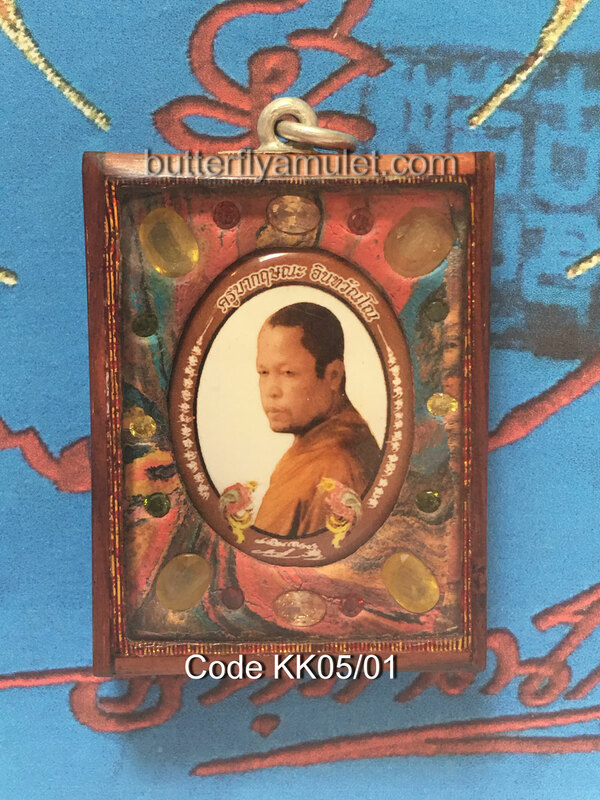 Buy Now online store Code KK05/01 for any further details on payment or shipping please contact WeChat or email. 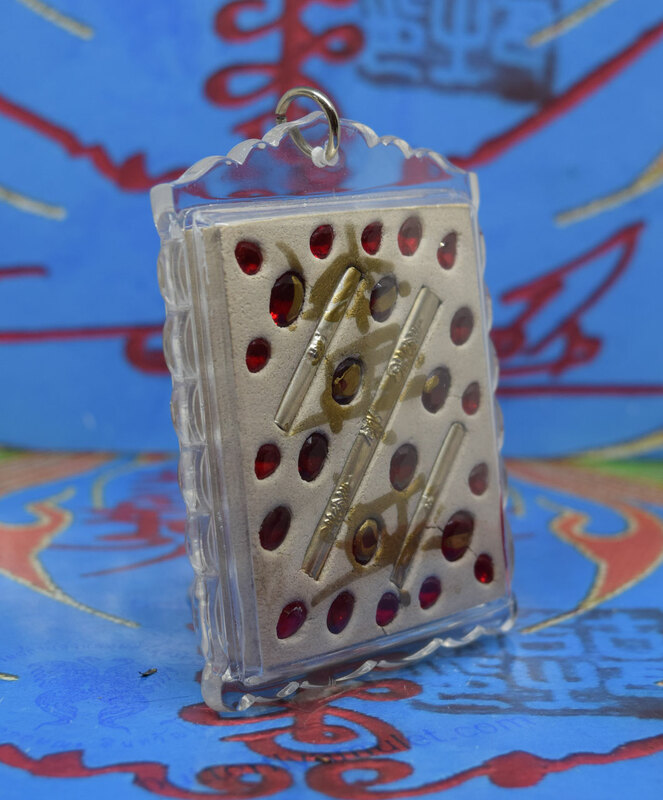 Includes stainless casing or if requested waterproof casing and International Shipping. 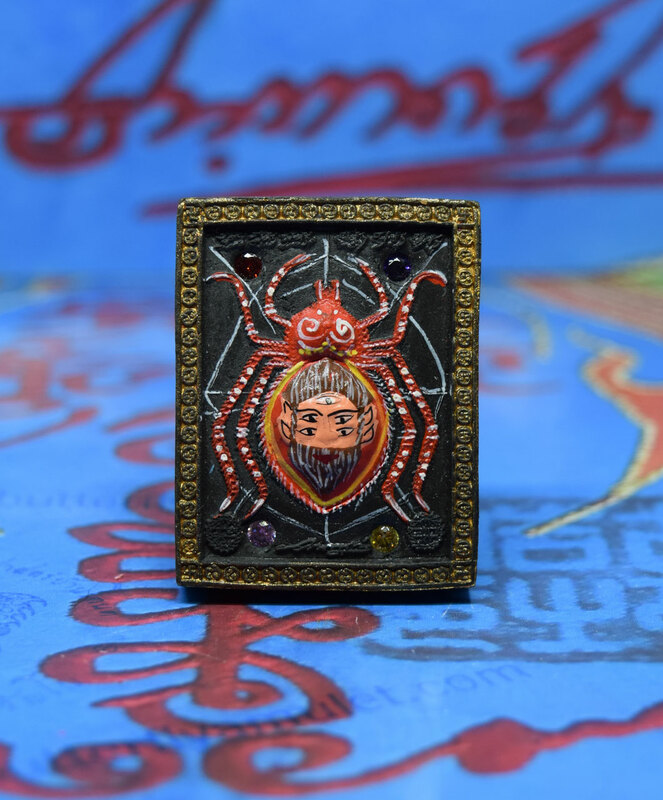 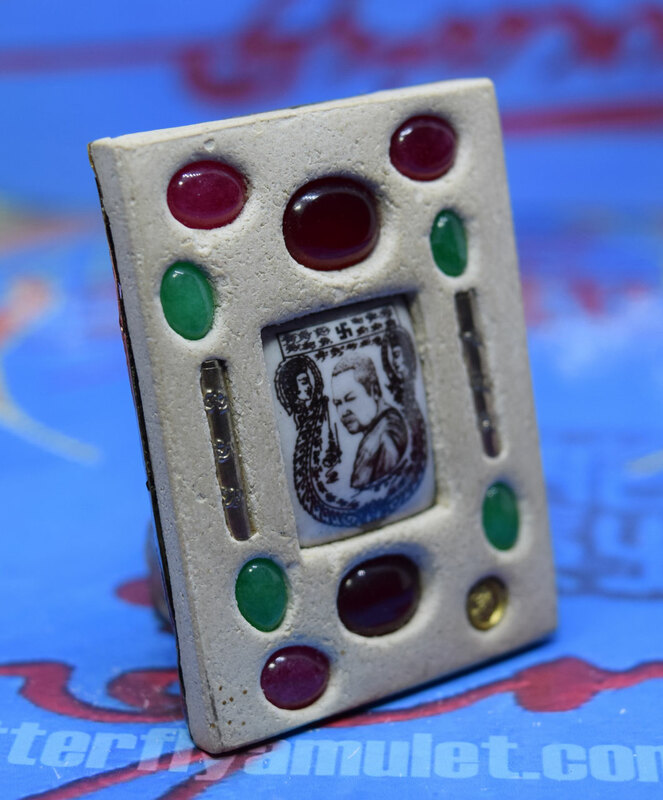 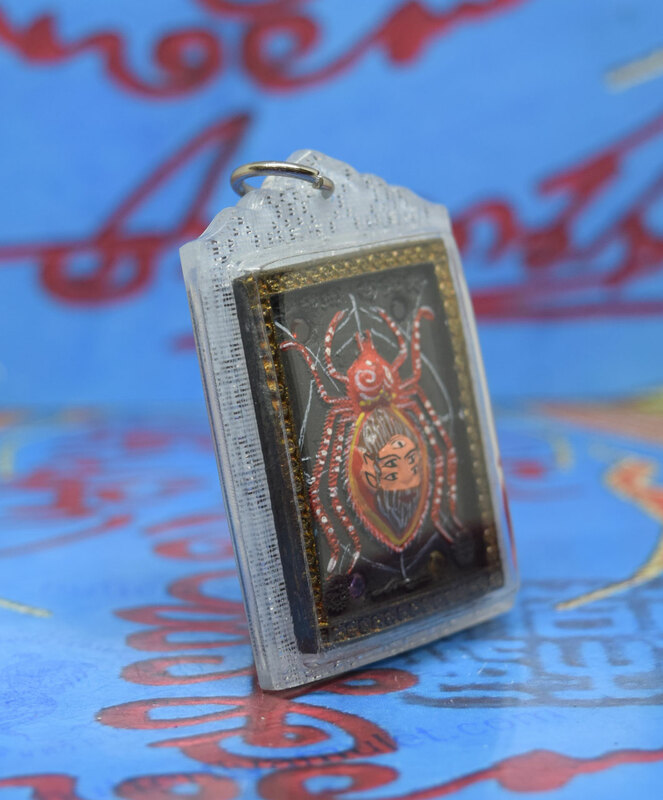 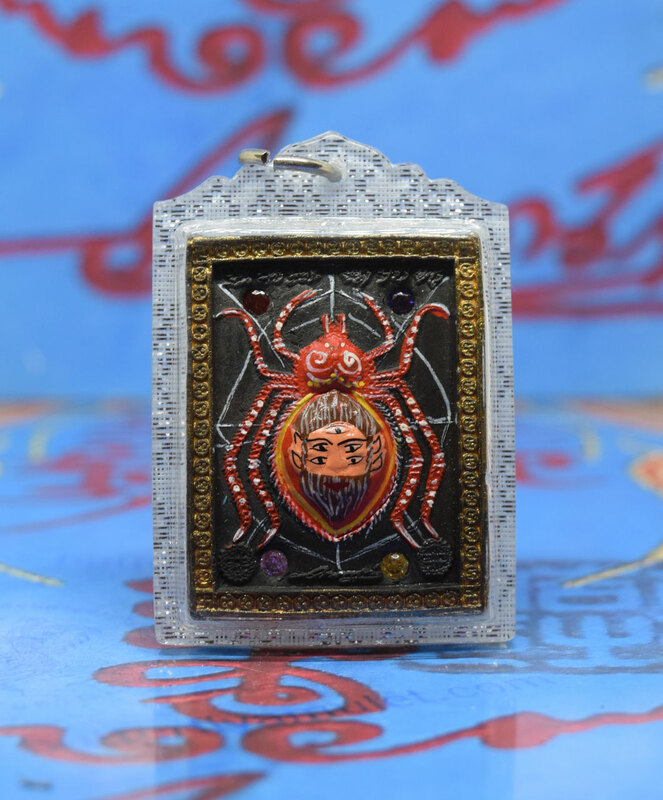 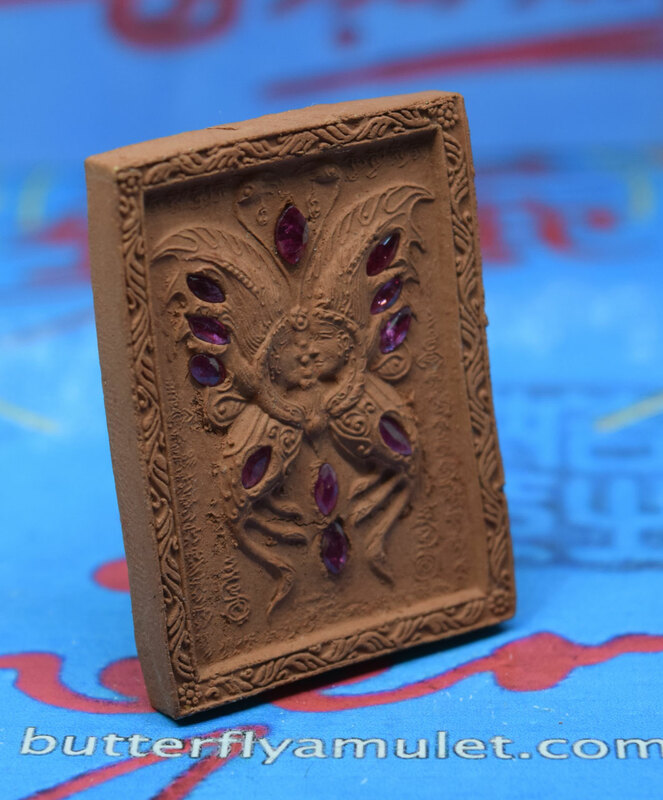 This amulet is approximately 60mm x 40mm made from mixed powder in 2018, only 48pcs . 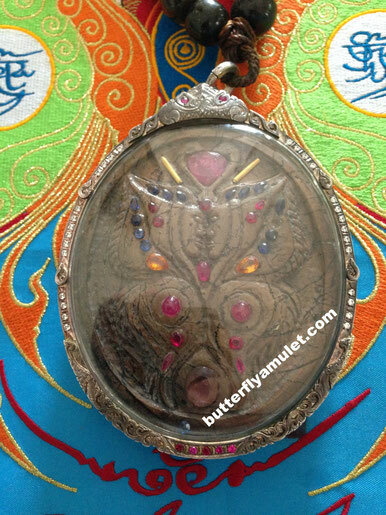 Set around the Baby are three gems , set in the reverse side a gold butterfly with four jade , four gems. 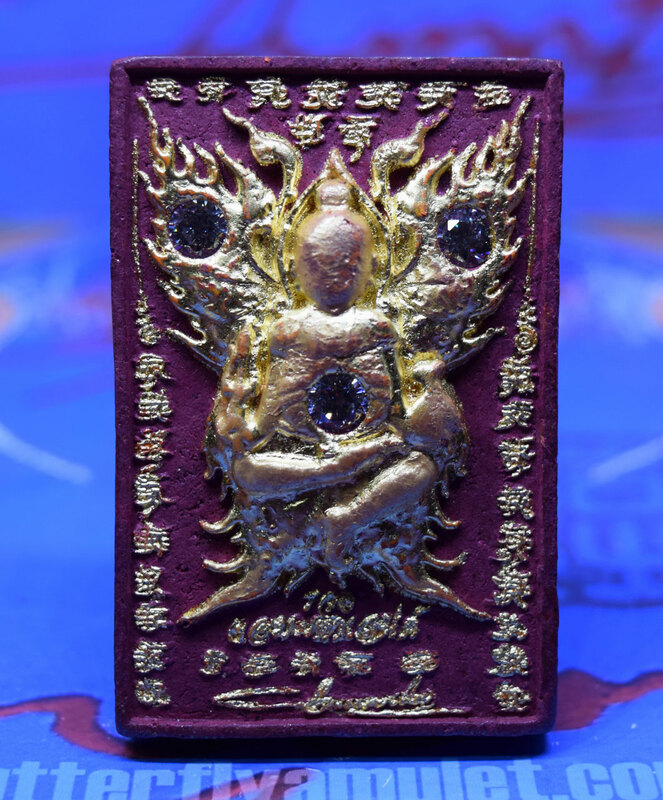 For any further details on payment or shipping, please contact by WeChat, WhatsApp or Email. 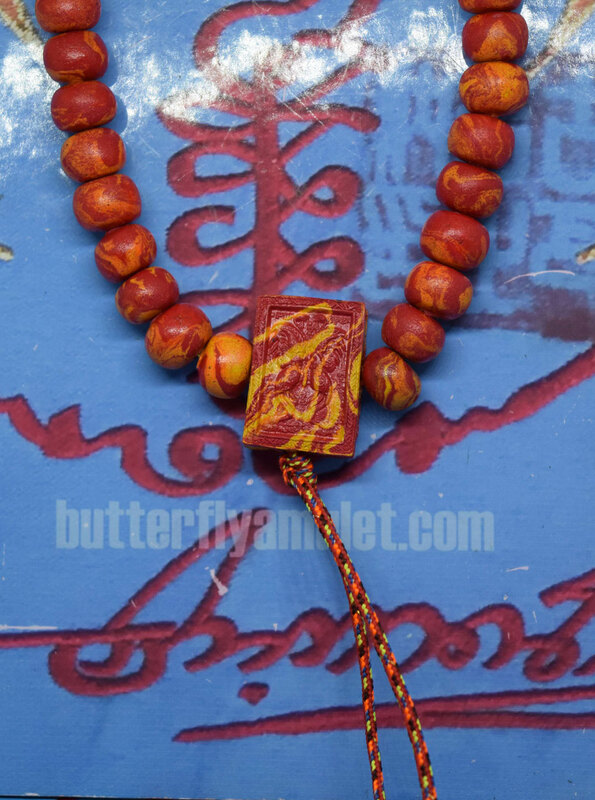 This amulet is approximately 60mm x 40mm made from red powder in 2018. 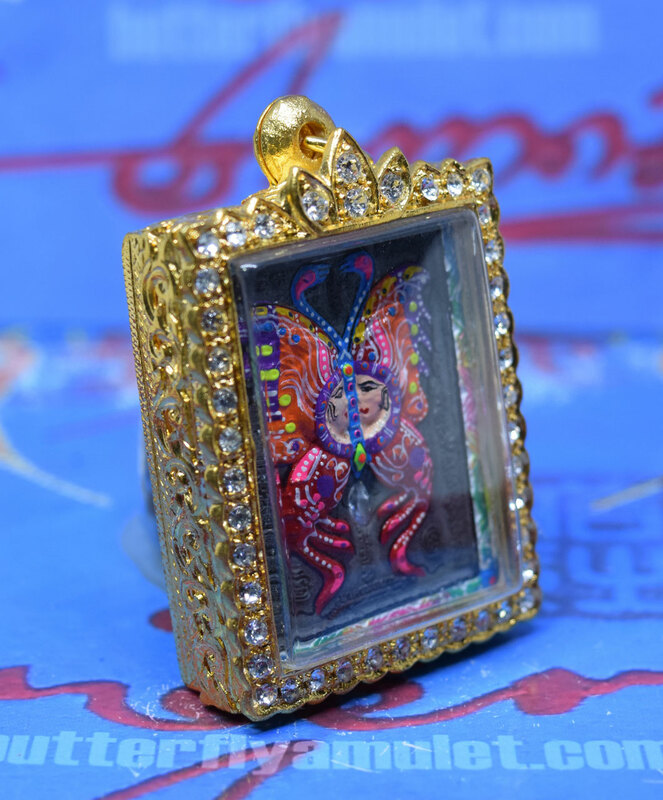 Set around the Baby are six gems , set in the reverse side a gold butterfly with twelve gems stones. 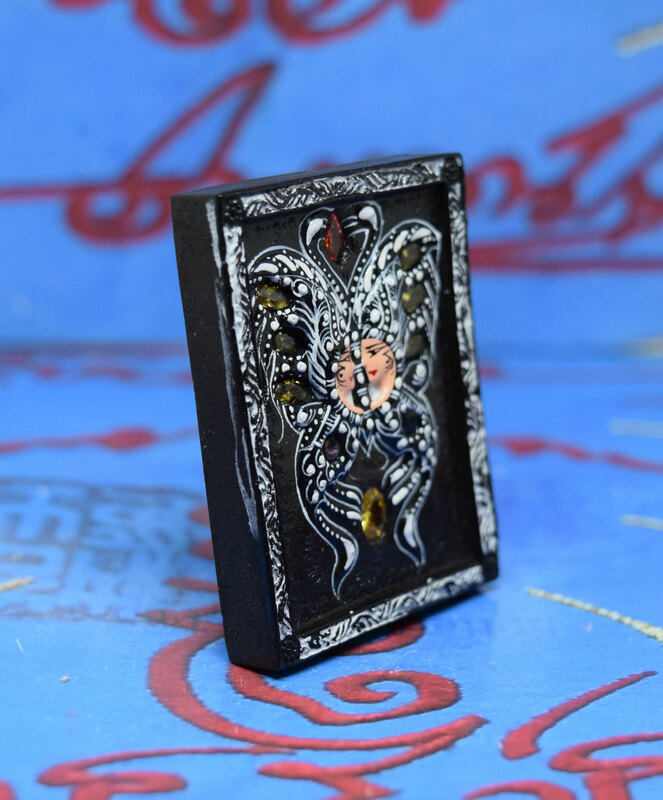 Amulet is approximately 44mm x 30mm made from black powder in 2014, BE2557 . 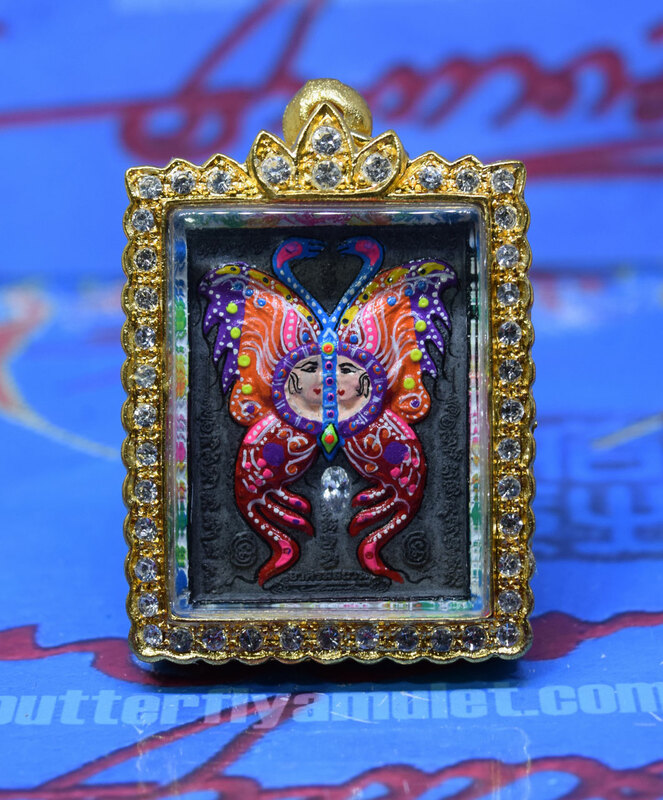 A single gem set around the butterfly, set in the reverse side a large yellow gem with eight crystals. 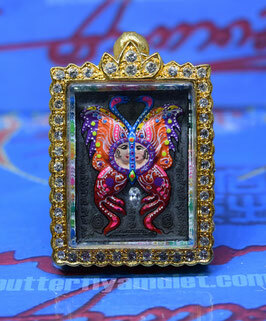 Includes gold micron casing with crystals and International Shipping. 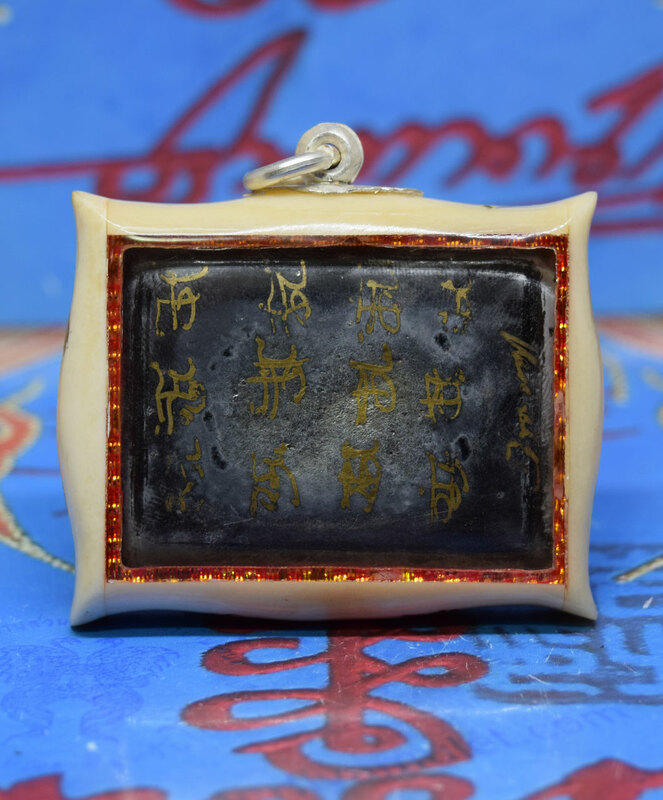 This amulet made from black powder in 2018 . 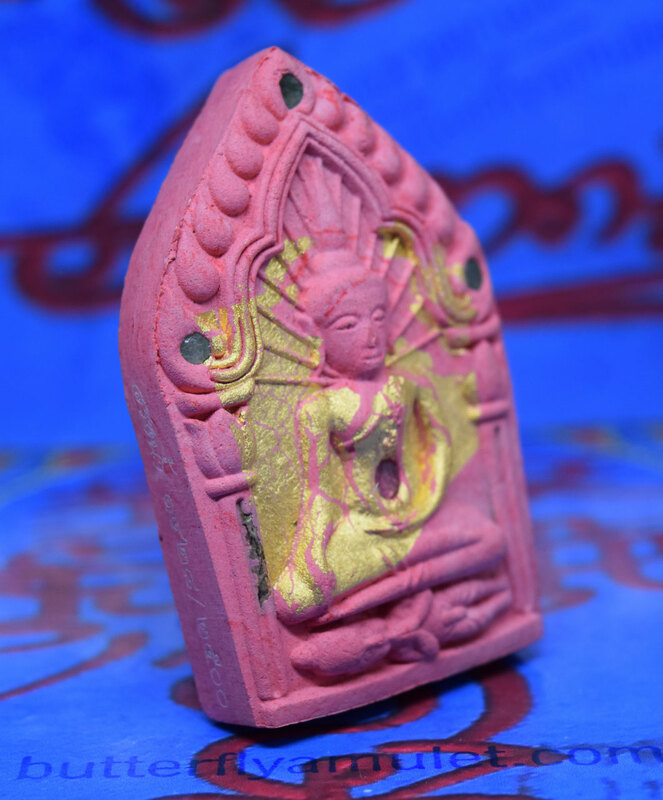 A Khun Paen approximately 60mm x 37mm made from pink powder in 2013, BE2555 Set in the front four gems and two takrats with gold leaf. 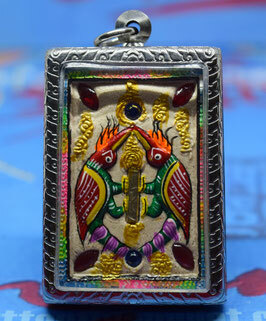 The reverse side silver takrat, eleven gems and the temple seal. 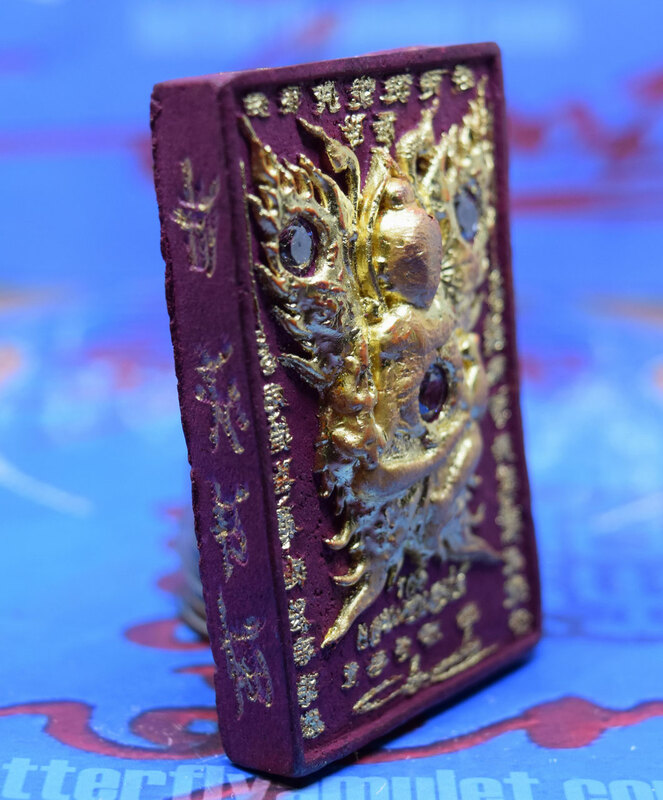 For any further details on payment or shipping please contact us at WeChat, WhatsApp or email. 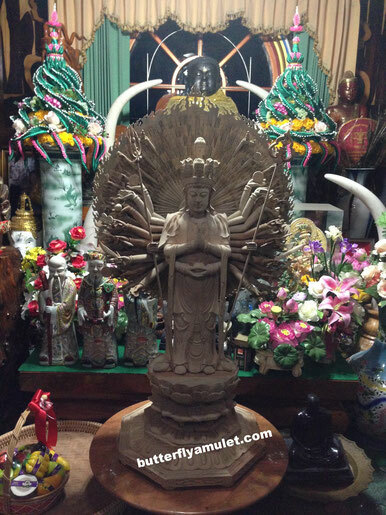 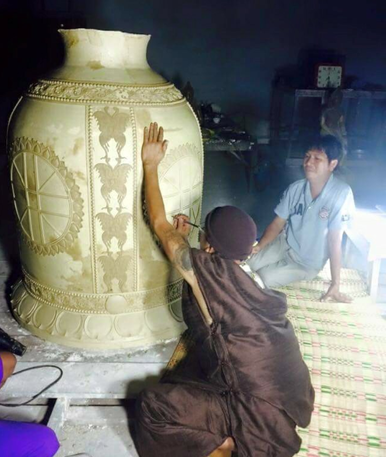 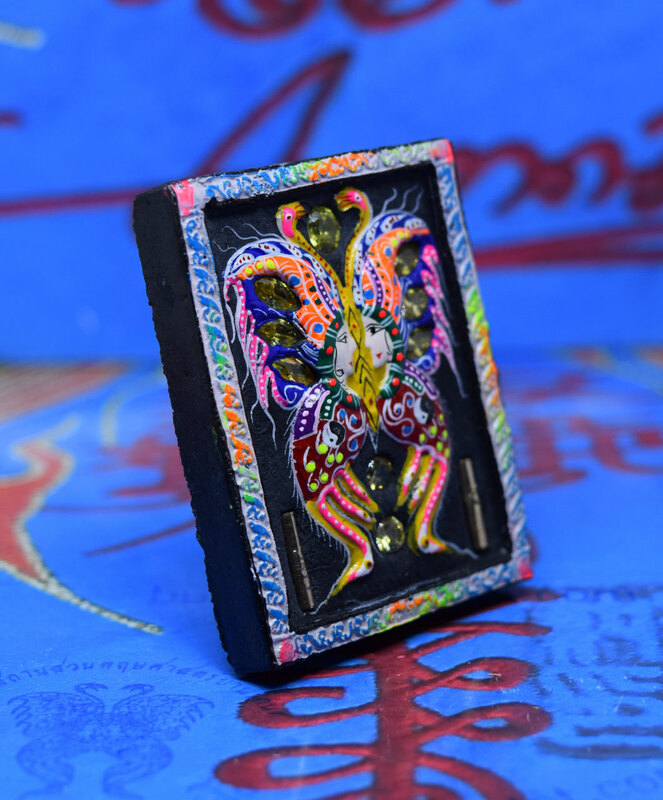 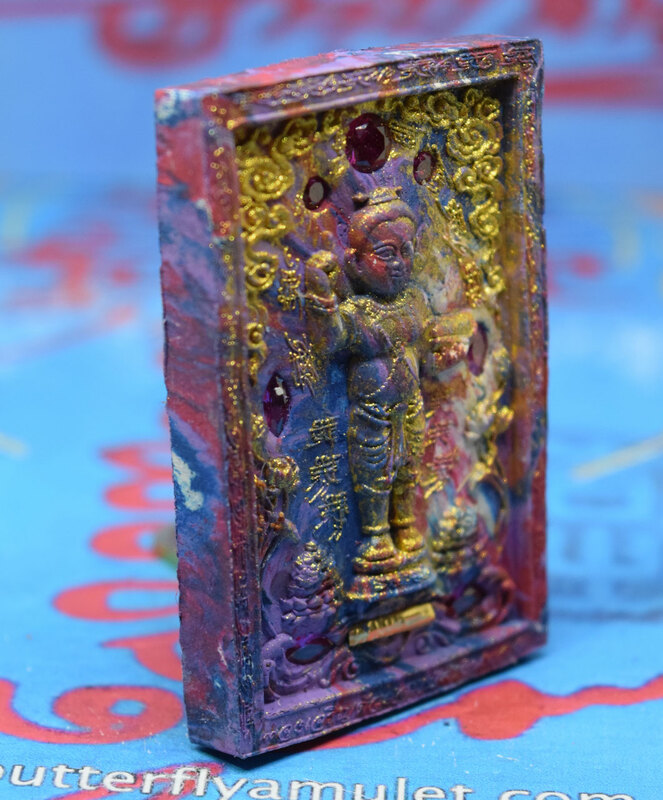 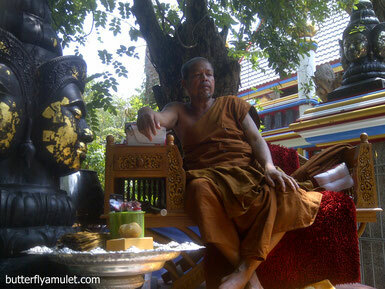 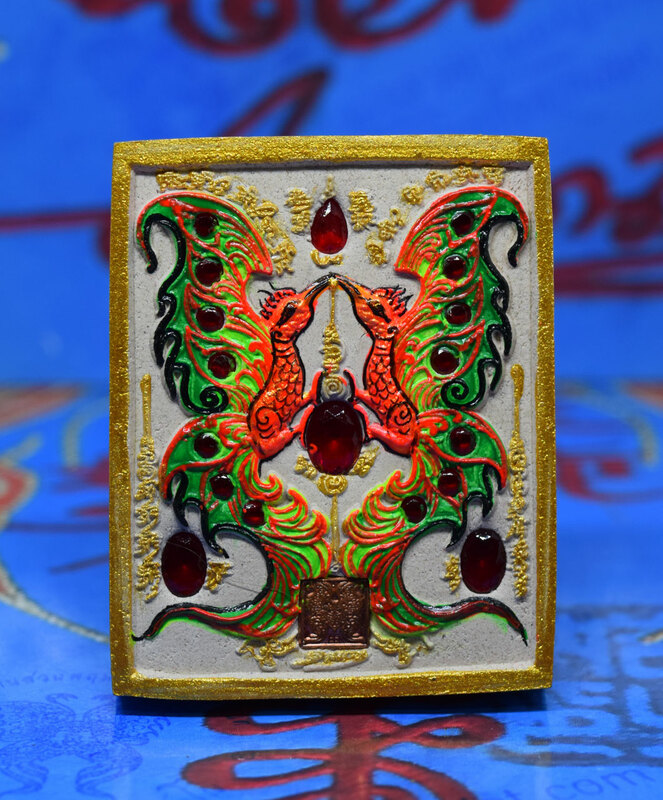 Khun Paen with gold leaf is approximately 60mm x 37mm made from white powder in 2014, BE2557. 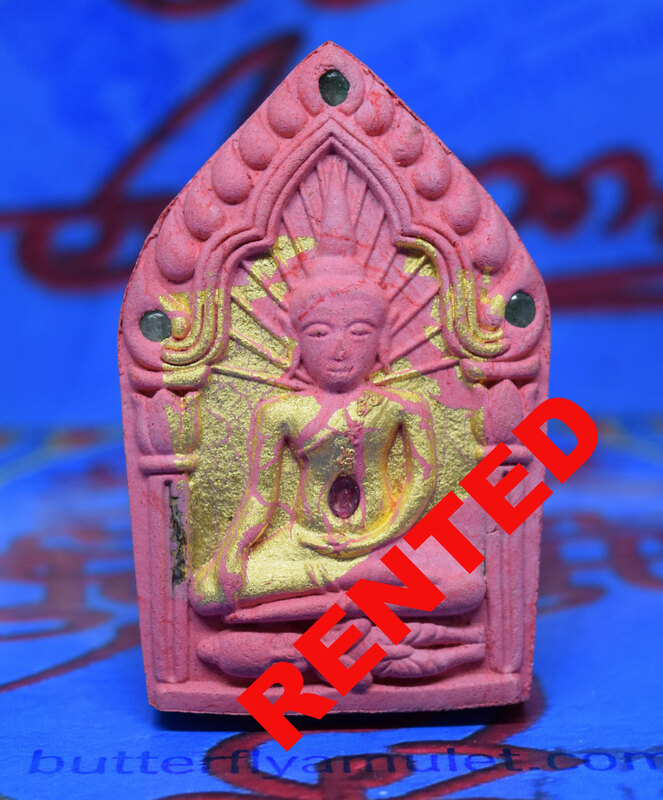 Khun Paen are approximately 30mm x 20mm made from white powder in 2015, BE2558. 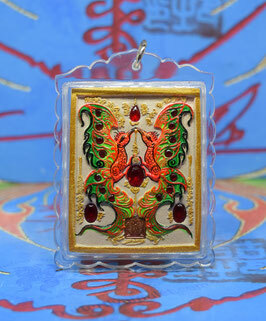 Set in the front single red gem overlayed with gold leaf and 5 gems set in the back with temple seal. 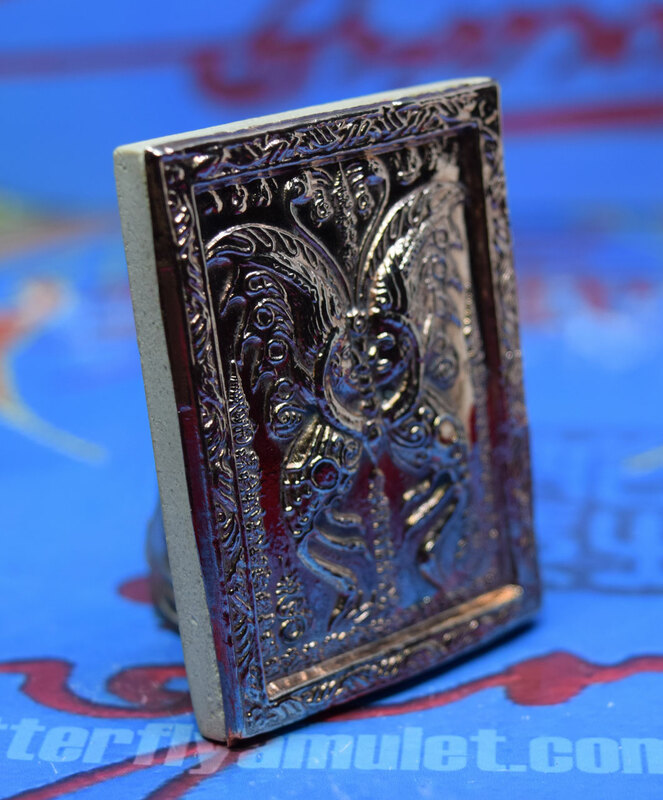 Final Price includes shipping and a stainless or waterproof casing. 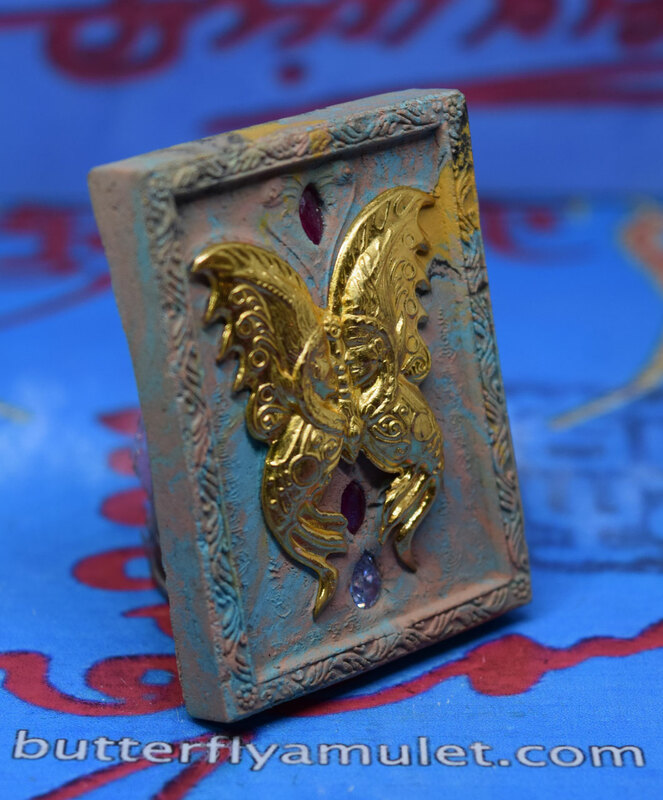 Around butterfly eleven gems , set in the reverse side around a micro gold Sampao Jao are ten gems with two takrat and a temple. 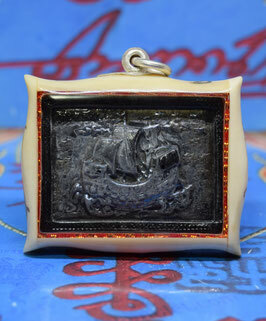 Mong Dam with Silver Yant engraved by Kruba . 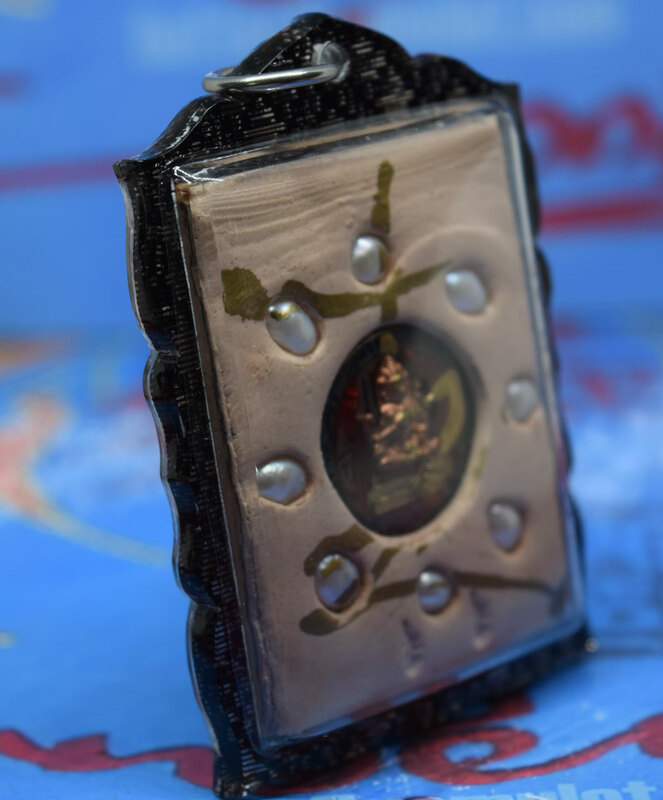 Handmade waterproof casing. 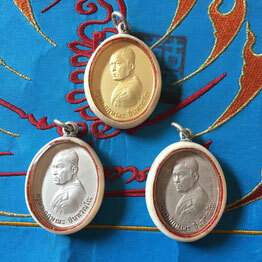 Made in 2004 BE2546 for Kruba's 50th Birthday these are the first edition Gold and Silver medallions. 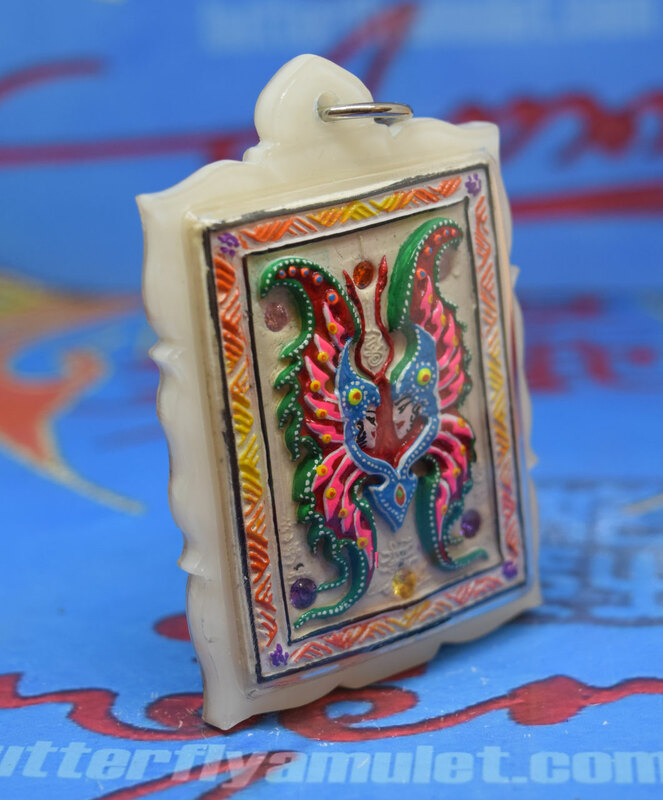 Medallions are set in a handmade waterproof casing made from deer antler. 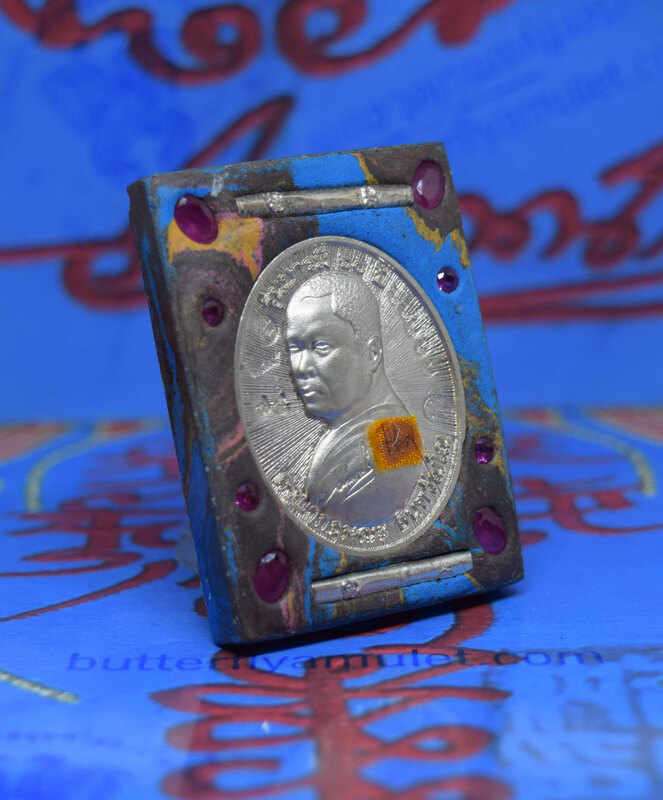 Silver medallion number 1 is engraved with yant and signed by Kruba. 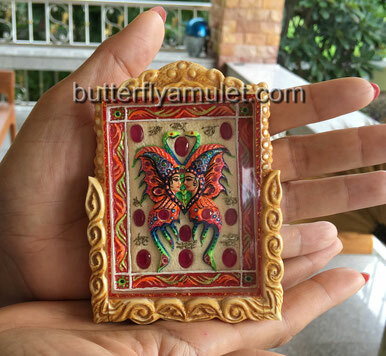 Please contact WeChat or email natcha@butterflyamulet.com for price stating code number for payment/shipping details. Protect your business or use bring lucky for owner. 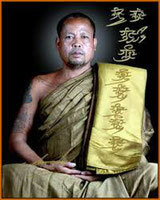 Danger Obstacles Cease, Charms, Loving Kindness, Increased halo and fame, Working Smooth, Wealth, Luck and Happiness. 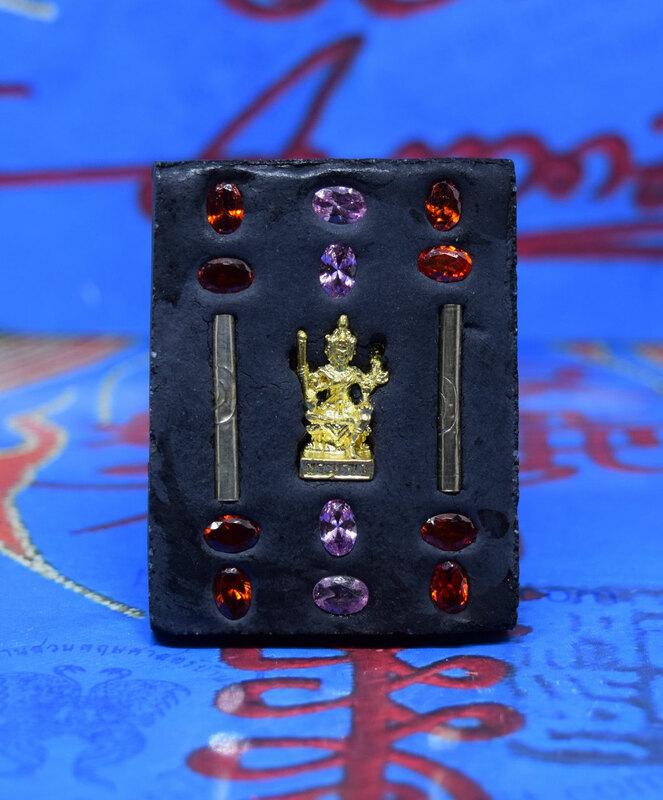 Pidta and Rahu are approximately 49mm x 31mm made from light brown powder in 2016, BE2558 with a gold takrat on the reverse side eight gems around Holy Recluse. 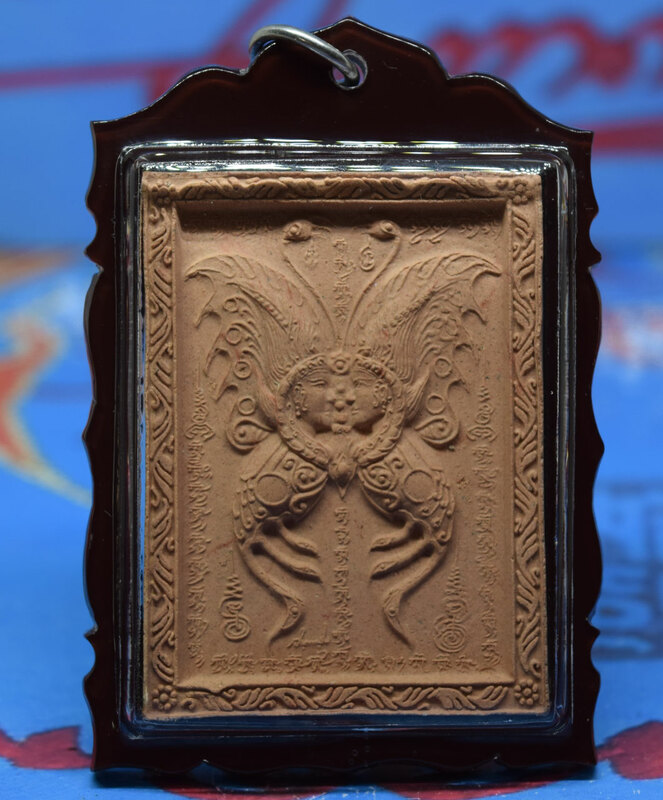 This amulet is approximately 66mm x 46mm and made in BE2560 (2016) from a brown powder. 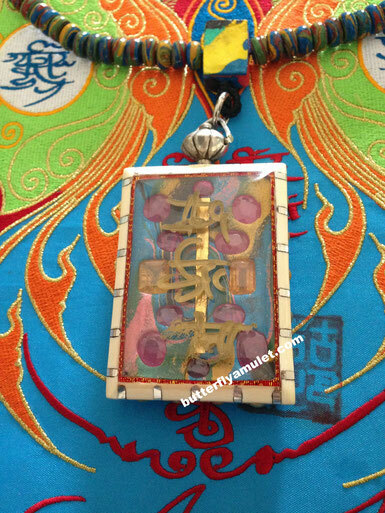 Set around the gold painted butterfly are six yellow and two red gems. 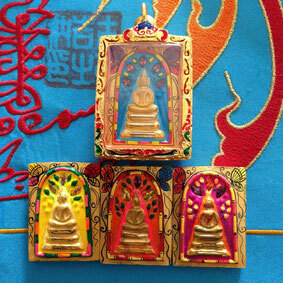 On the reverse side are five gems and temple seal. 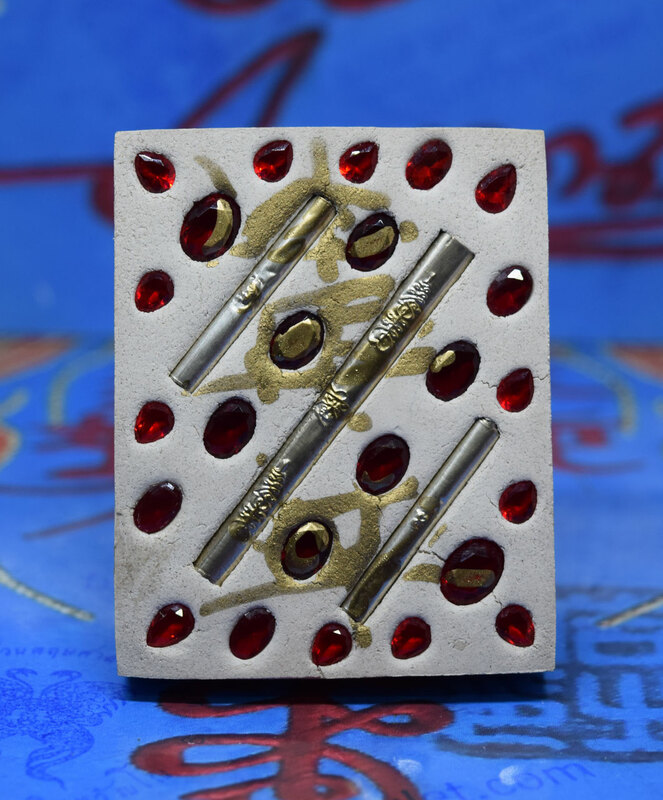 Stainless and micron casing and shipping with a Certificate. 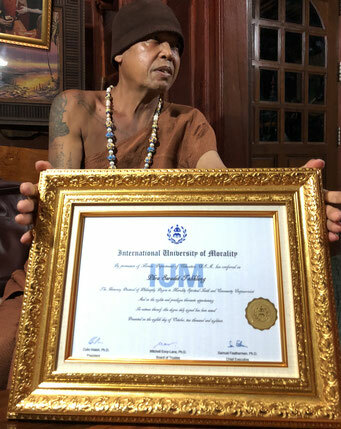 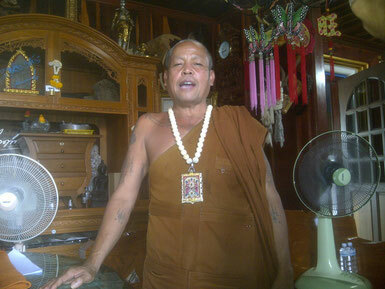 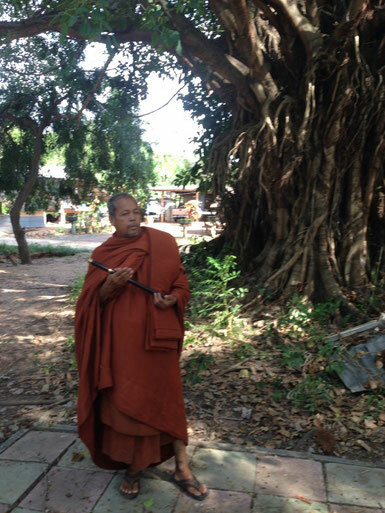 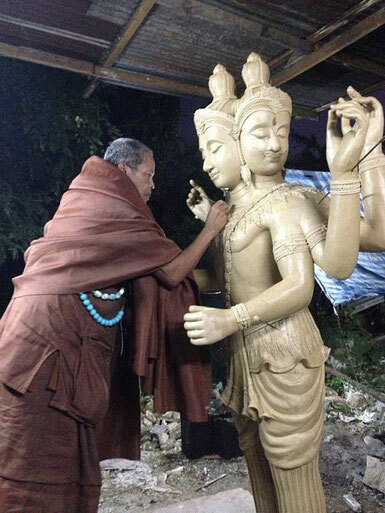 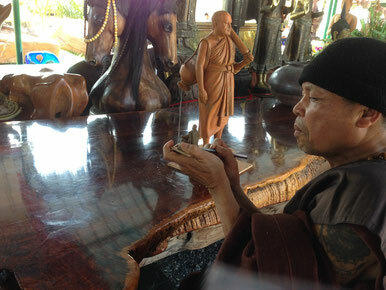 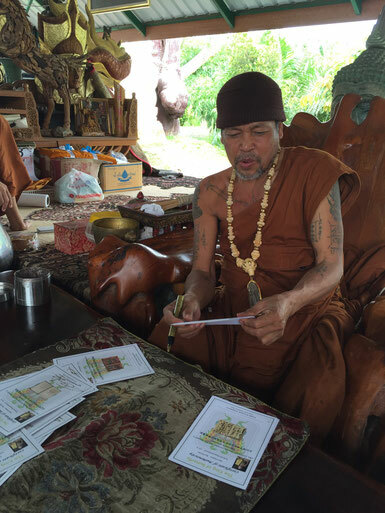 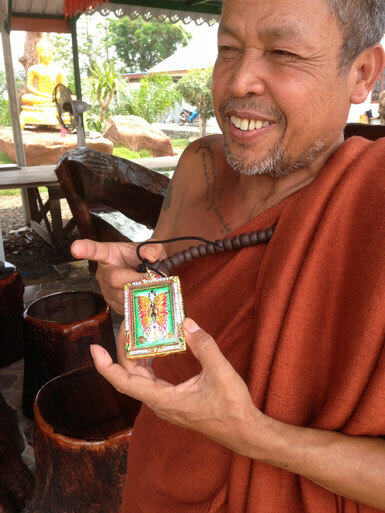 Blessed in Udon Thani by ten monks including Kruba Krissana . 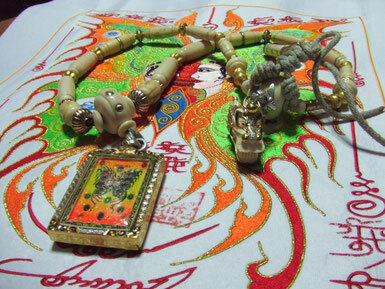 With Gold takrats and Ganesha. 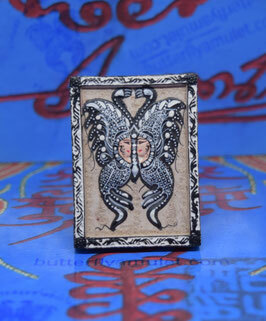 Narai made from brown or white powder and complete with stainless casing and includes shipping. Amulets are approximately 39mm x 28mm made from white powder, set in the front five/seven gems and three takrats, set in the back four gems. 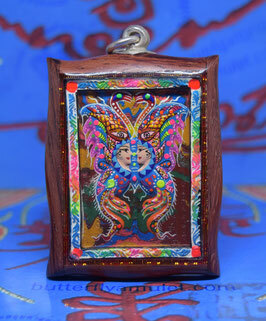 Made in BE2556 (2013) for Kruba Birthday. 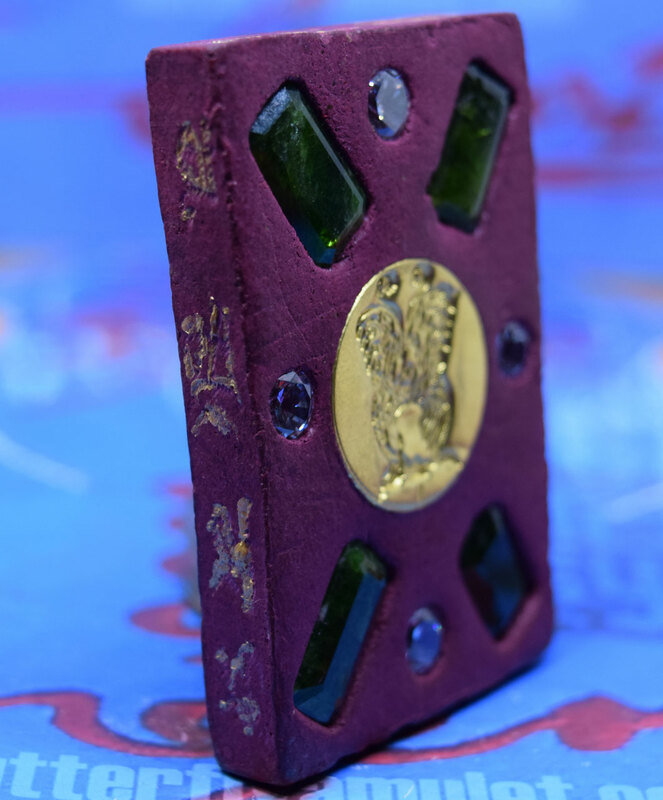 Each colour is for the days of the week on which a birthday is celebrated, complete with gold, silver or waterproof casing. 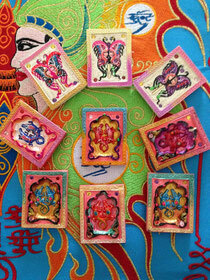 Code - S02/01 and Please state which Day when you make order. 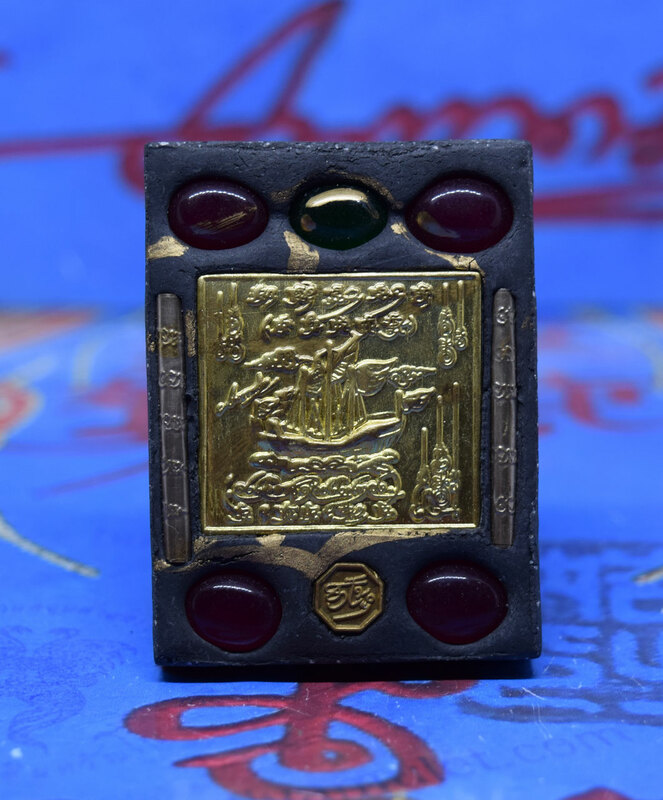 Buy Now online store Code S02/01 for any further details on payment or shipping please contact us at WeChat or email. 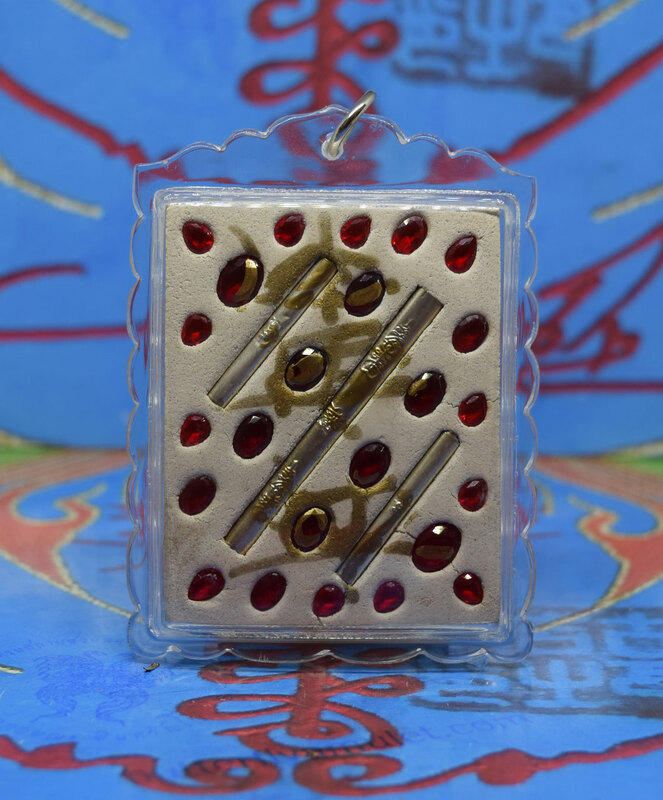 Pidta made in BE2557 made from a light brown powder, amulets are 26mm x 21mm with a gold leaf overlay complete with gold micro or stainless steel casing. 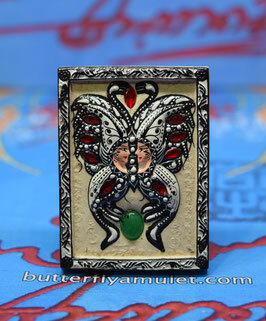 Pidta made in BE2556 made from Black / White powder, amulets are 38mm x 30mm with metallic Pidta and on the back a single gem and takrat. 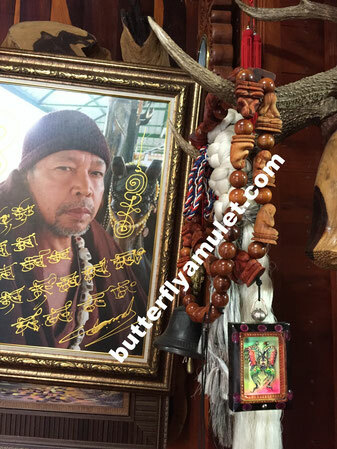 Buy Now online store Code S11/01-02 for any further details on payment or shipping please contact us at WeChat, WhatsApp or email. 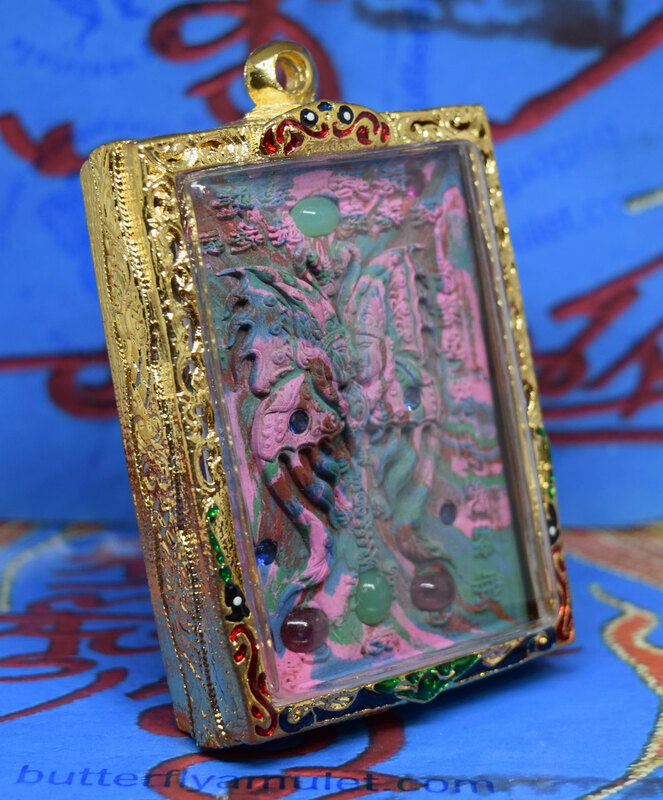 Limited to Fifty Pieces for Kruba Birthday 2017 with gold takrat and real gems. 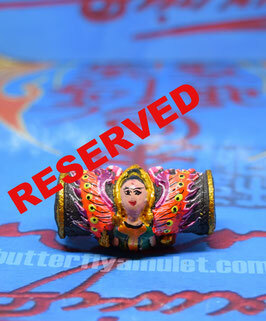 Includes casing , certificate and shipping. 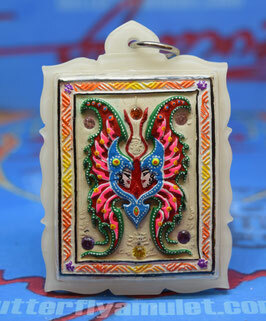 Price - Please Contact for best price. 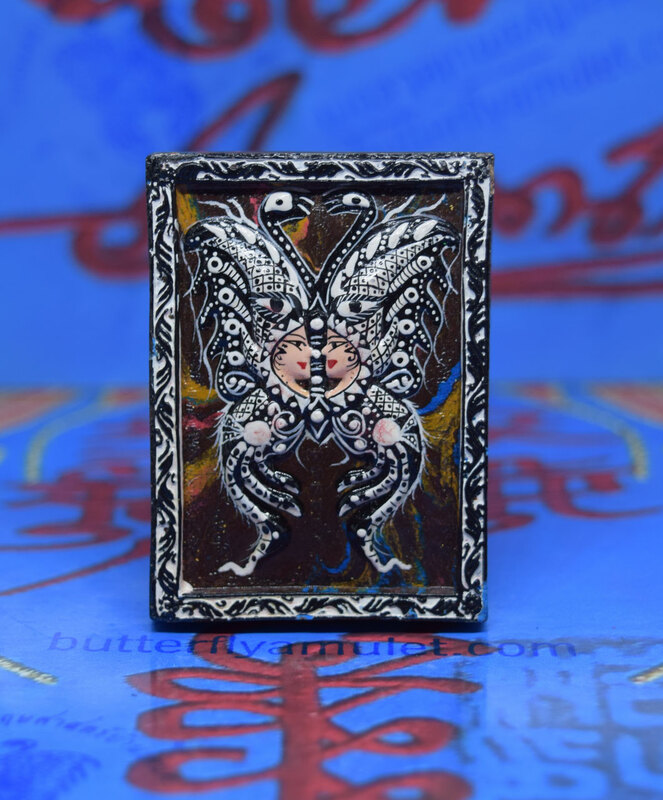 Buy Now online store Code B122/01-03 for any further details on payment or shipping please contact WeChat or email. 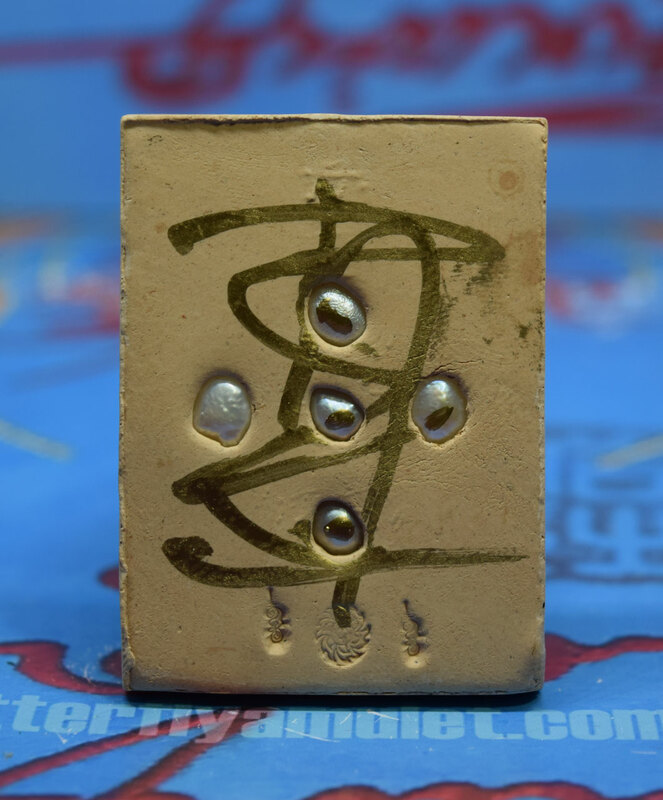 Somdej are approximately 49mm x 34mm made from white powder in 2015, BE2557. 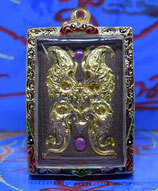 a blue gem stone and gold is set in the somdej ,on the reverse side a gold takrat and four red gems. 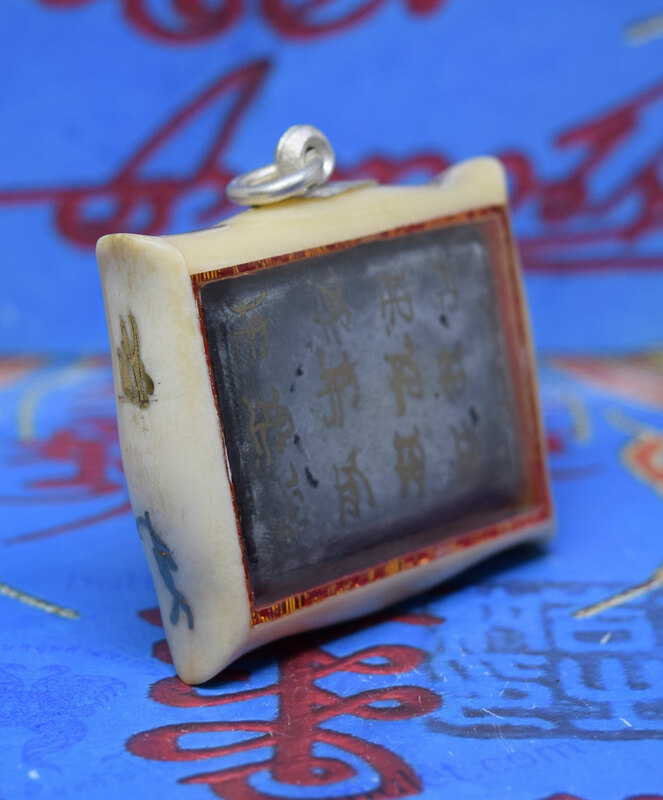 Buy Now online store Code S24/01- 02 for any further details on payment or shipping please contact us at WeChat or email. 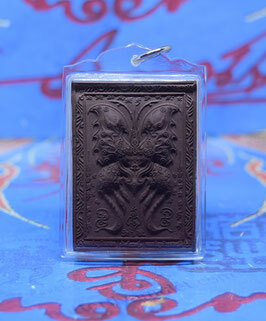 Amulet is approximately 60mm x 39mm made in 2014 BE2557 from black and brown powder, engraved with nine yant and signature by Kruba. 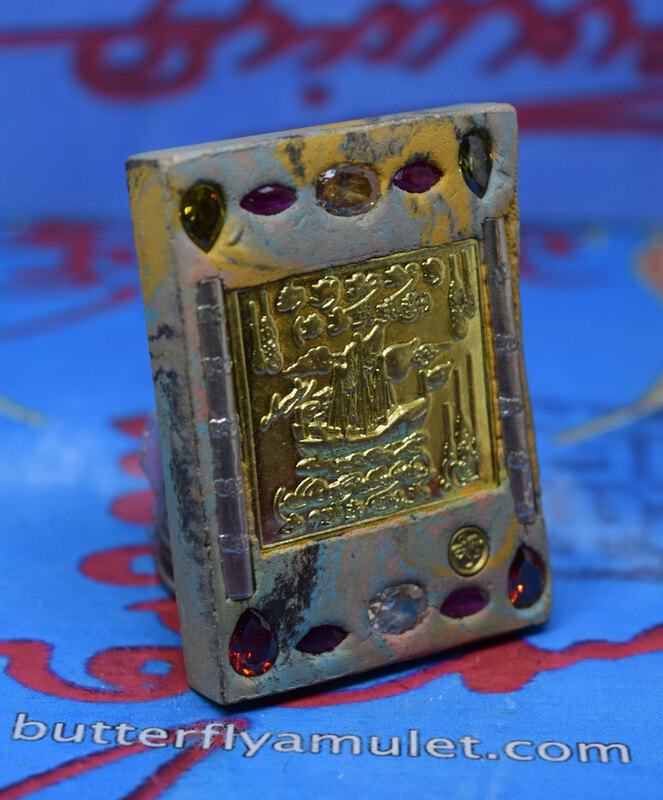 Buy Now online store Code B84/01 for any further details on payment or shipping please contact WeChat or email. 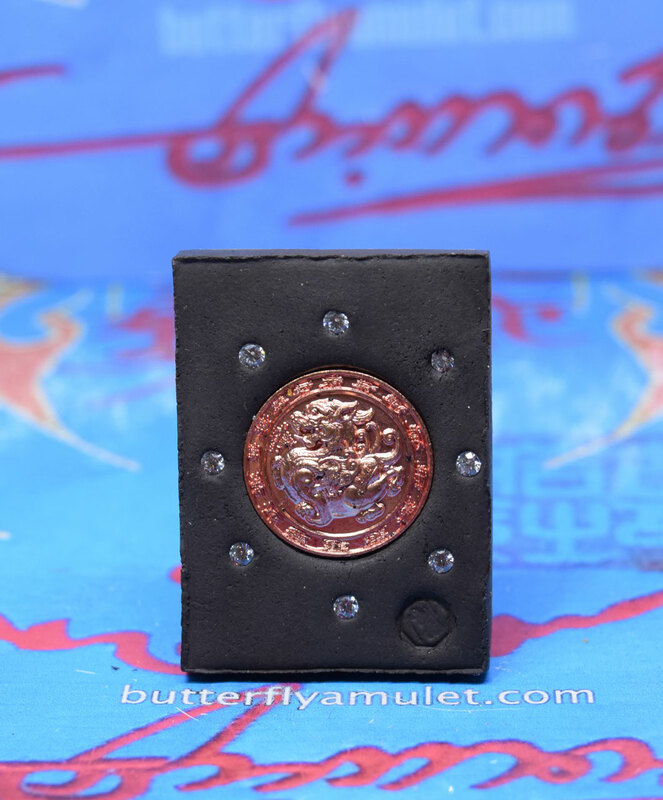 Amulet is approximately 50mm x 37mm made in 2014 BE2557 from brown powder set in the front seven gems, set in the back five takrats and twenty gems around them. 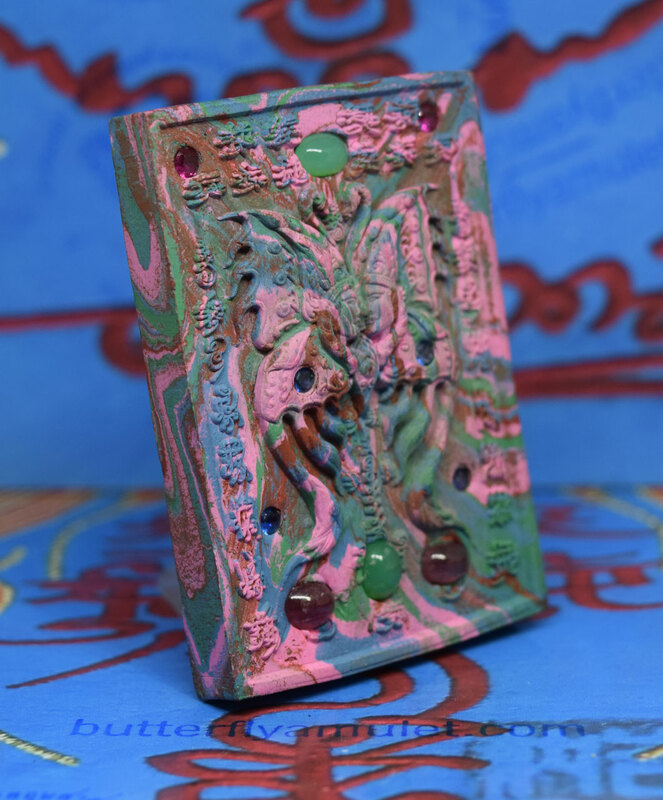 Complete with casing. 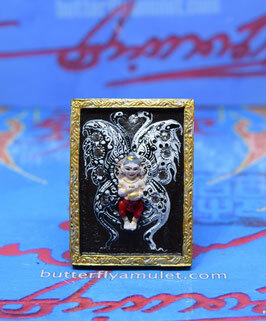 Amulet Price - 3800THB Final Price includes shipping. 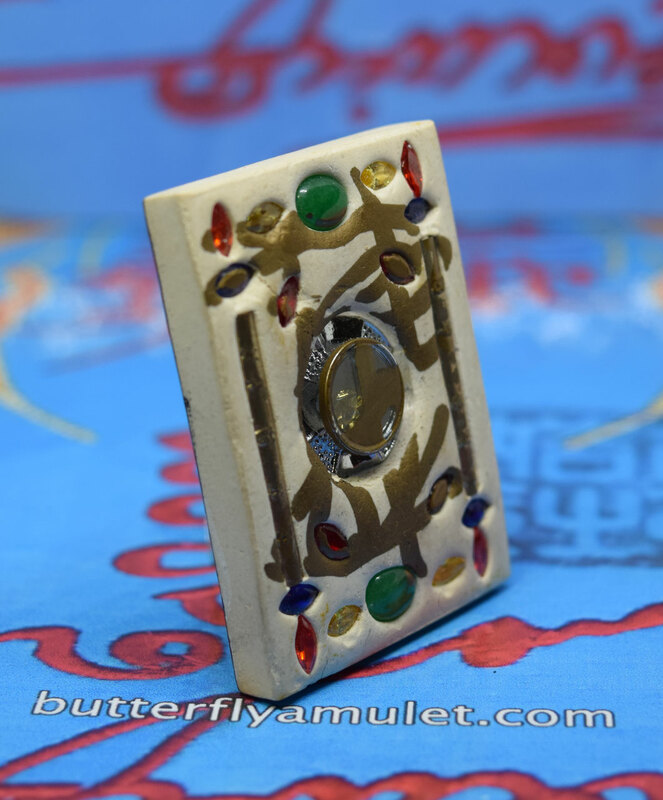 Amulet is approximately 50mm x 38mm made in 2015 BE2557 from white powder, set in the front fourteen gems and set in the reverse side fourteen gems around a takrat. 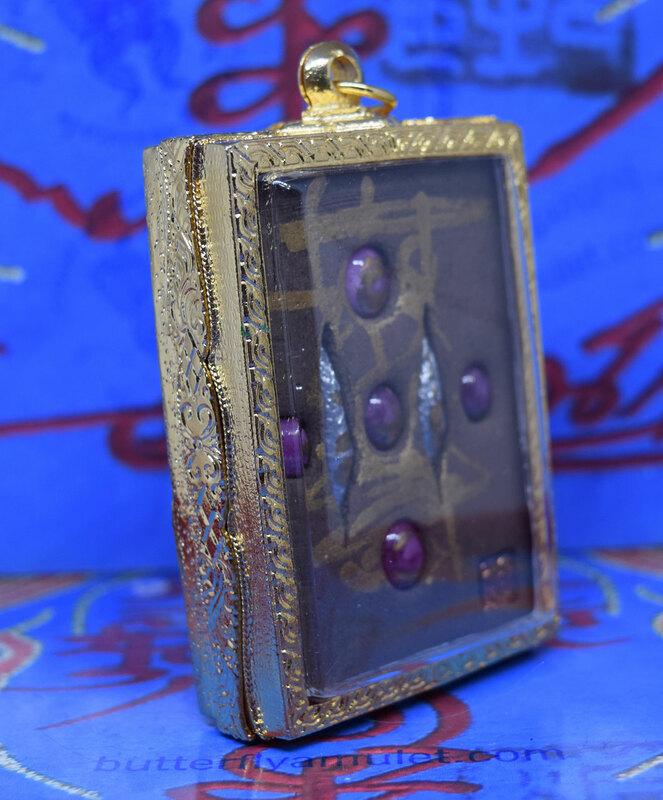 Complete with casing. 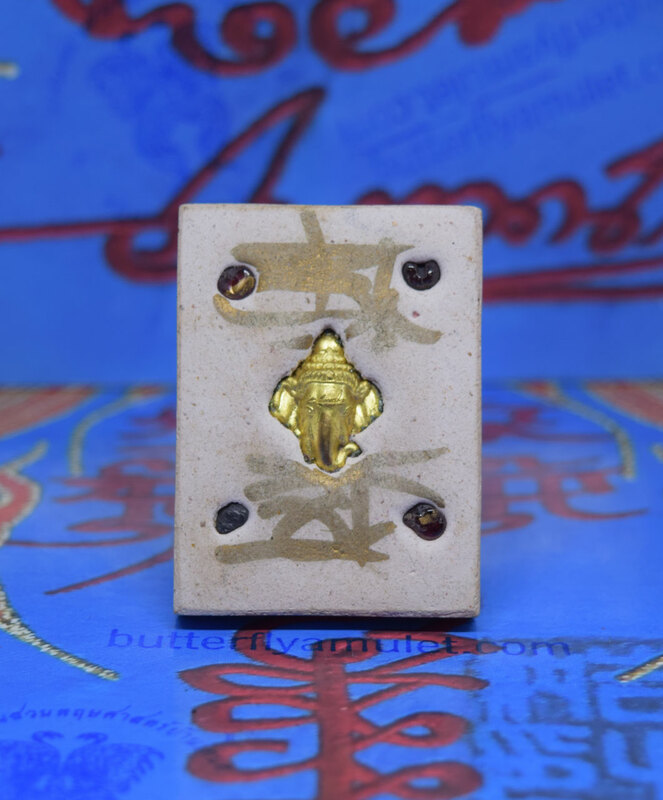 Buy Now online store Code B42/01-02 for any further details on payment or shipping please contact WeChat or email. Amulet is 40mm x 30mm made in BE2559 2016 from black powder . 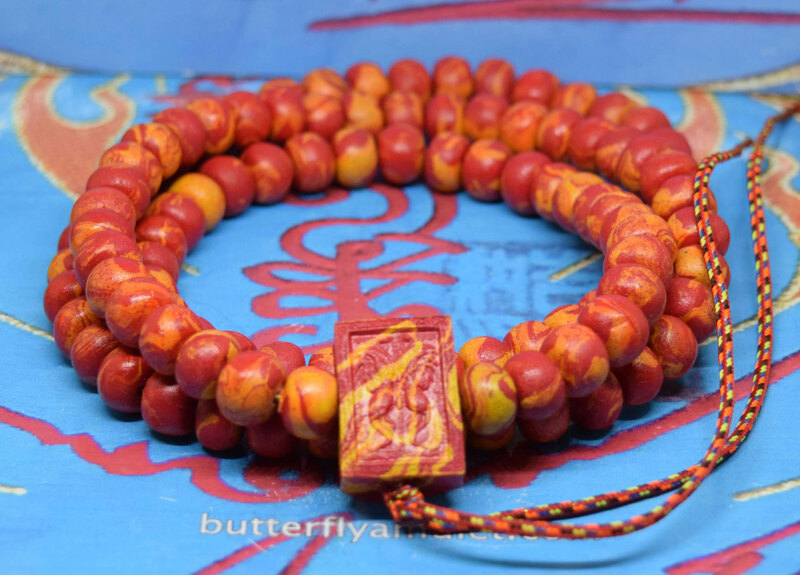 Buy Now online store Code B98/01- 02 for any further details on payment or shipping please contact WeChat or email. 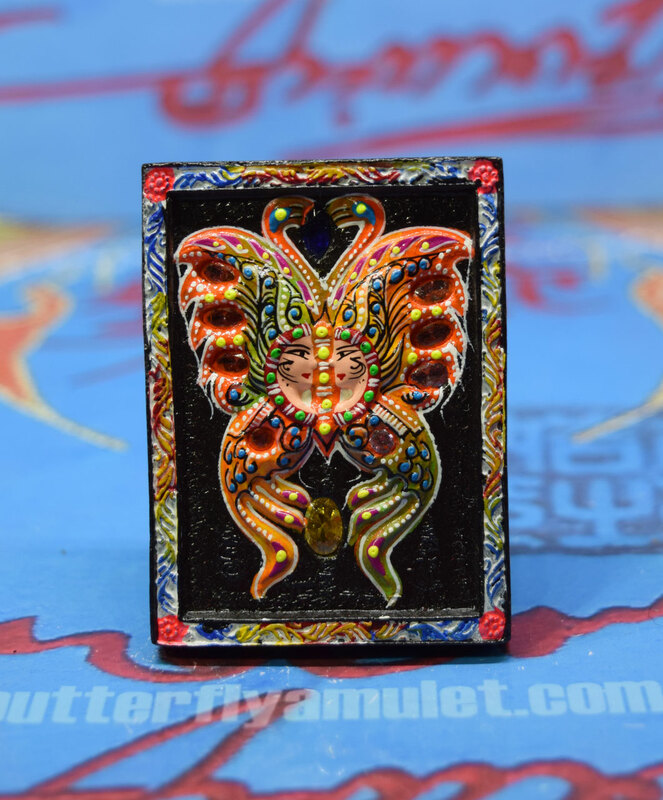 Amulet is approximately 44mm x 30mm made from powder in 2015, BE2558. 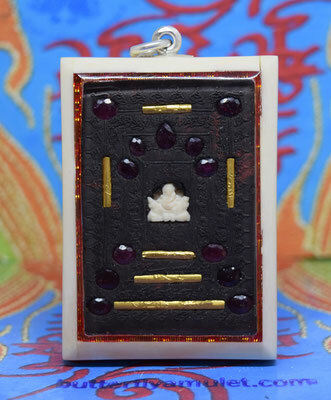 Set in the front nine gems and temple seal, set in the reverse side six takruts, eight gems. 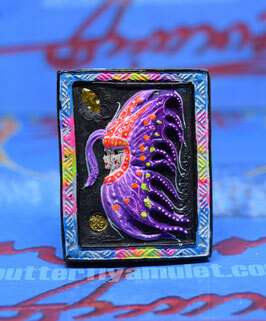 Kruba hair and rode attached. 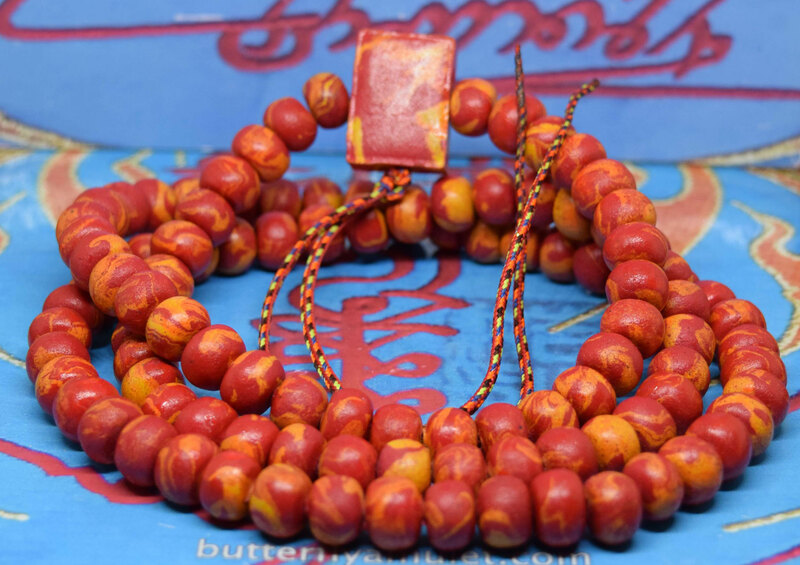 Buy Now online store Code B75/01- 04 for any further details on payment or shipping please contact WeChat or email. 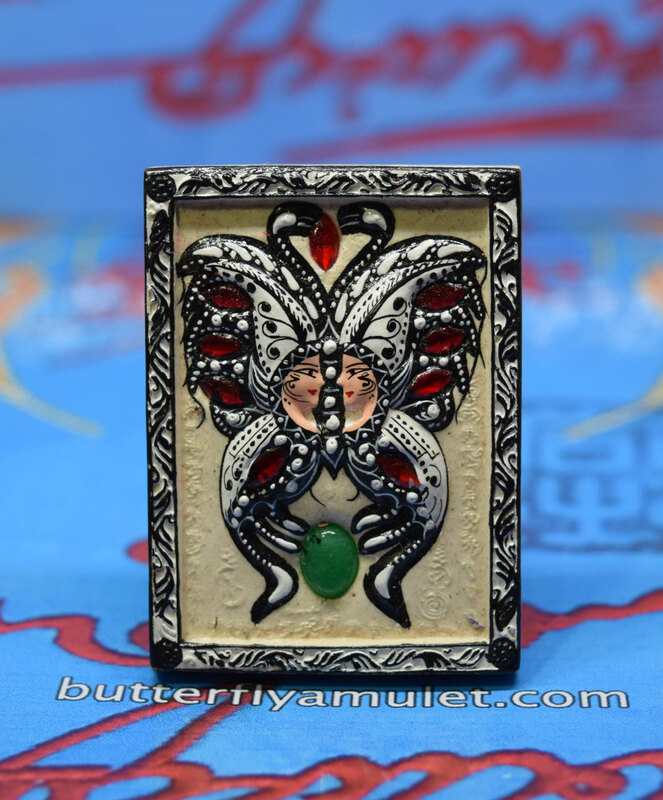 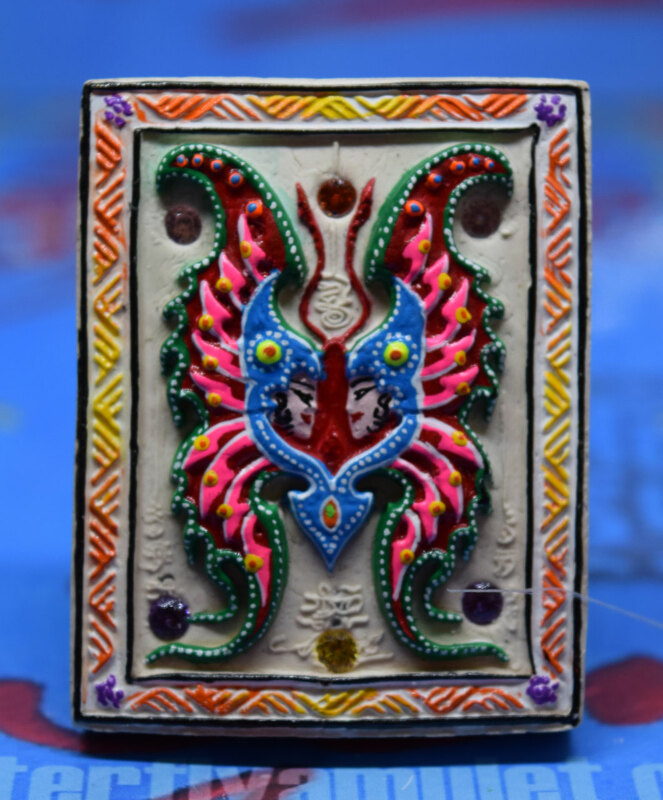 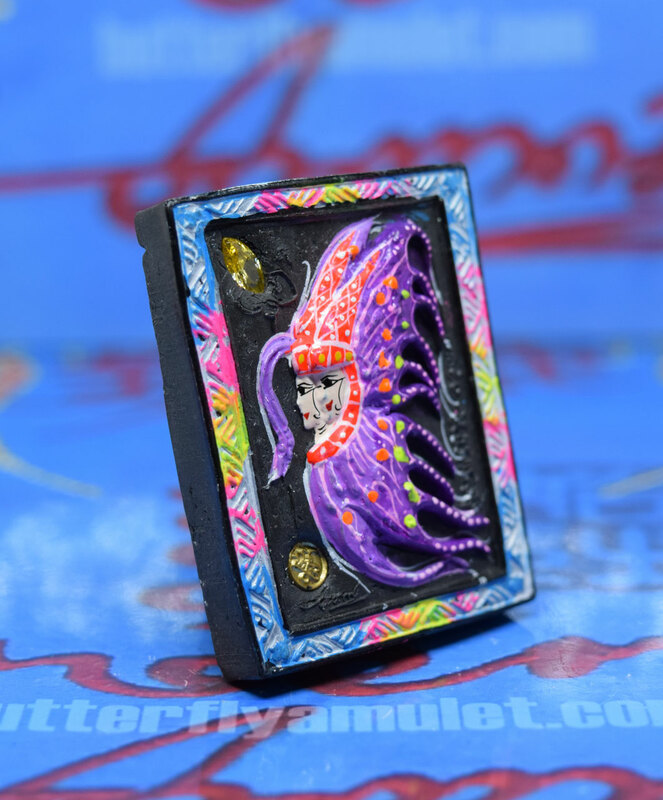 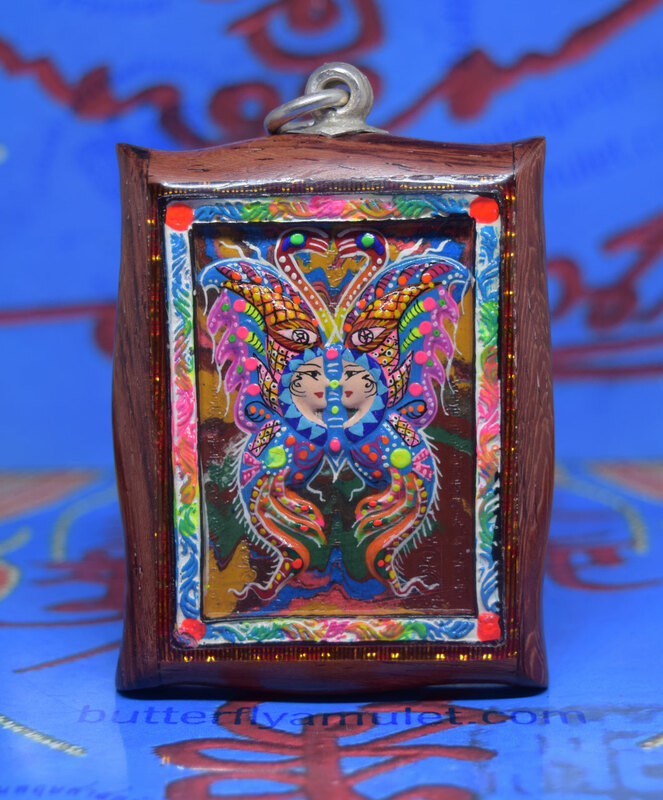 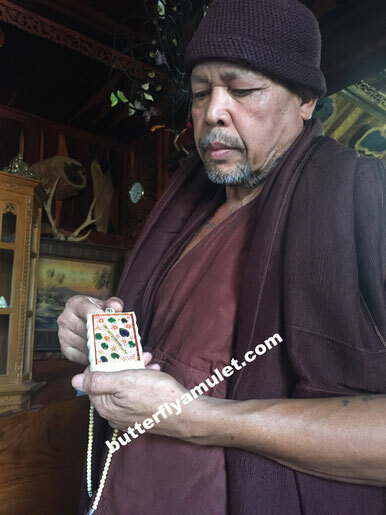 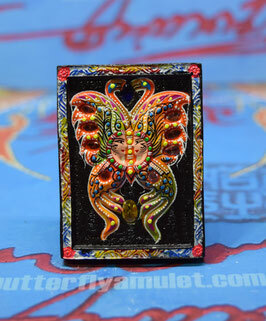 Amulets are 50mm x 37mm made in BE2558 2016 from black powder around butterfly eleven gems and the temple seal , set in the reverse side butterfly made from Jade are twenty one or eighteen gems from two or four takrat. 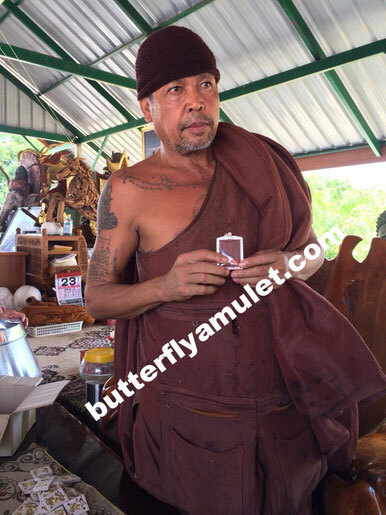 Buy Now online store Code B62/01-02 for any further details on payment or shipping please contact WeChat or email. 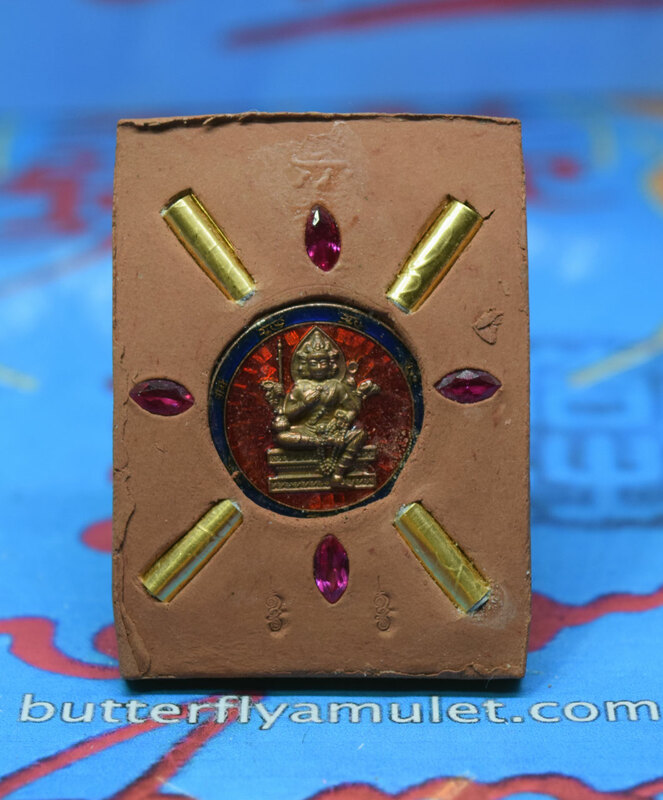 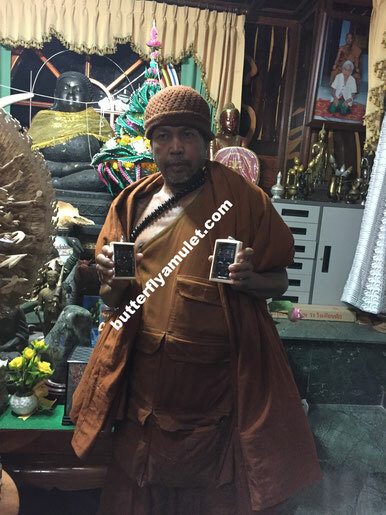 Amulets are 50mm x 37mm made in BE2558 2016 from black powder around butterfly eleven gems with two takrats and set in the reverse side butterfly made from Jade are twenty one gems and temple seal. 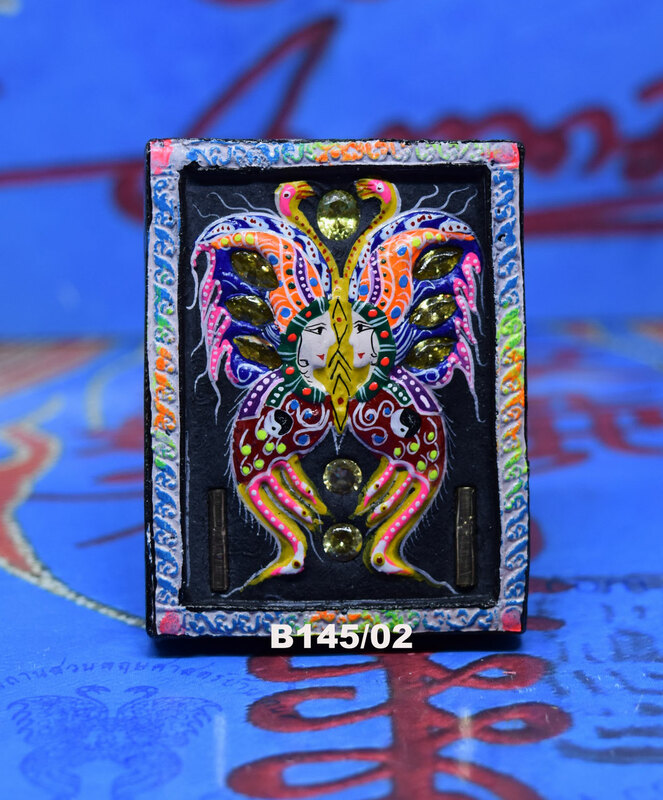 Buy Now online store Code B62/03-04 for any further details on payment or shipping please contact WeChat or email. 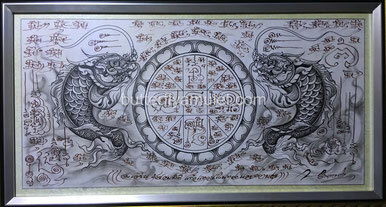 Final Price includes Stainless Casing, Certificate and Shipping . 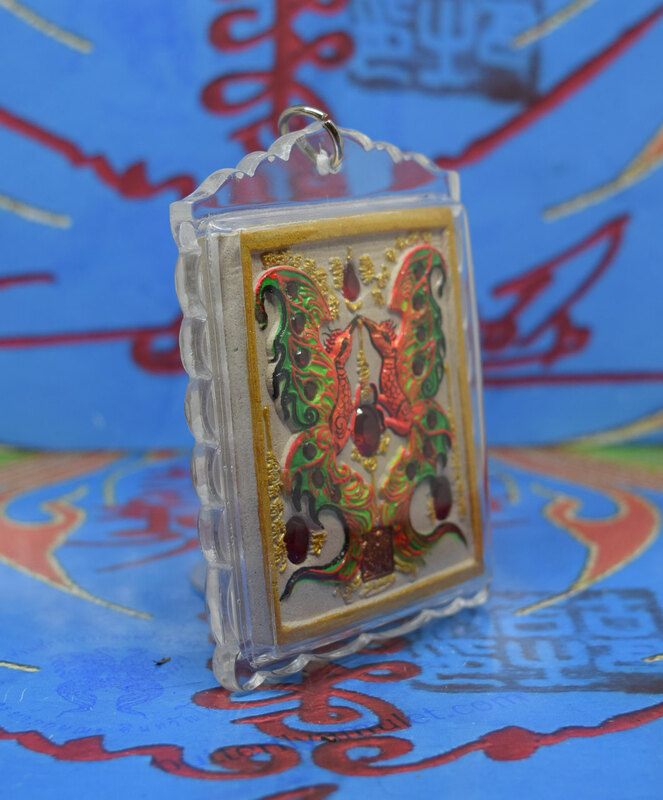 This amulet is 50mm x 37mm made in BE2558 2016 from white powder around butterfly eleven gems and the temple seal , set in the reverse side Noks (bird), sixteen or eighteen gems from two or four takrat. 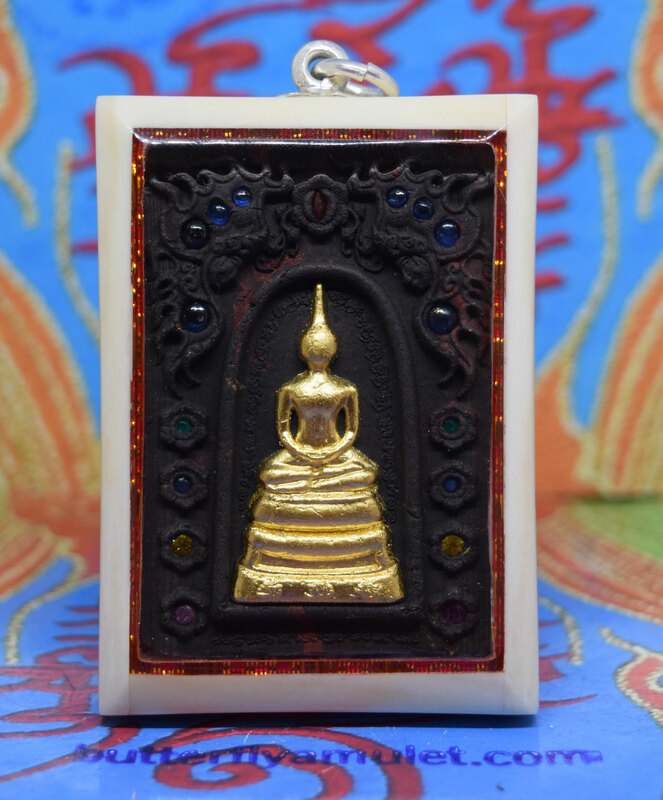 Buy Now online store Code B58/01-02 for any further details on payment or shipping please contact WeChat or email. 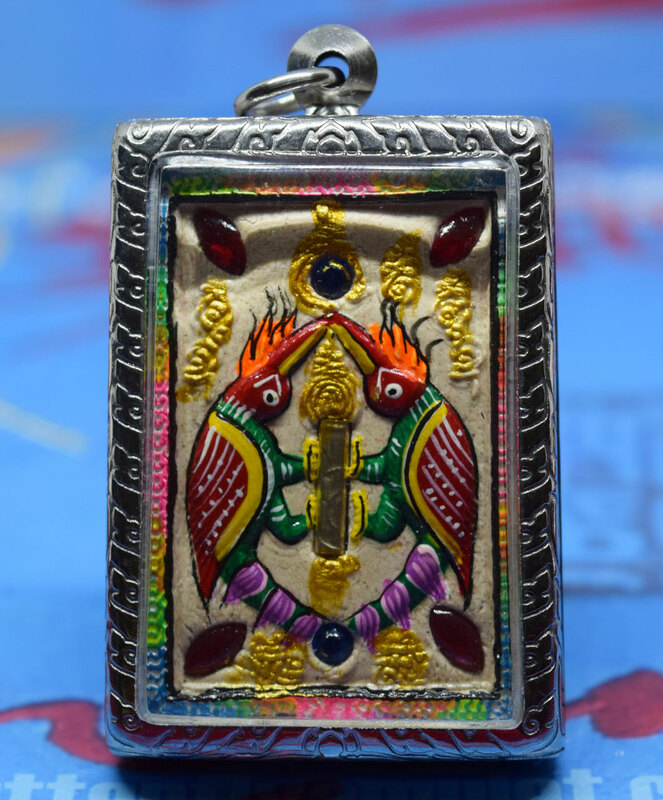 Amulets are approximately 46mm x 37mm made from white powder in 2015, BE2558. 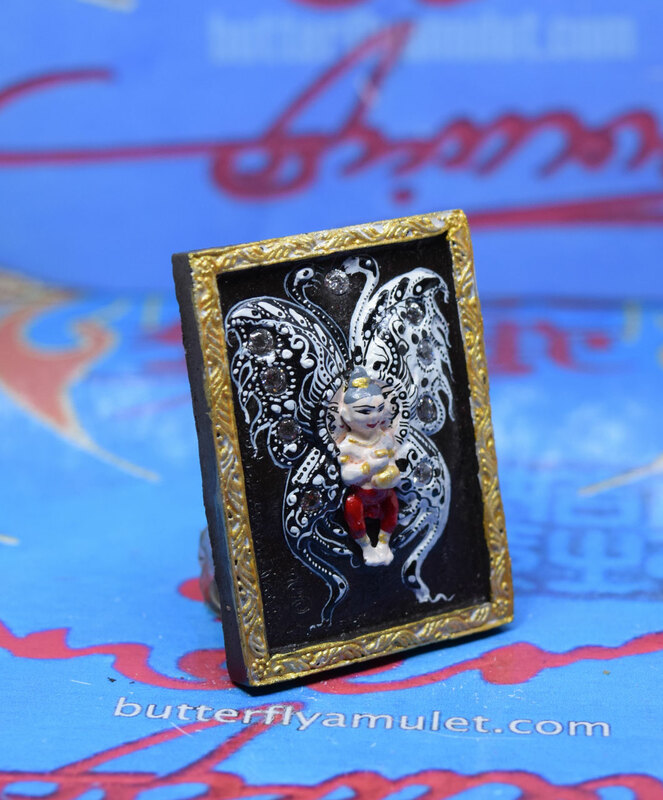 Set around tyhe butterfly are three gems and takrat Set in the reverse side six gems stones ,two spider gems around a Rahu. 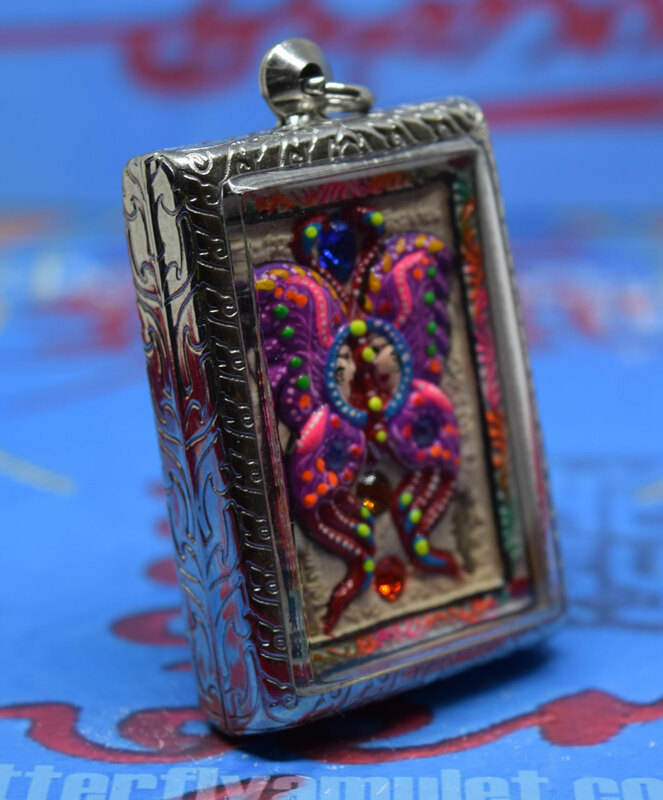 Complete with waterproof casing with lacework and adjustable necklace. 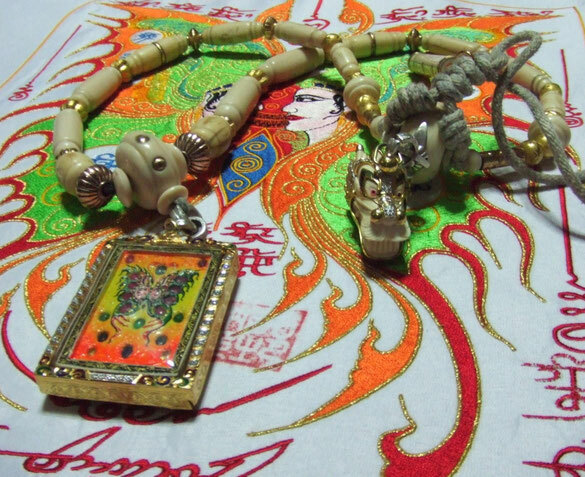 Buy Now online store Code B94/01 for any further details on payment or shipping please contact WeChat or email. 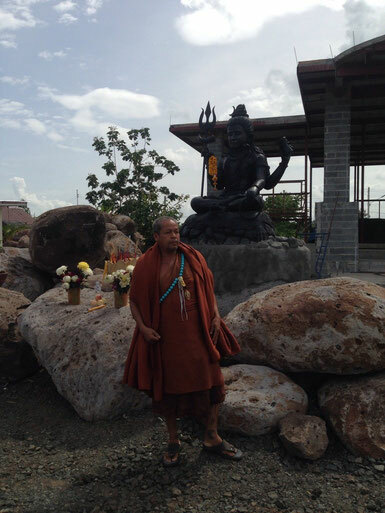 Mong Cow with Naria made for 2017 New Year and the construction of new facility's at the temple. 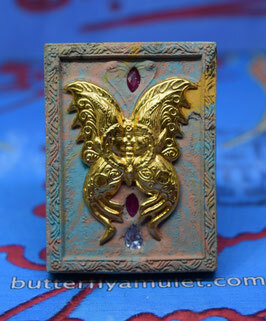 Four gems set in the butterfly and eight around naria with gold takrat. 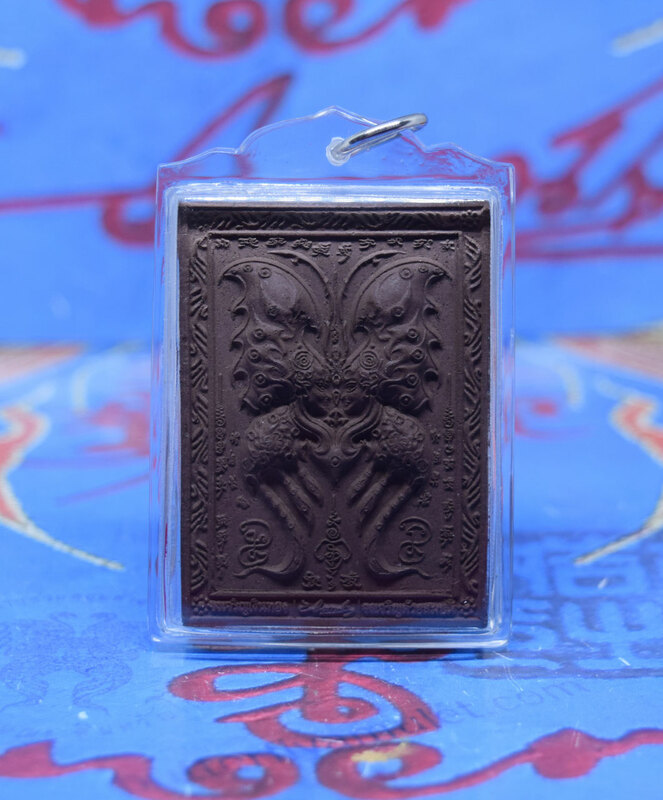 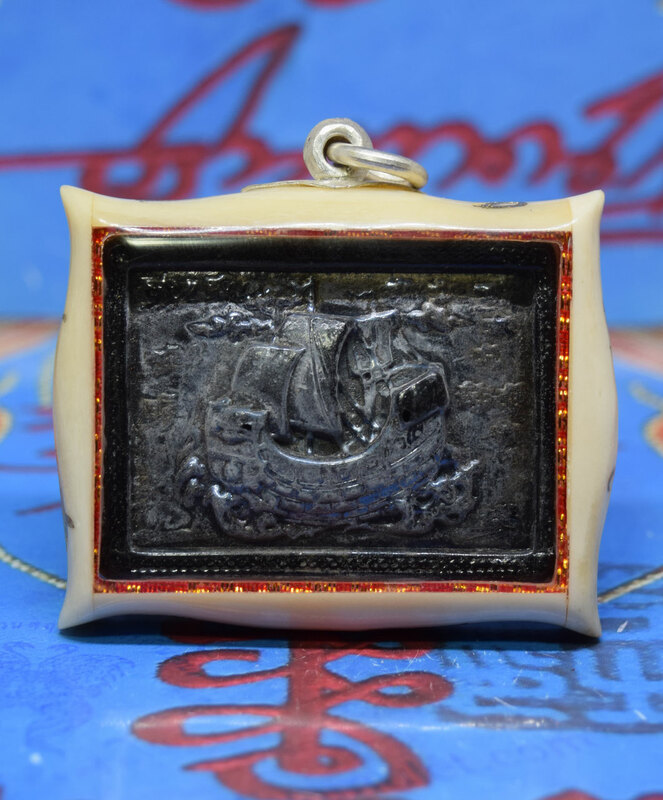 Amulet is approximately 60mm x 39mm made in 2014 BE2557 from black powder, engraved with thirty five yant and signature by Kruba. 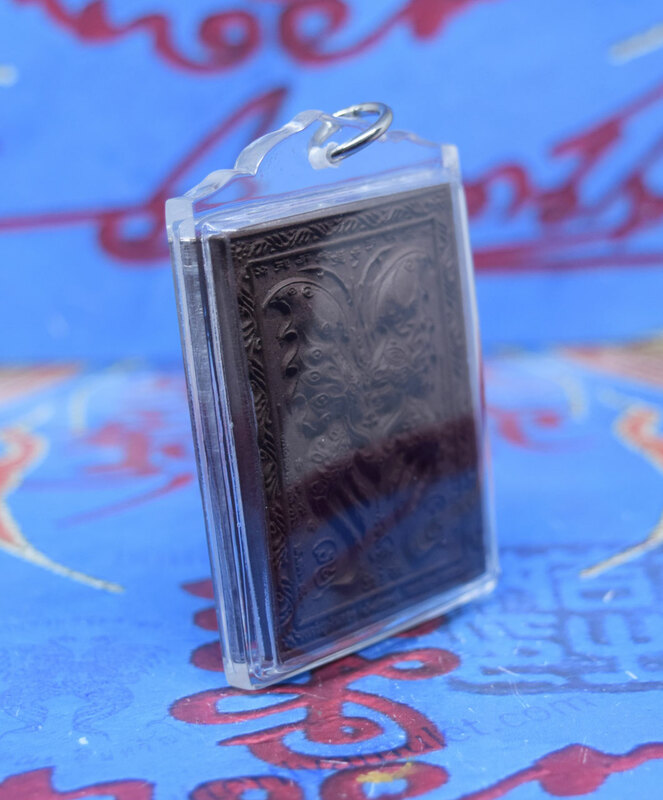 Casing is a silver handmade and waterproof. 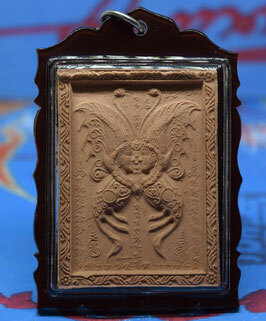 This amulet is approximately 50mm x 37mm made from brown powder and Mong dam in 2011. 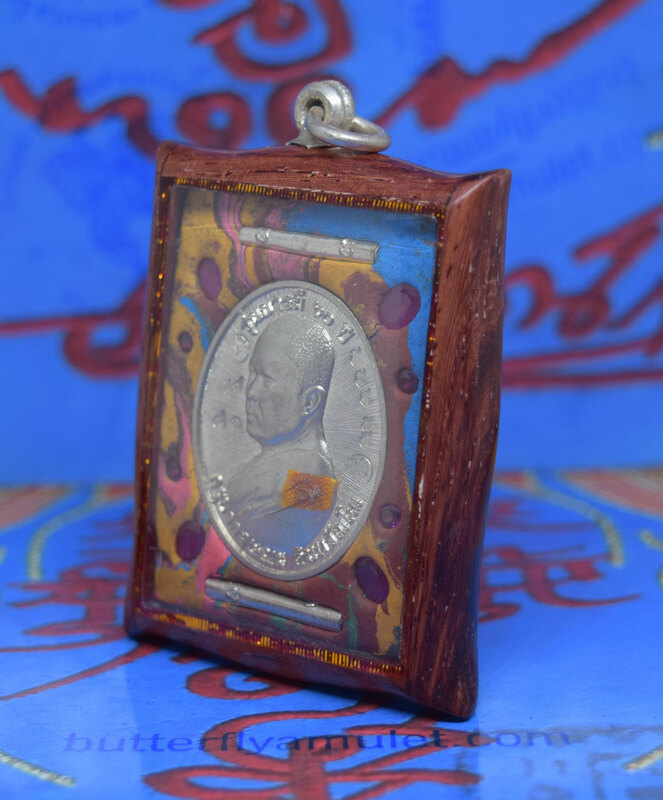 Engraved on the reverse side are forty five yant and kruba signature. 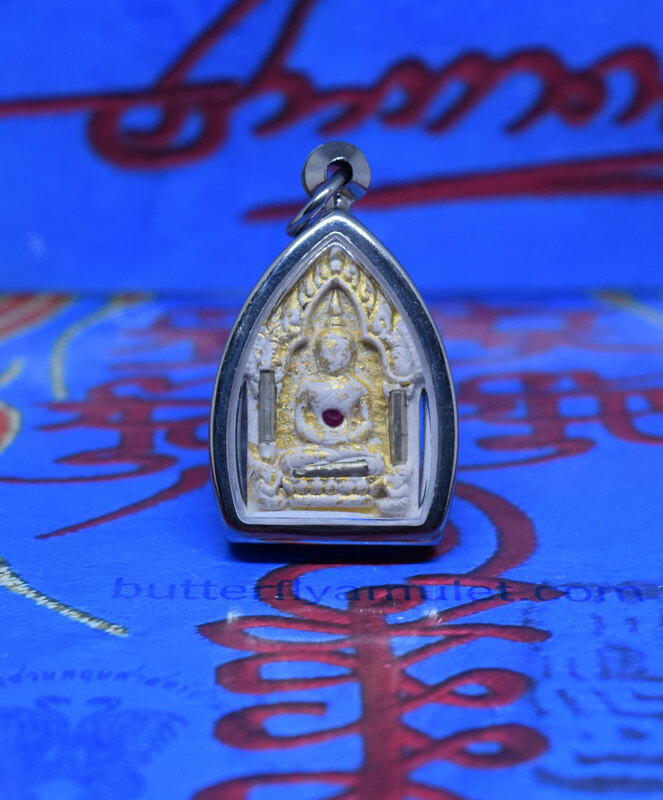 Buy Now online store Code KK55/01 for any further details on payment or shipping please contact WeChat or email. 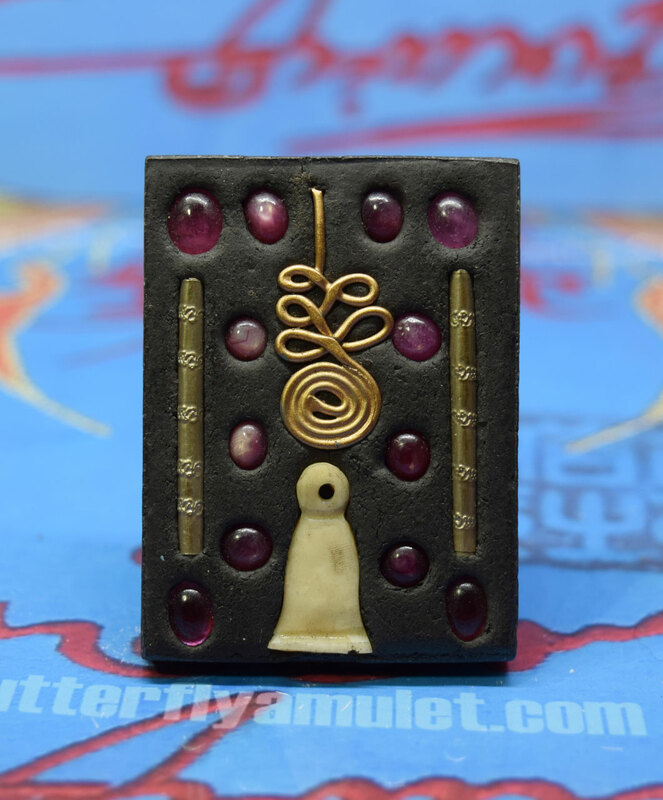 This amulet is approximately 50mm x 37mm made from black powder Mong dam in 2011. 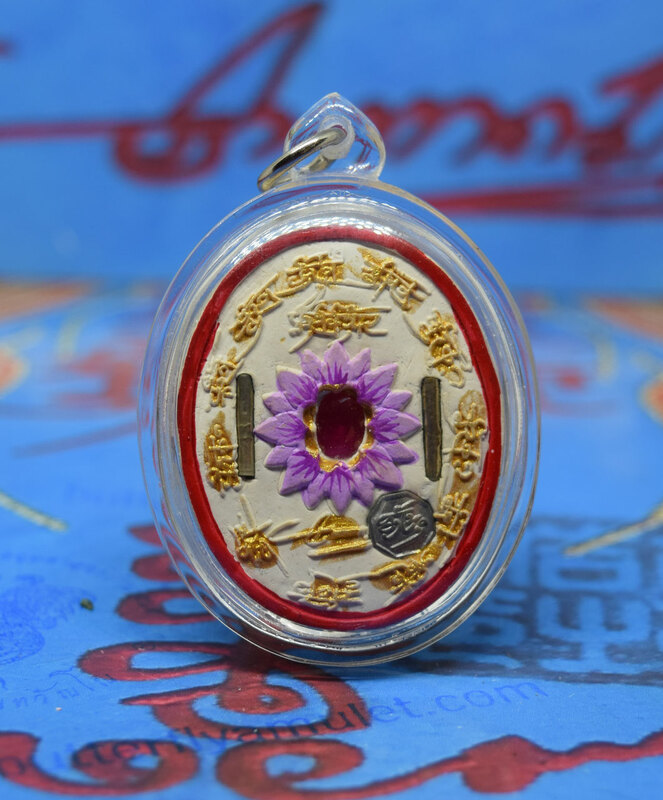 Engraved on the reverse side are sixty eight yant. 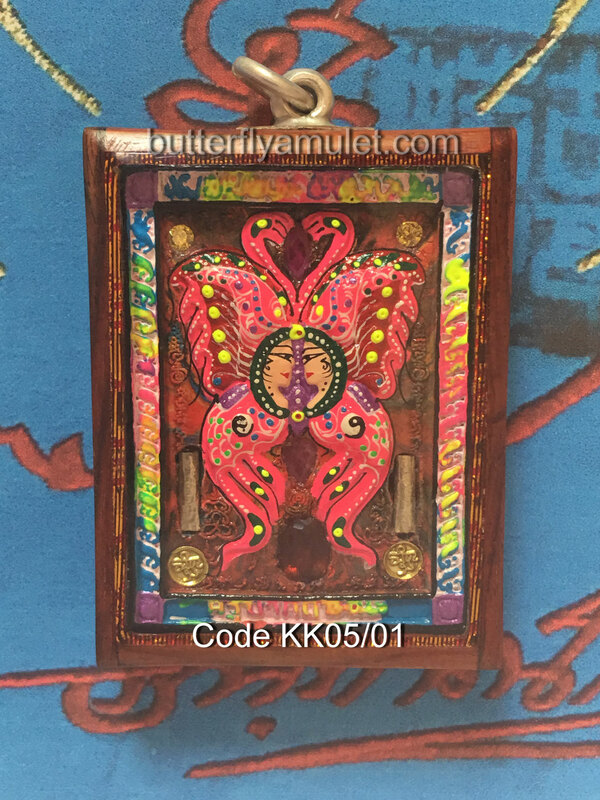 Code KK62/01 for any further details on payment or shipping please contact WeChat or email. 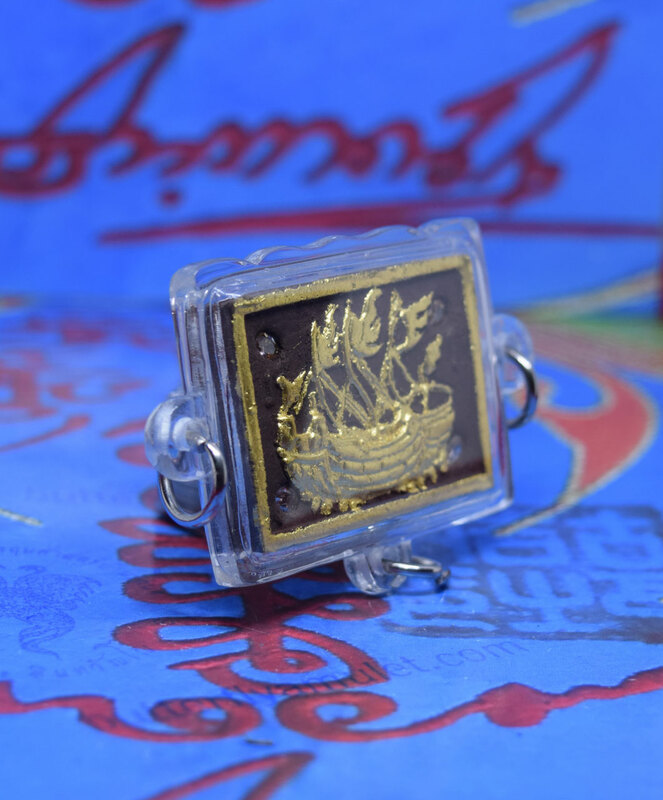 Limited Edition Fardin with gold takrats and gold Ganesha set in the reverse side. 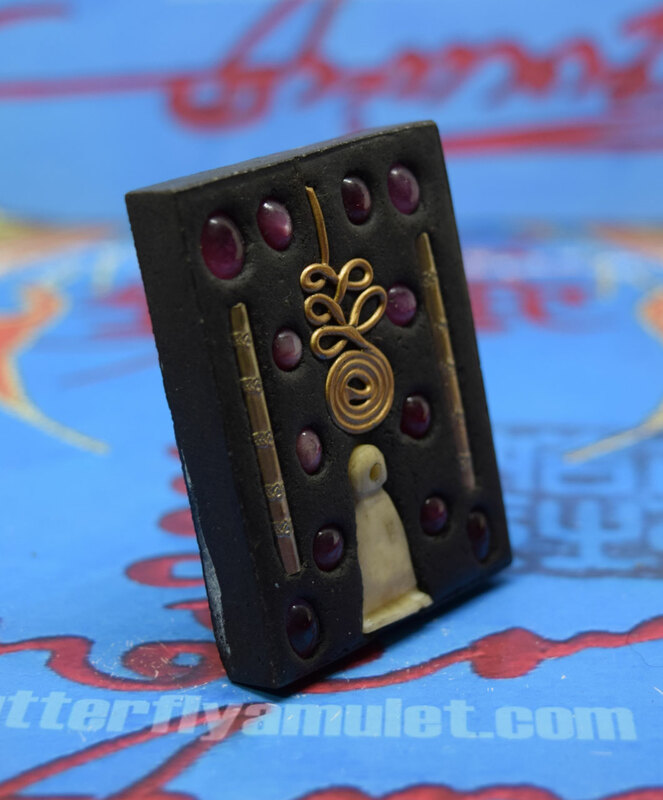 Amulet is approximately 53mm x 33mm. 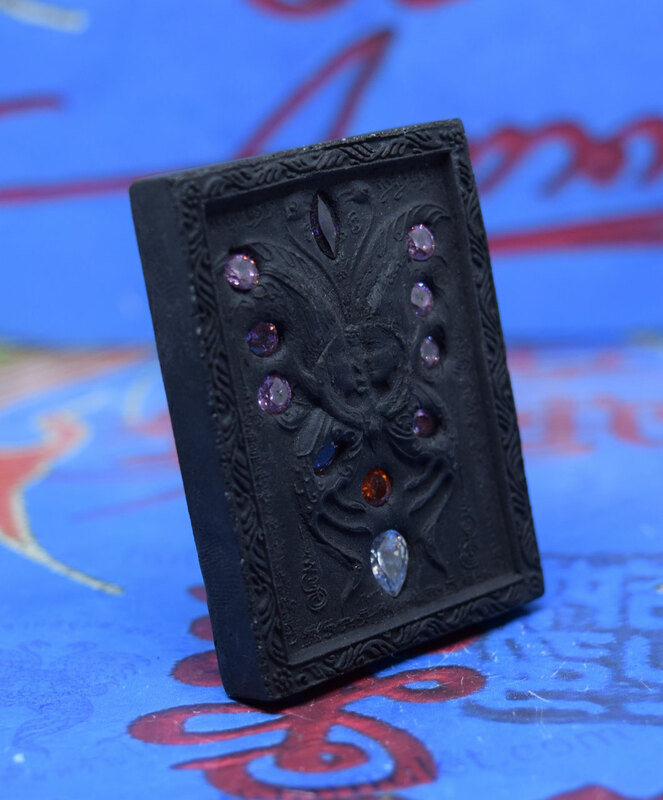 Complete with Custom made waterproof casing. Buy Now online store Code KK70/01 for any further details on payment or shipping please contact WeChat or email. Buy Now online store Code KK69/01 for any further details on payment or shipping please contact WeChat or email. 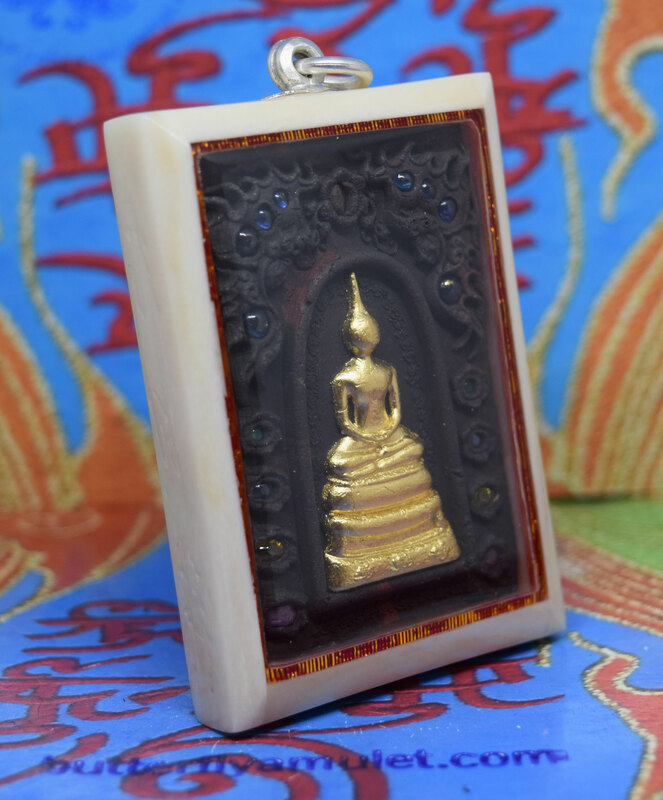 Buy Now online store Code S30/01 for any further details on payment or shipping please contact us at WeChat or email. 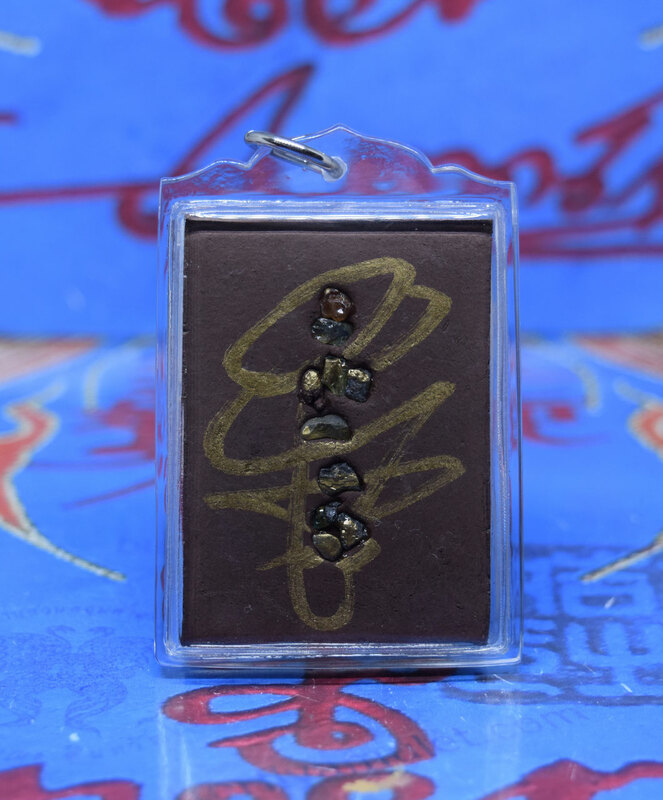 Large Turquoise Somdej made by Kruba in 2014 BE2557 approximately 70mm x 51mm x 10mm. 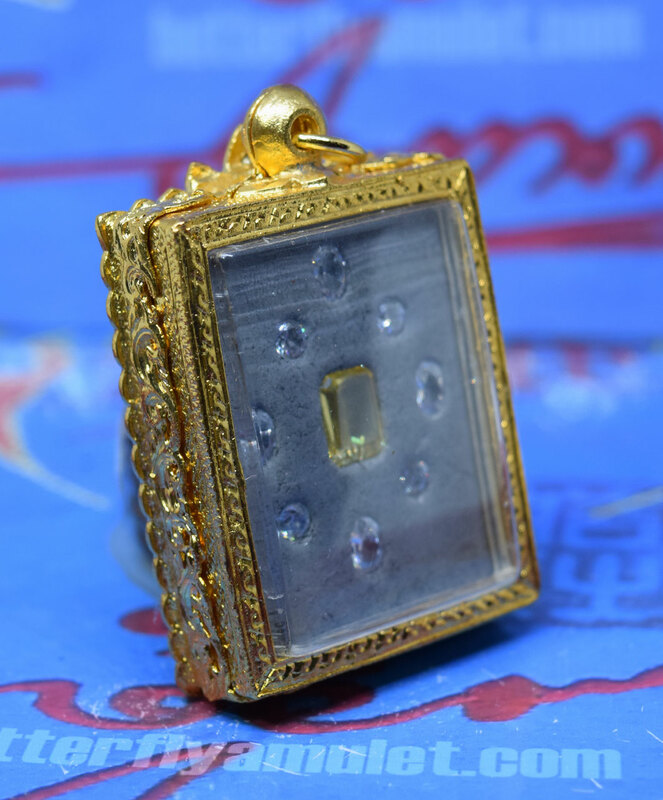 Set in the top edge and corners of the somdej are eleven sapphires. 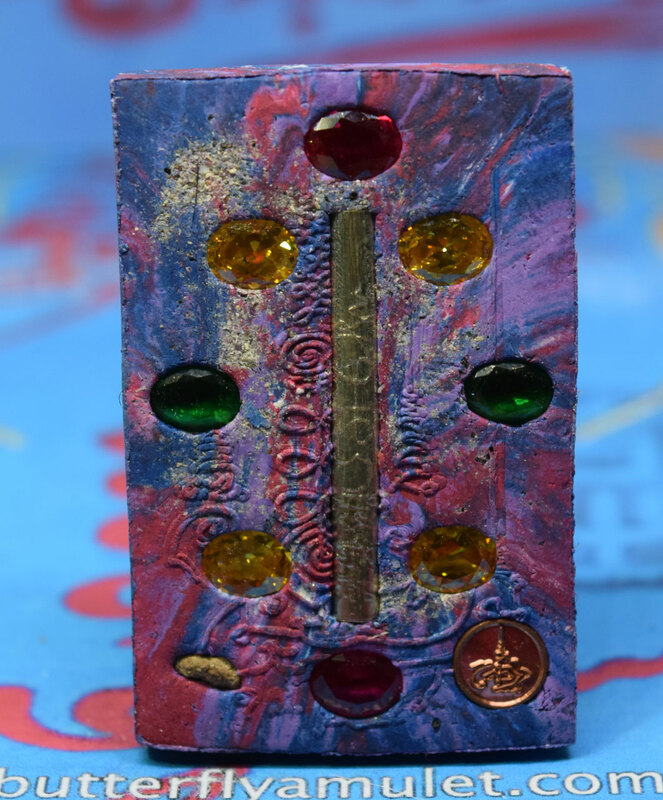 Set around the butterfly five red, three green a blue gem and a further six gems on this edge. 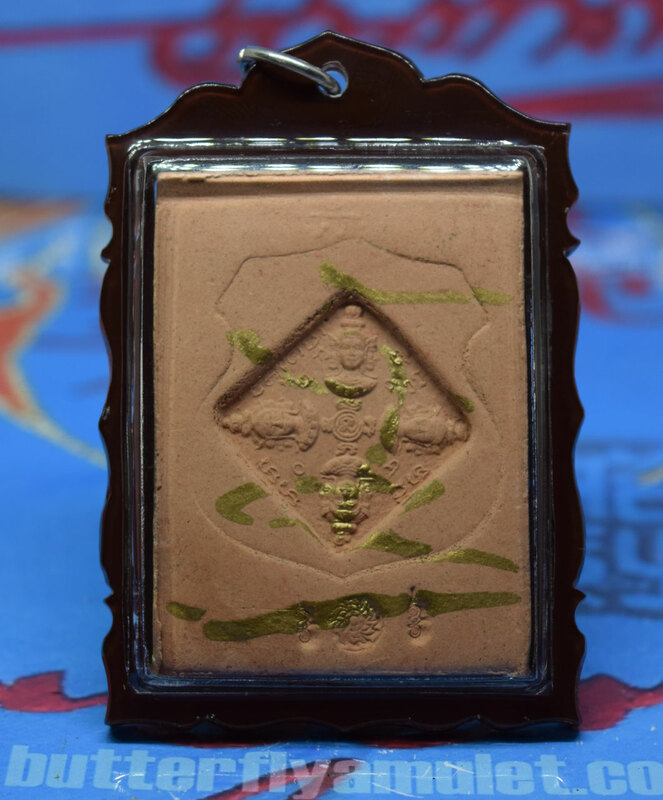 Engraved Yant on edges and signed by Kruba. 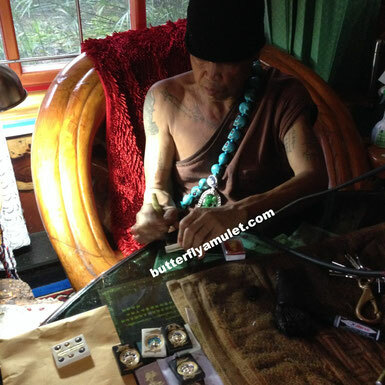 Turquoise is perhaps the oldest stone in man's history, the talisman of kings, shamans, and warriors. It is a stone of protection. 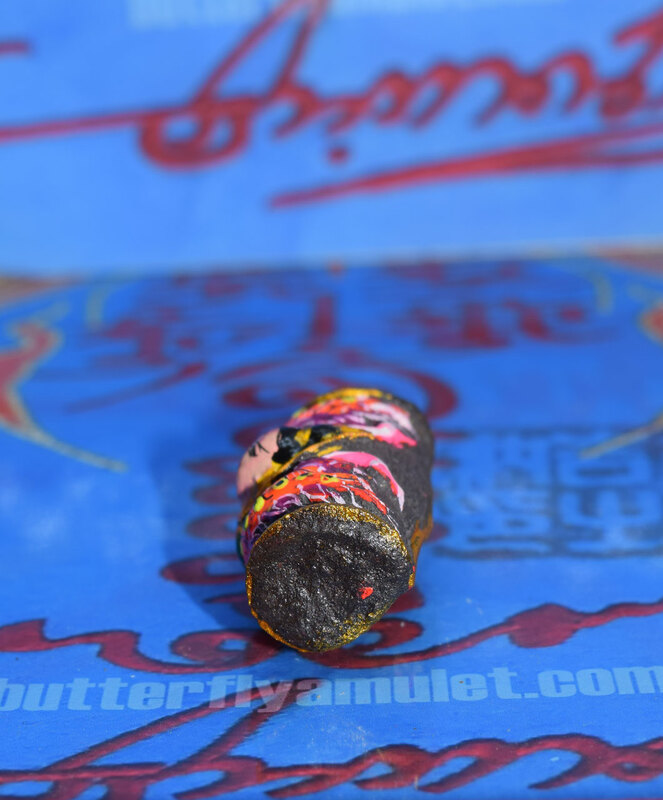 Buy Now online store Code KK18/01 for any further details on payment or shipping please contact WeChat or email. 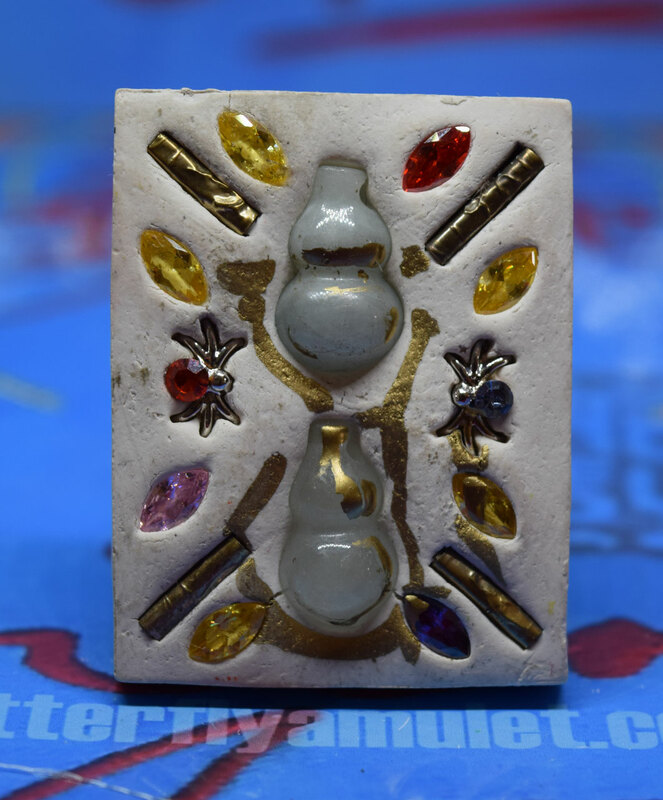 Amulet is approximately 60mm x 39mm MADE BY KRUBA in 2014 BE2557 as a sample block from black powder from powder used in mong dam. 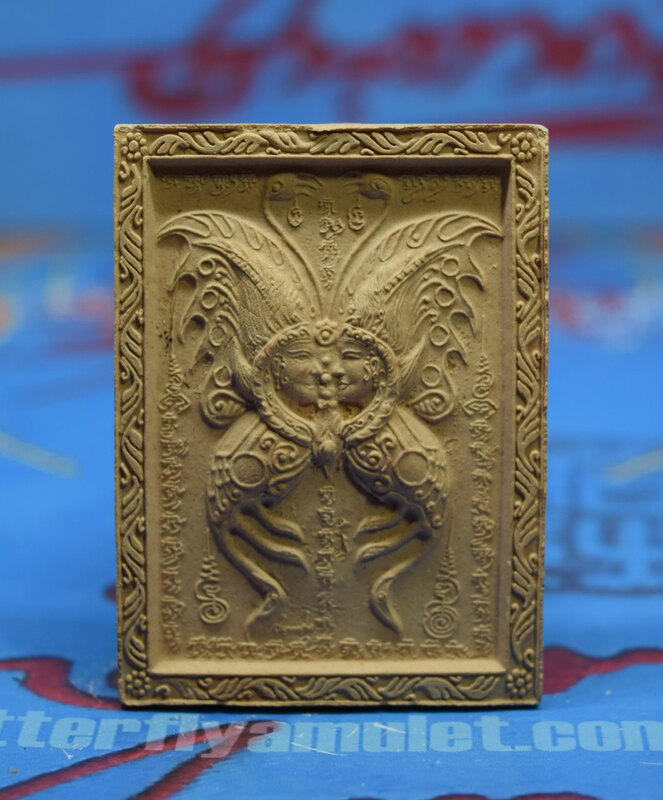 Gold takrat. 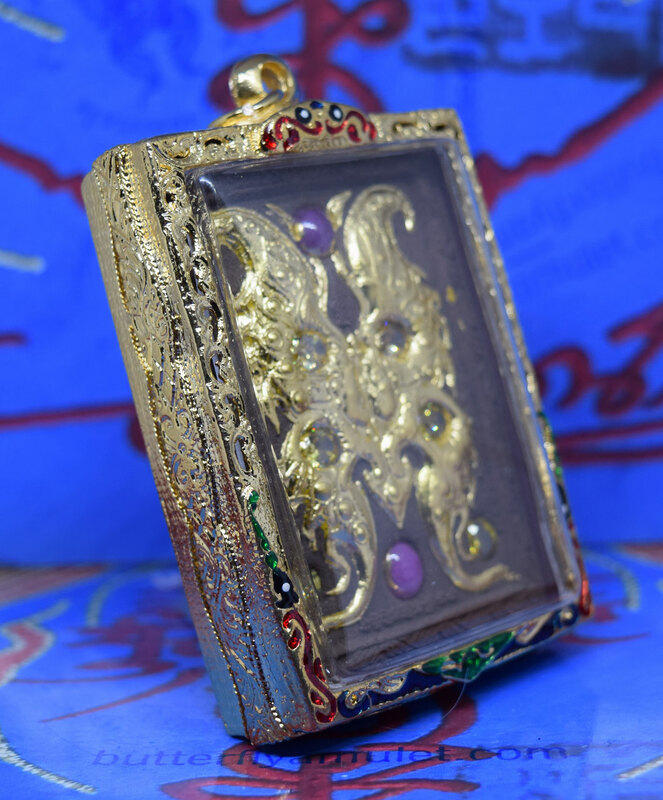 Custom casing available with this amulet. 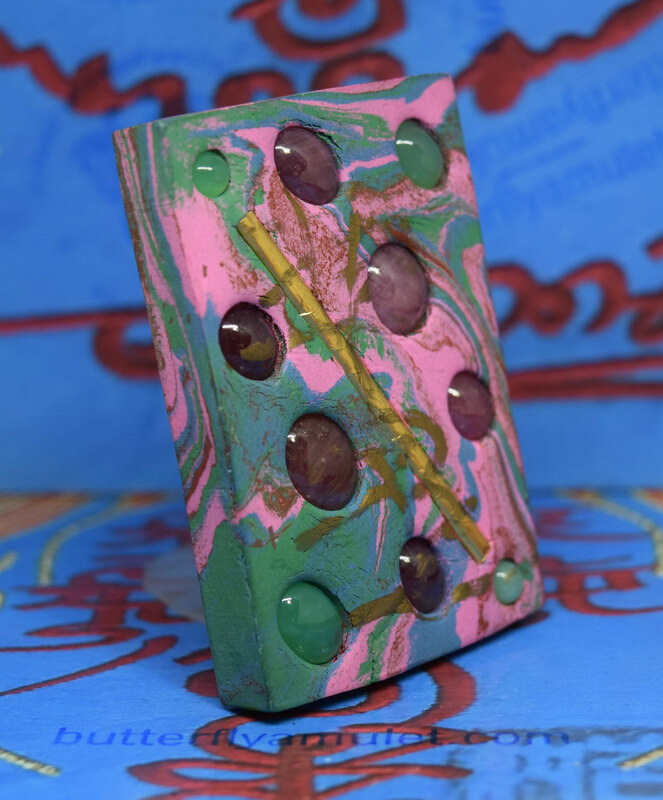 Special amulet, a sample Block made in 2016 BE2558 by Kruba. 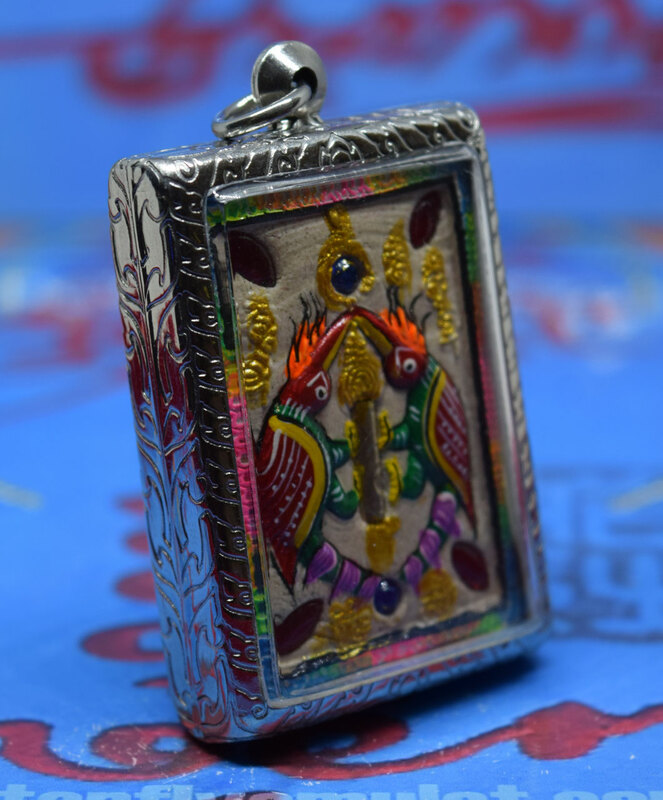 The amulet is approximately are 60mm x 40mm.Set around Vishnu three gold takrats reverse side a Yang with two large moon stones with gold and silver, across the centre three sapphires. 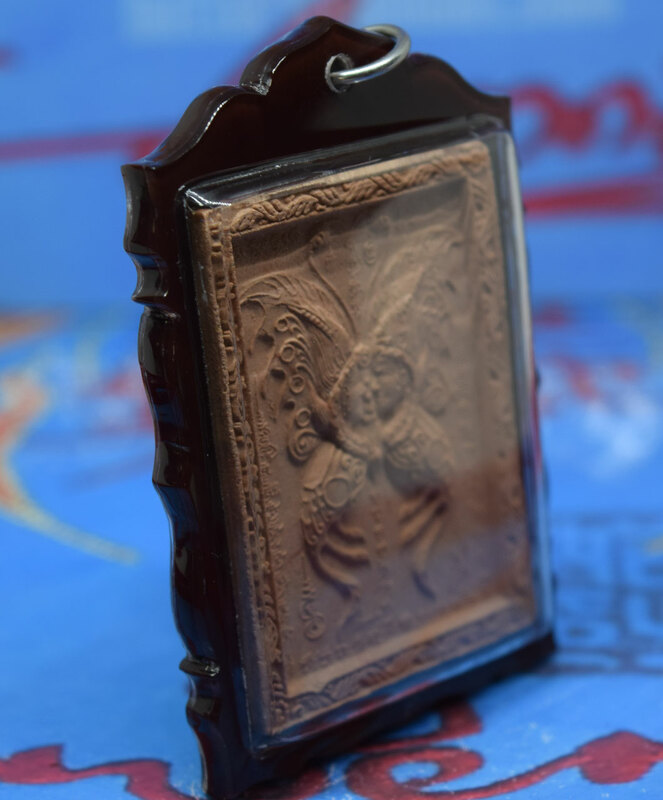 Handmade waterproof casing made from hardwood. 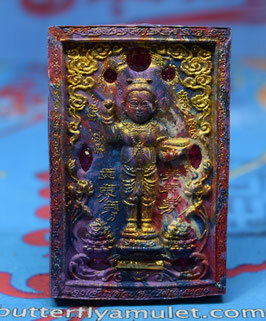 Vishnu holding a padma (lotus flower) in the lower left hand, the Kaumodaki gada (mace) in the lower right hand, the Panchajanya shankha (conch) in the upper left hand and the discus weapon Sudarshana Chakra in the upper right hand. 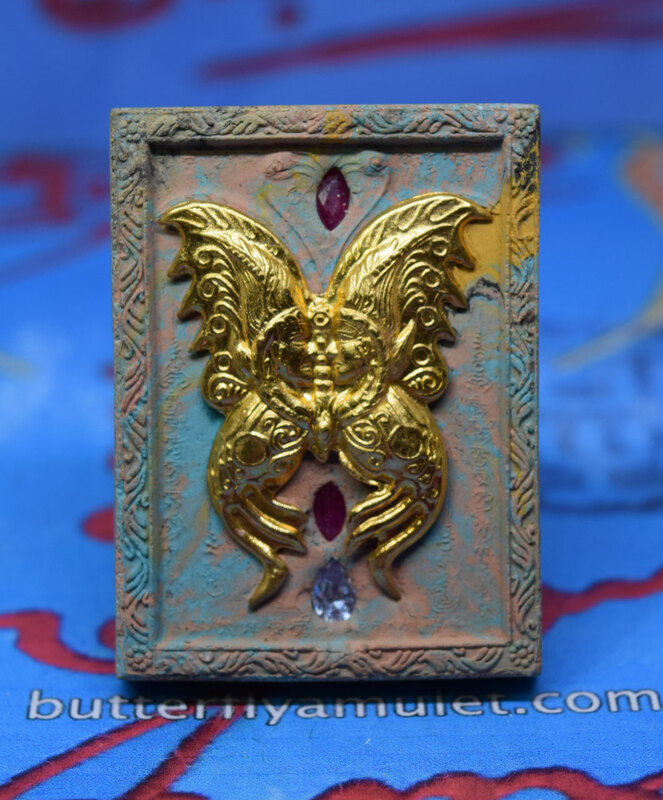 This amulet is made from beige powder in . 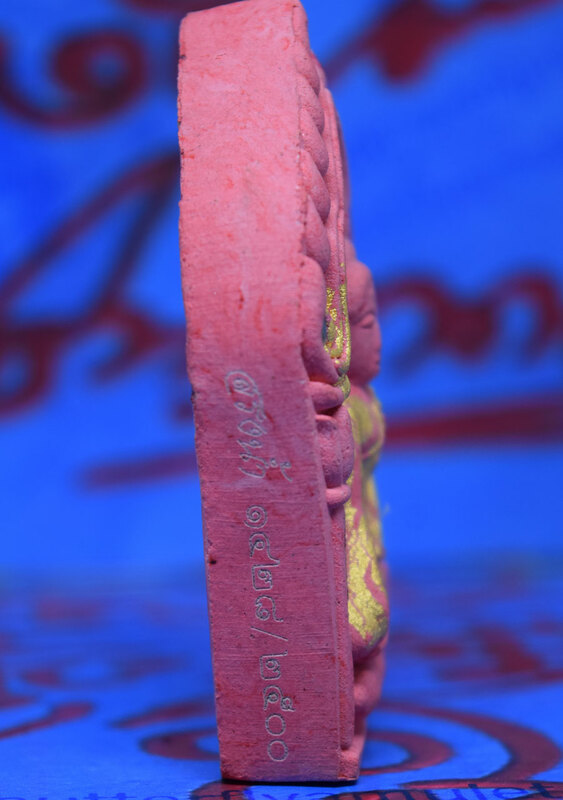 On the left side Kruba signature. 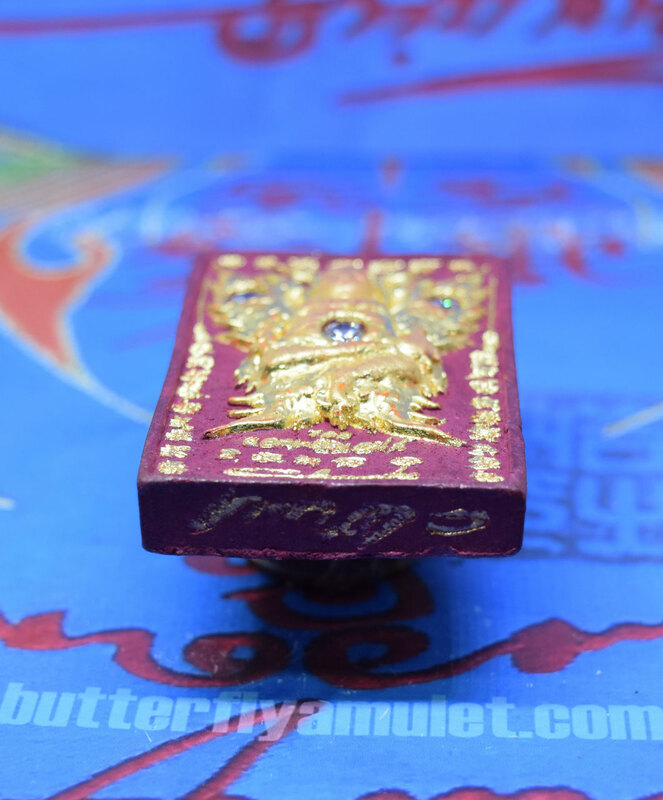 Gold takrat and five gems set in around the butterfly, set on the reverse side a total of nineteen gems with temple seal. 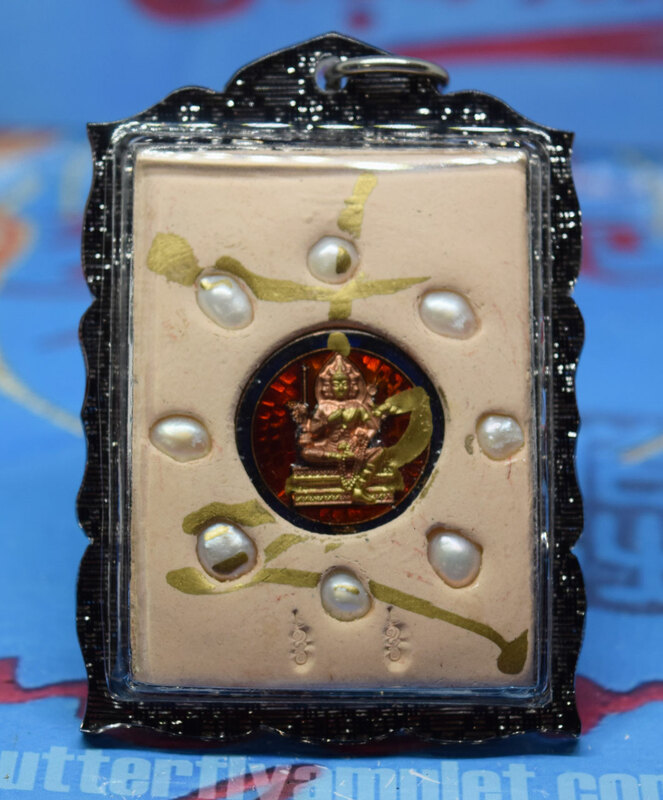 Buy Now online store Code KK56/01 for any further details on payment or shipping please contact WeChat or email. 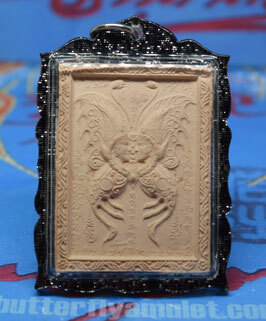 Somdej direct from Kruba made from black powder with Kruba hairin BE2558. 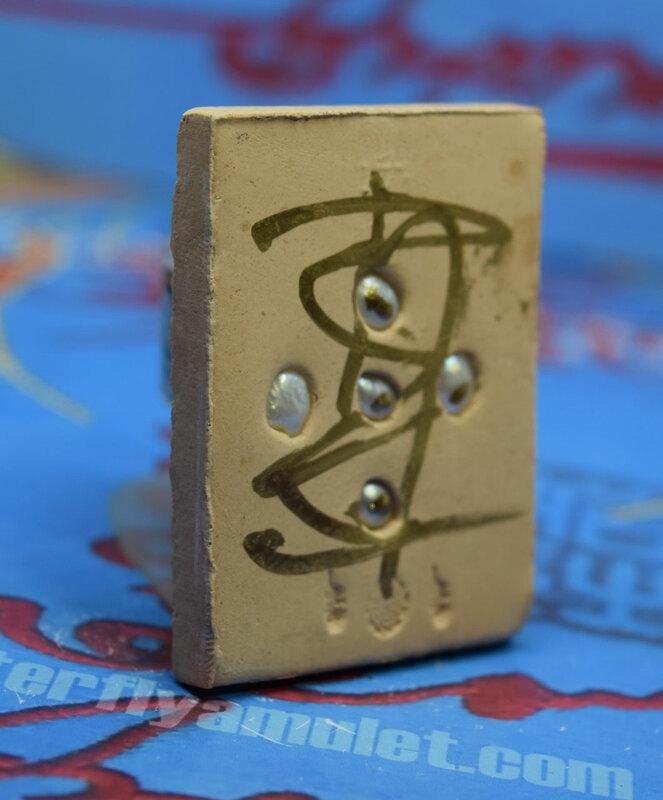 Approximately 55mm x 37mm. 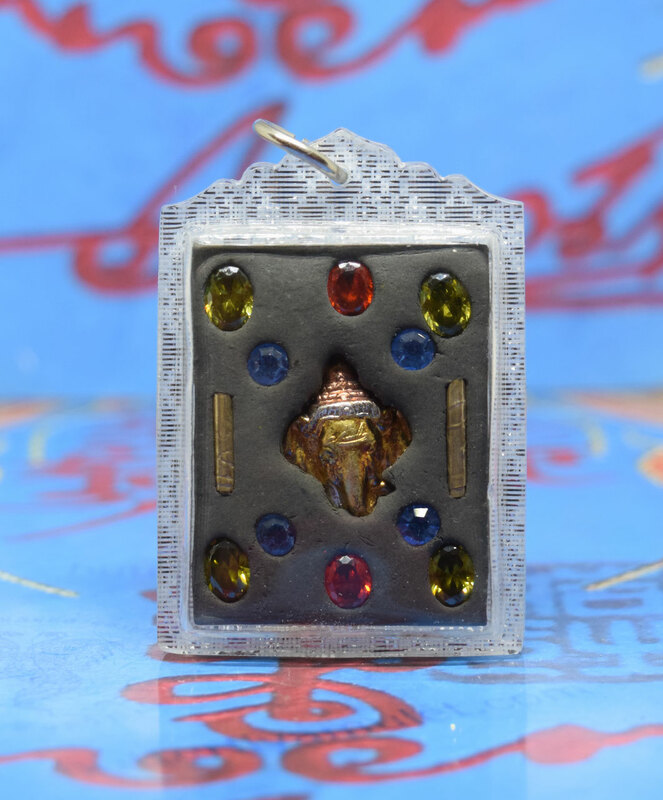 Set around somdej nine gems and a gold takrat. 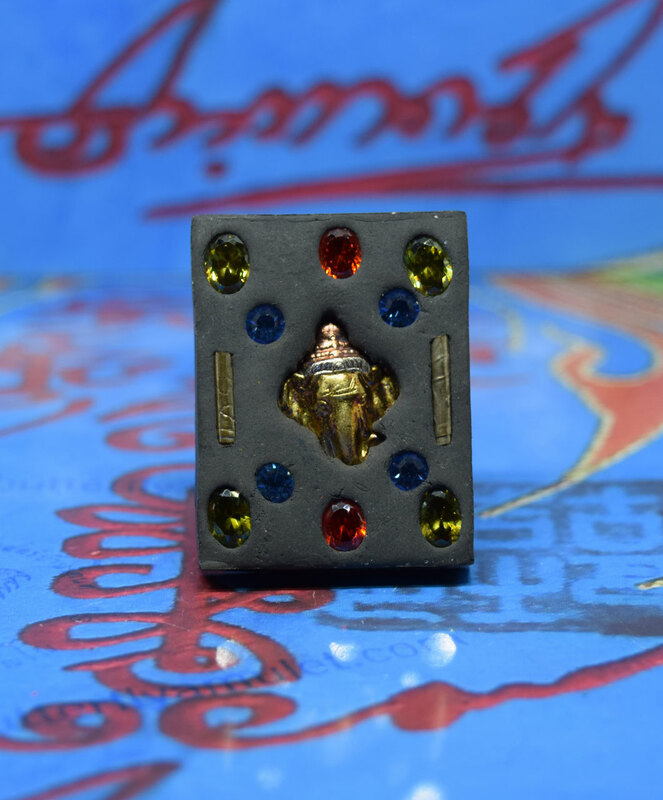 On the reverse side eight gems and two gold takrats. 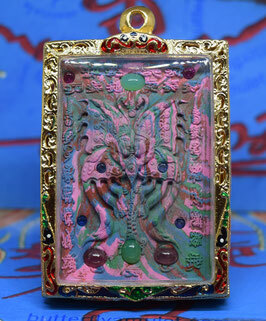 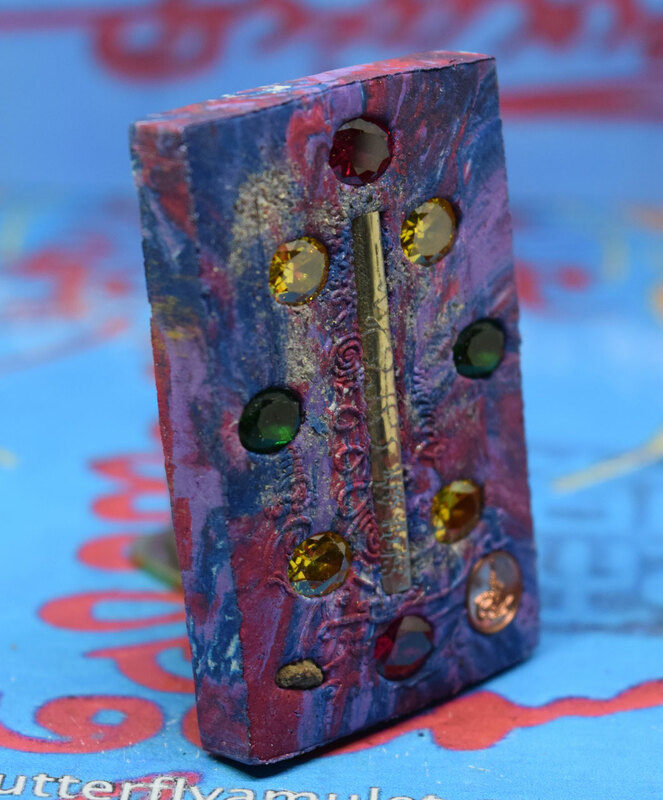 Limited Edition made personally by Kruba as a sample block. 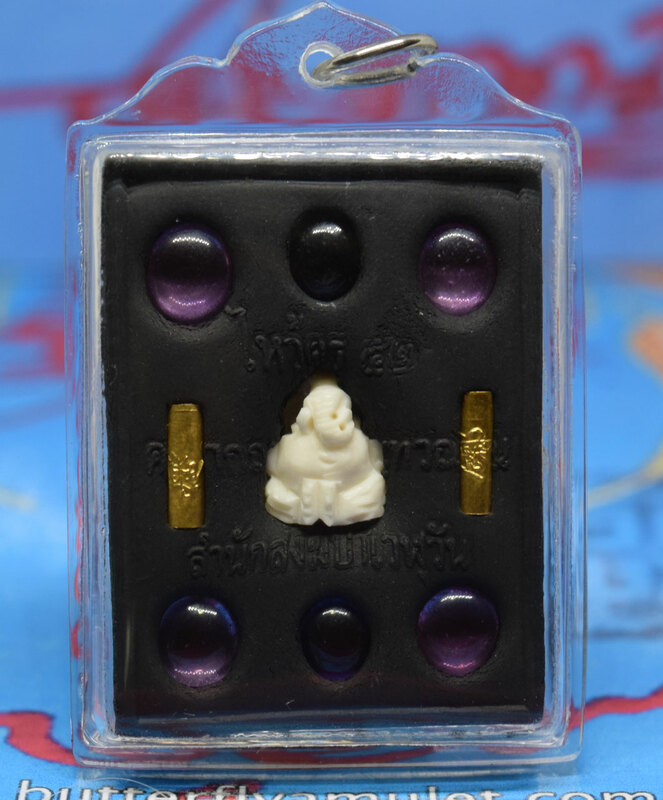 Khun Paen are approximately 47mm x 29mm made from black powder in 2017 (BE2558).Set in the back four gems stones overlay with two takrat with temple seal. 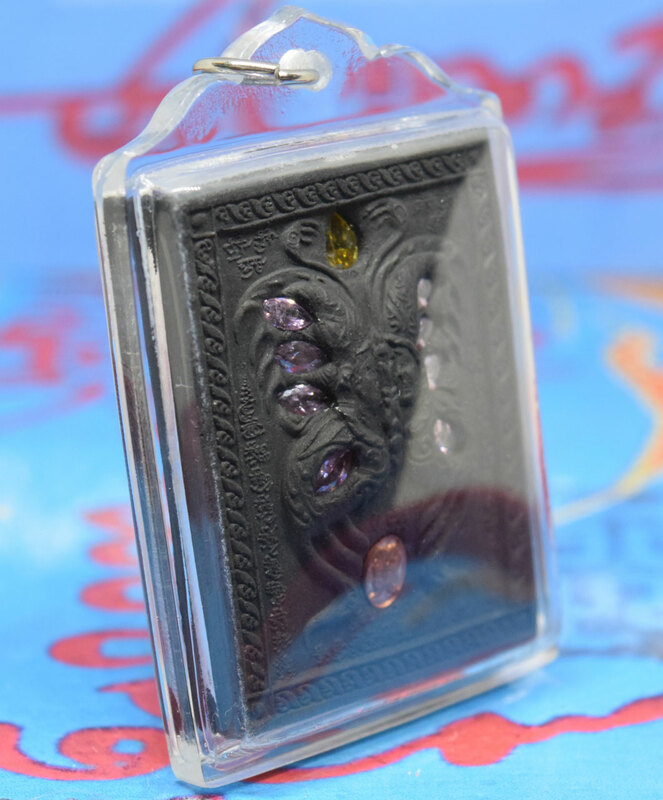 Final Price includes shipping and casing. 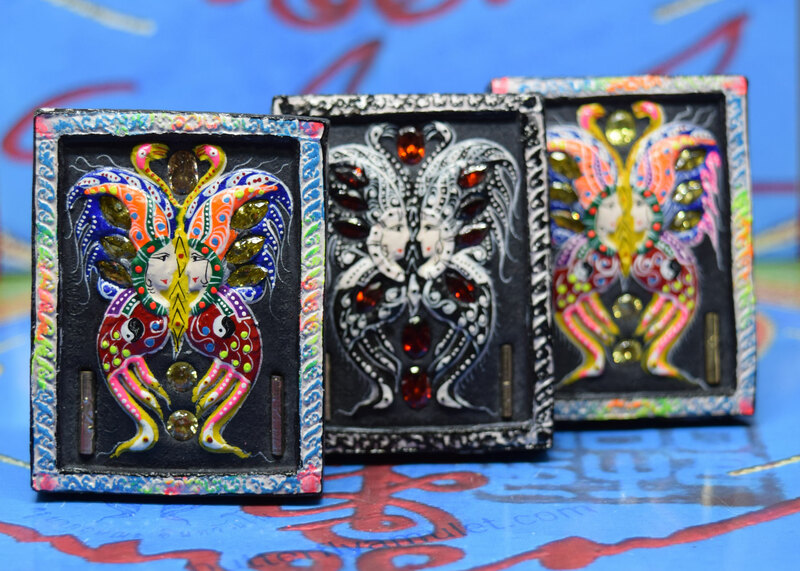 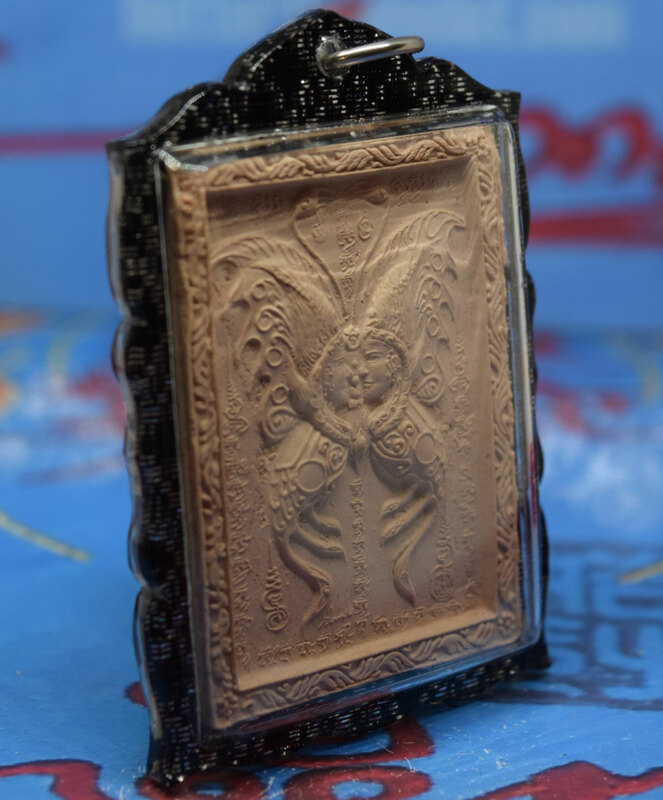 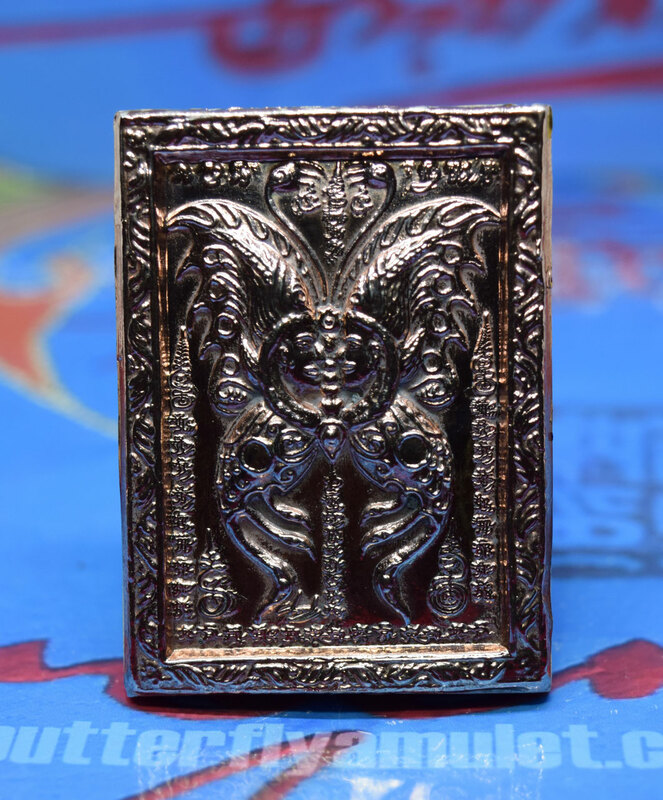 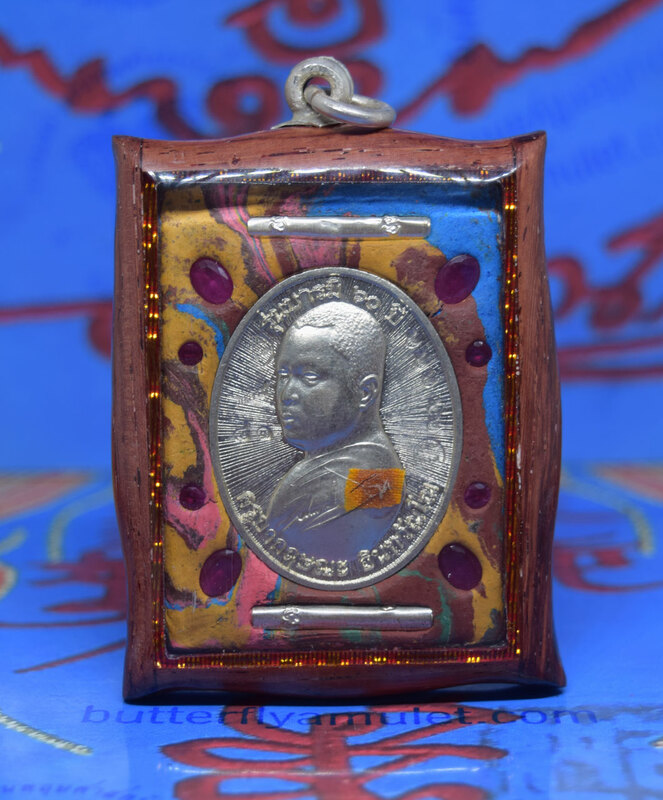 A special Khun Paen approximately 60mm x 37mm made from dark powder in 2013, BE2555 Set in the reverse side silver butterfly takrat, with engraved Yant. 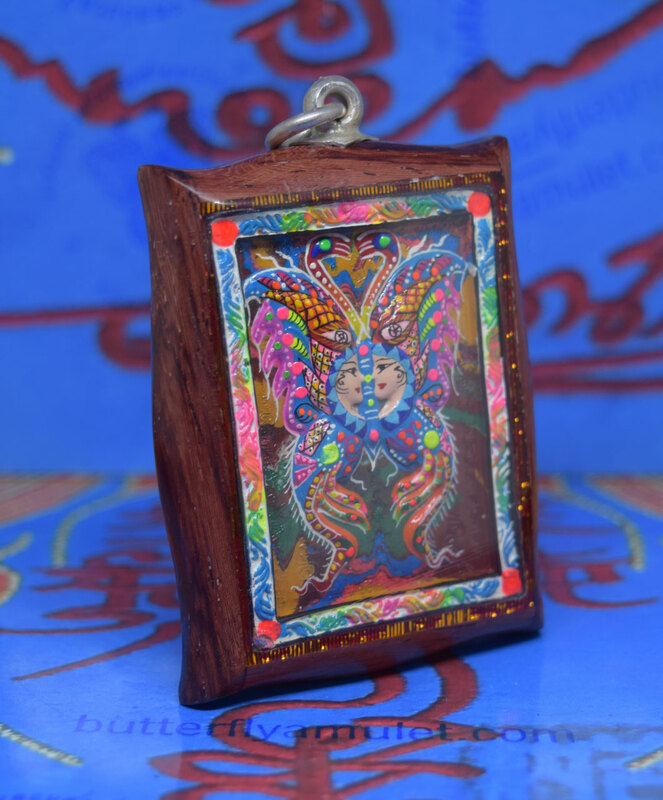 Custom handmade waterproof casing made from polished hardwood, engraved on the face by Kruba . 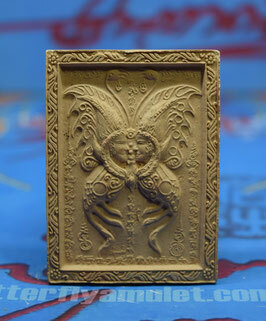 Block B Amulet is approximately 54mm x 41mm made from a beige powder. 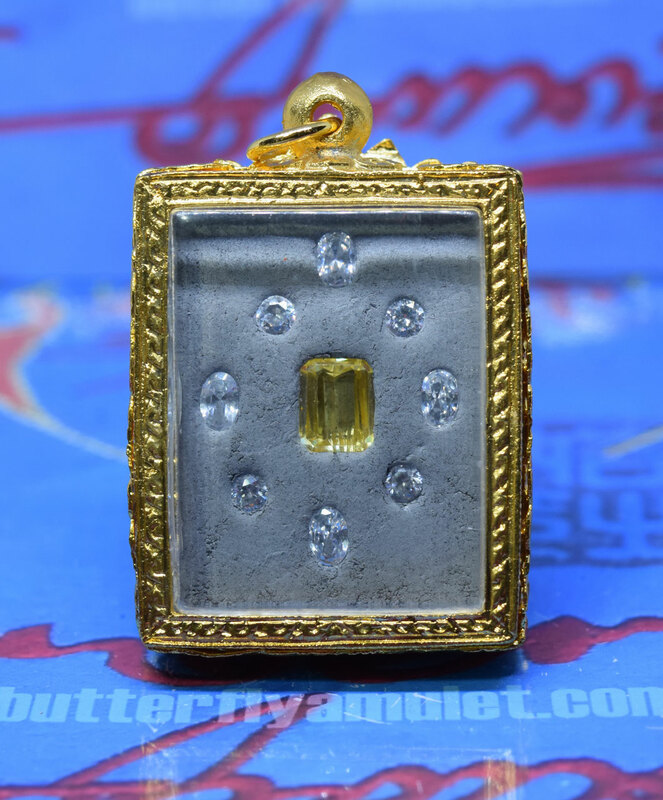 On the reverse side a single gems stone. 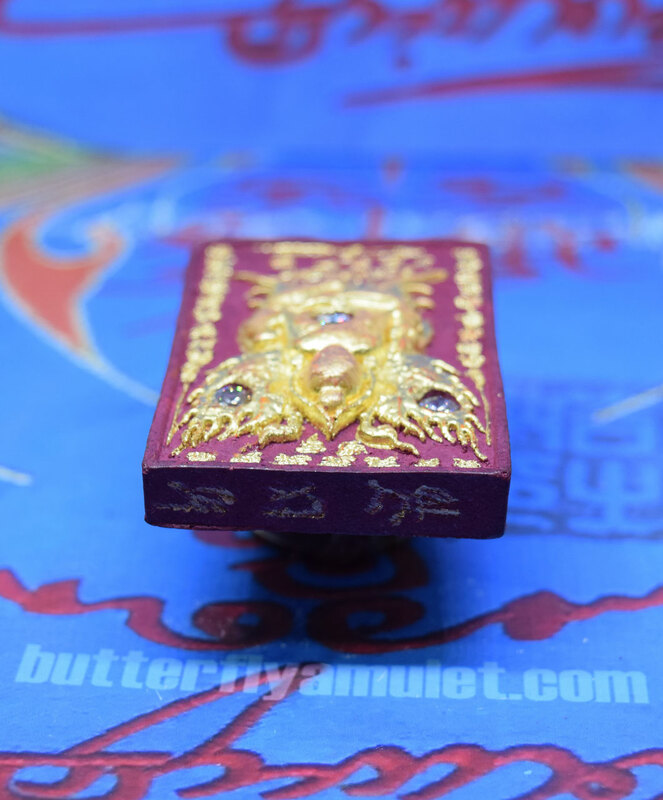 Buy Now online store Code KK40/01 for any further details on payment or shipping please contact WeChat or email. 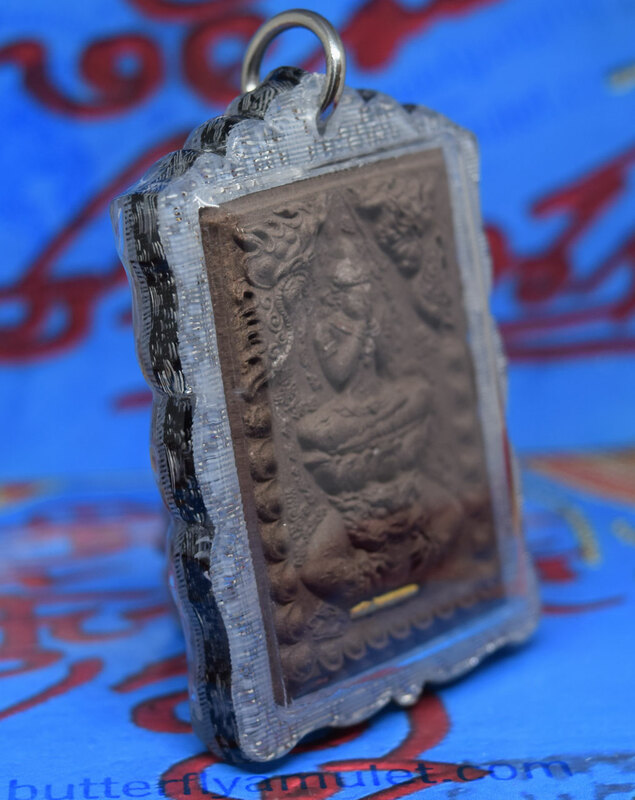 Amulets are approximately 50mm x 42mm made from black powder in 2015, BE2557. 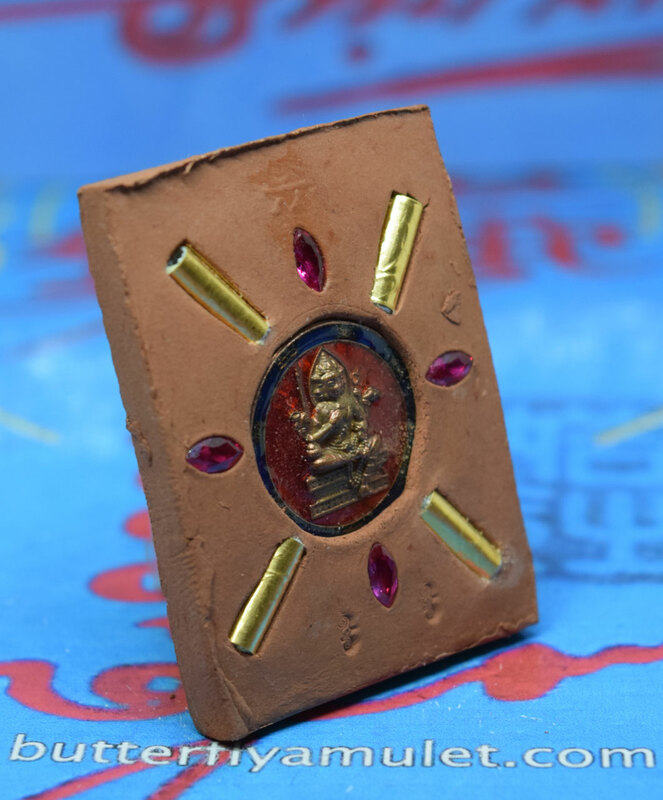 Hanuman Deity to get rid or win over demons. 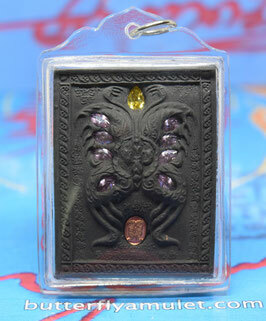 Amulet Price - 2500THB Final Price includes shipping. 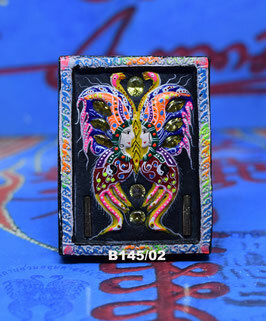 Please contact or email stating code number B31/01 for payment/shipping details. 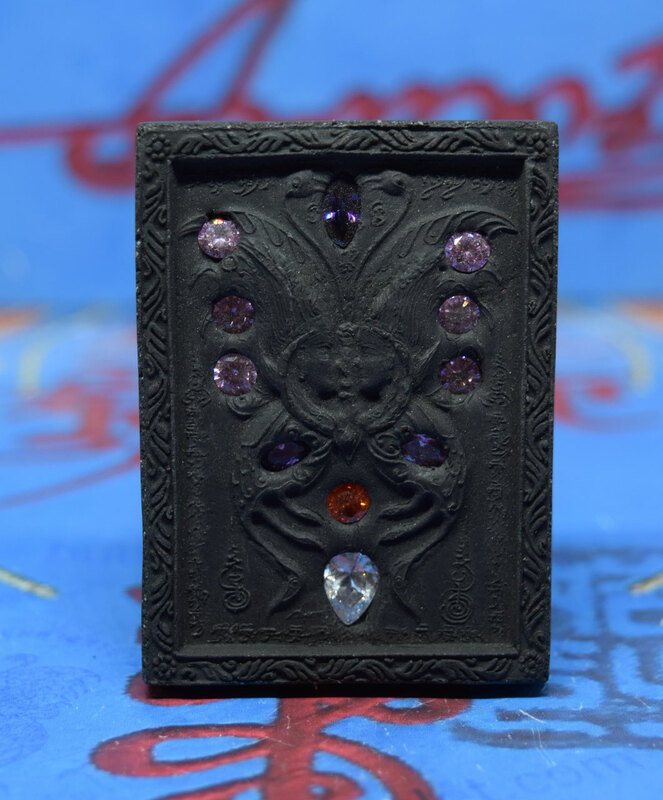 Amulet approximately 47mm x 47mm made from various powders in BE2557.Set in the front four gems and two takrats , two gems set in the back. 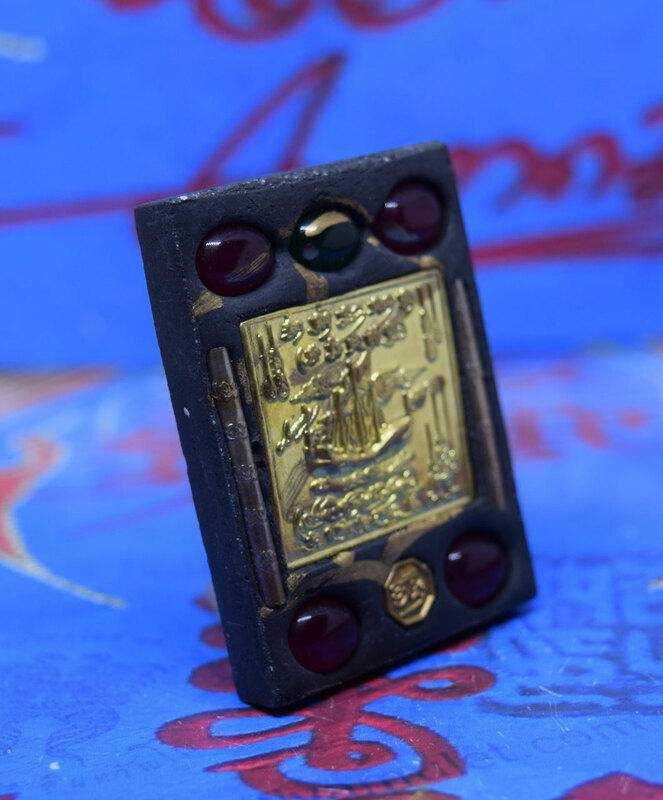 Complete with casing. 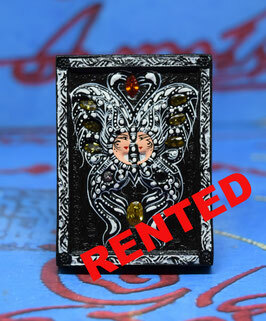 Please contact or email stating code number for payment/shipping details. 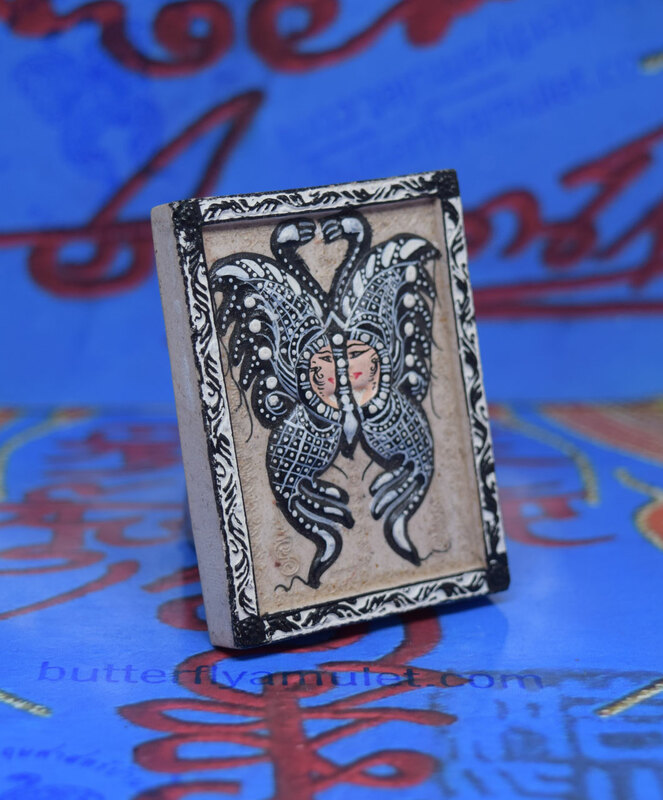 This amulet is approximately 42mm x 35mm made from white powder in BE2557 2014 . 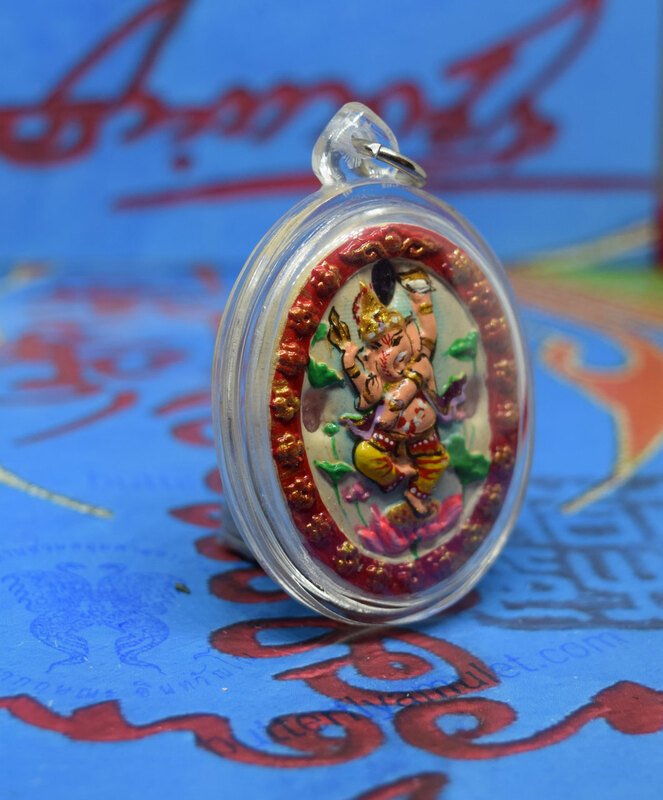 Set around Ganesha eight coloured gems and six clear gems on the outer edge . 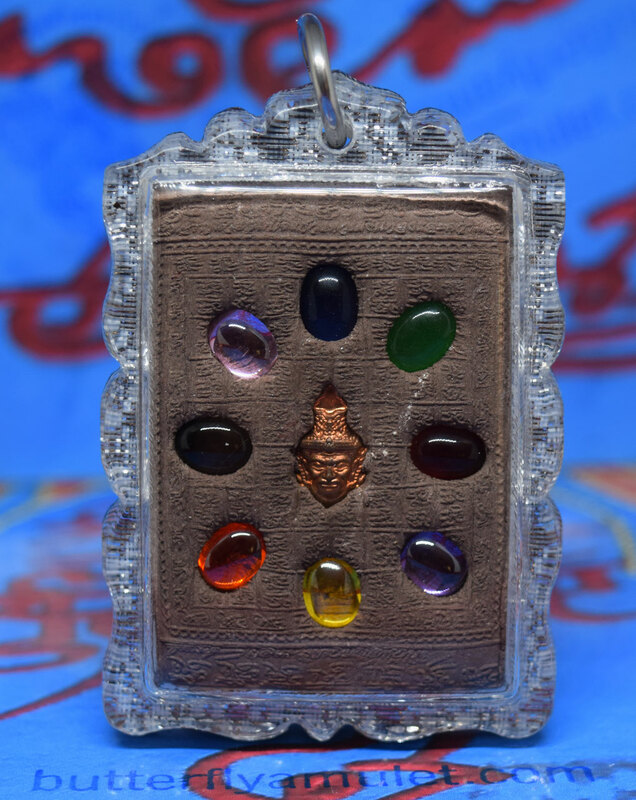 The reverse side have a circle of eight gems with one in the middle . 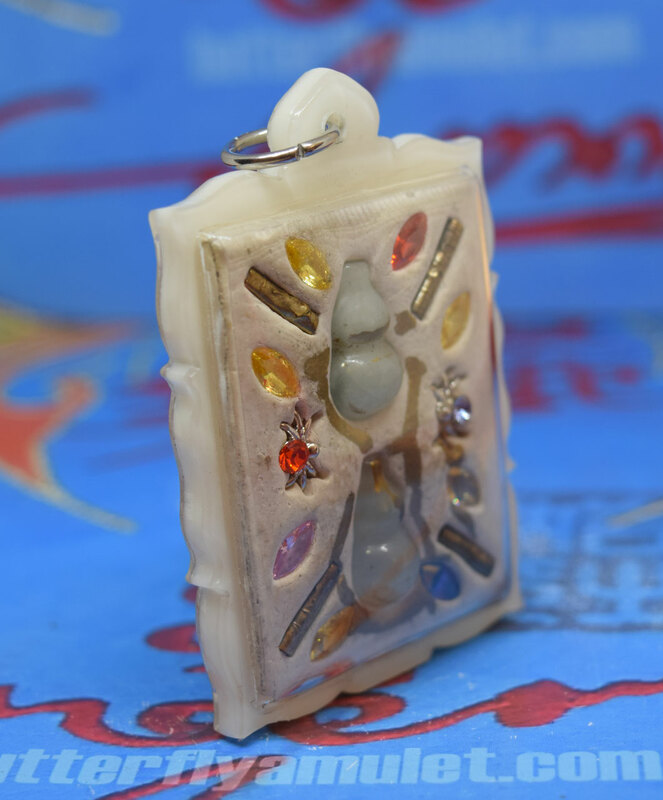 Complete in waterproof casing and adjustable necklace . 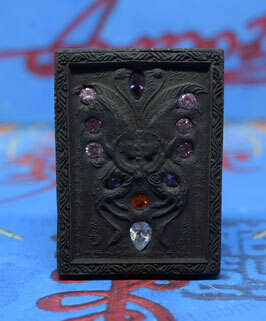 Amulet approximately 47mm x 47mm made from various powders in BE2557. 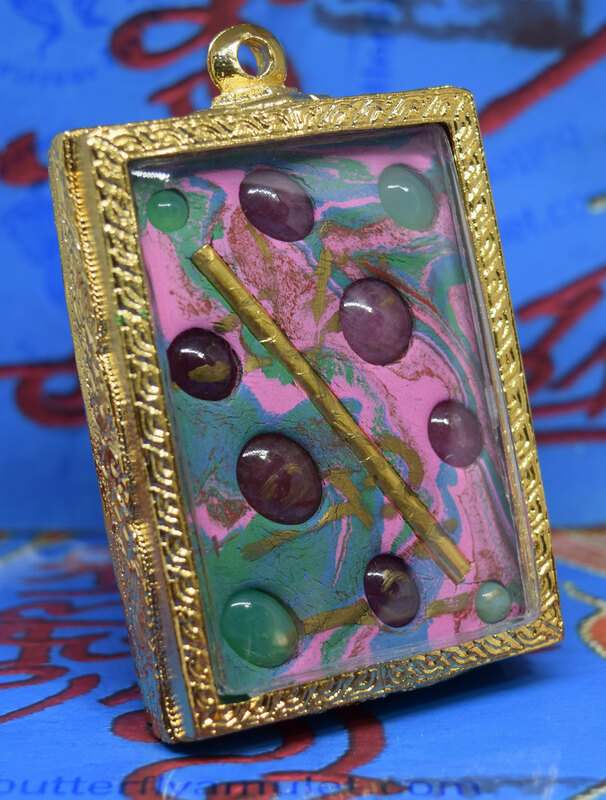 Gems set in the back. 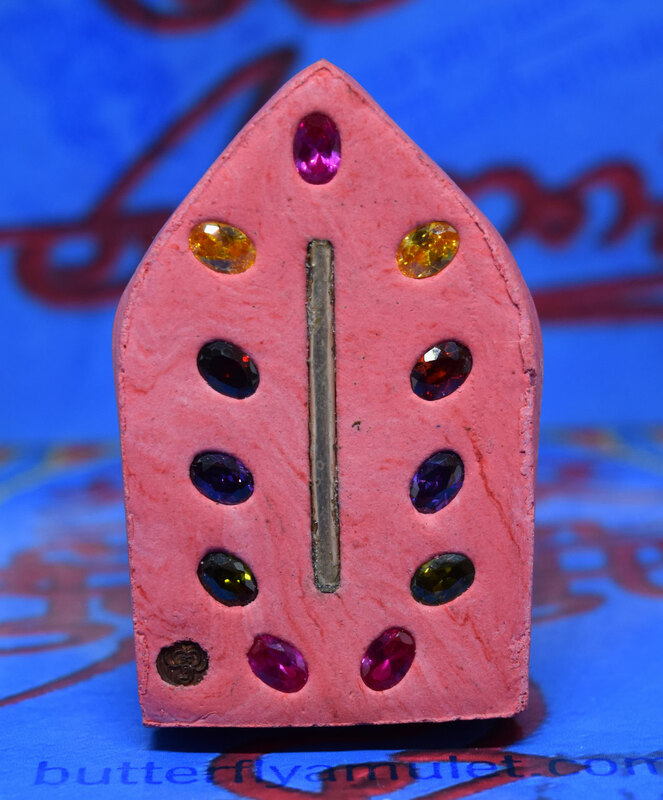 Amulets are approximately 40mm x 32mm made from pink/white powder in 2014, BE2557.Set in the front 7 gems and a takrut, set in the back 4 gems and the crocodile deity. 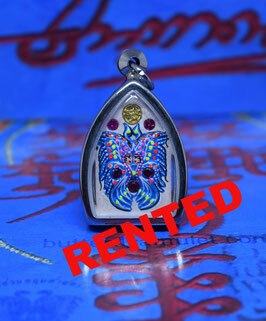 Please contact or email stating code number B23/01 for payment/shipping details. 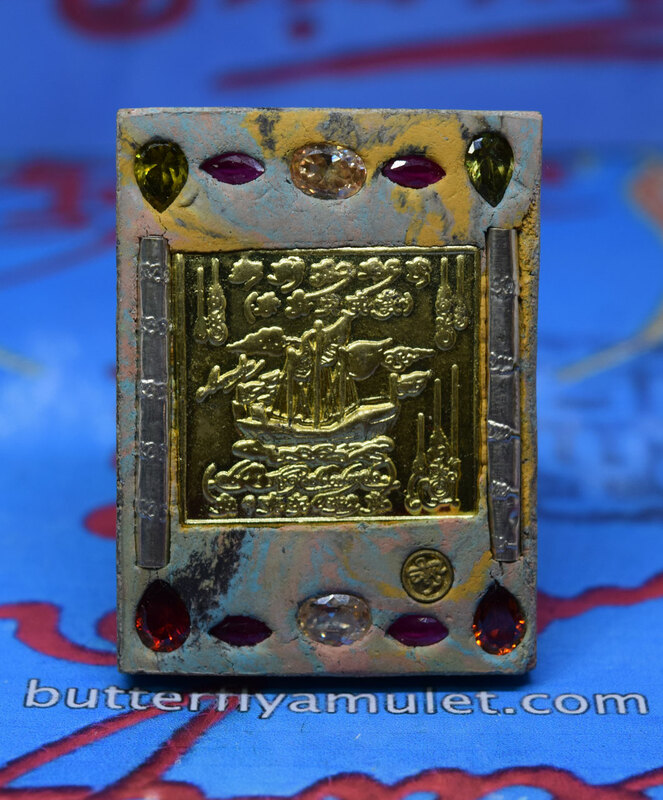 Amulet are 50mm x 40mm made from powder made in 2557BE 2014.